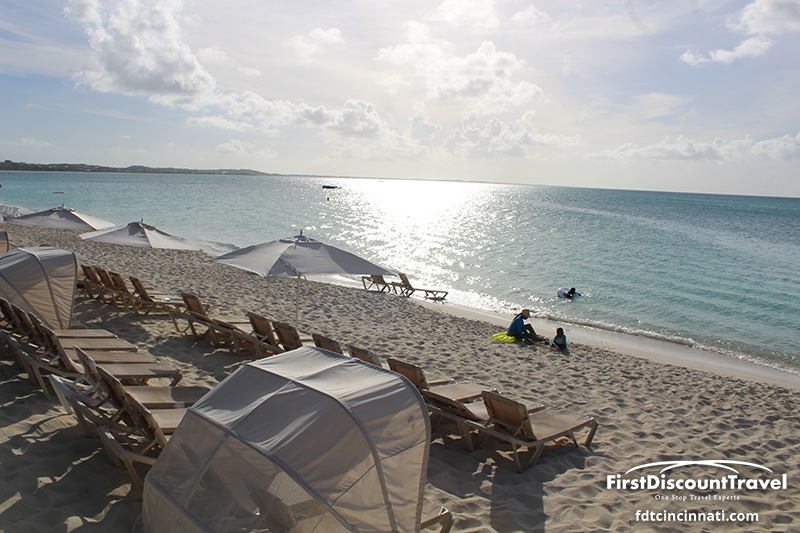 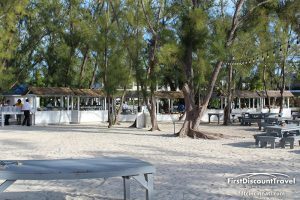 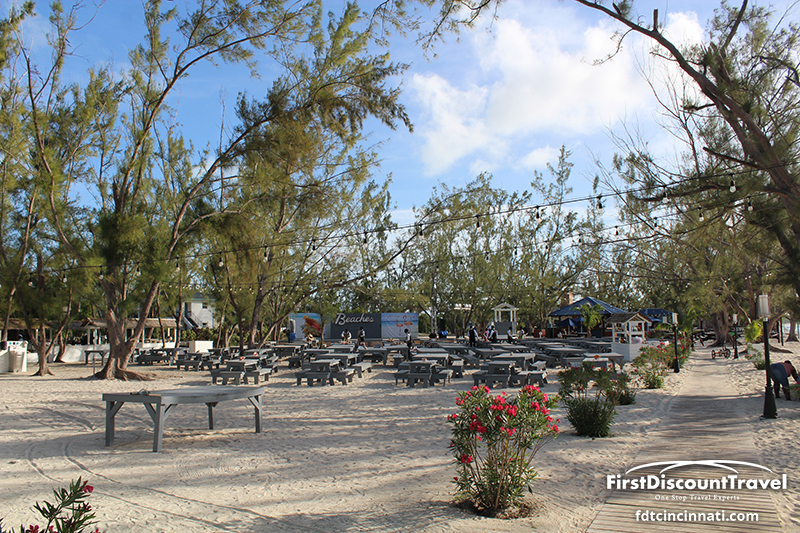 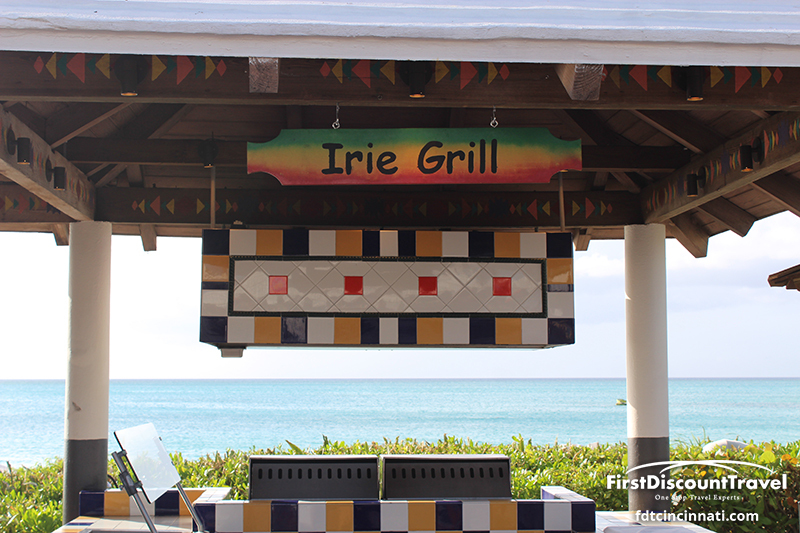 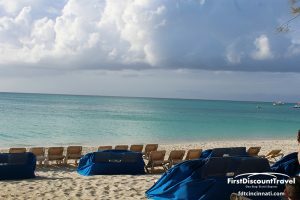 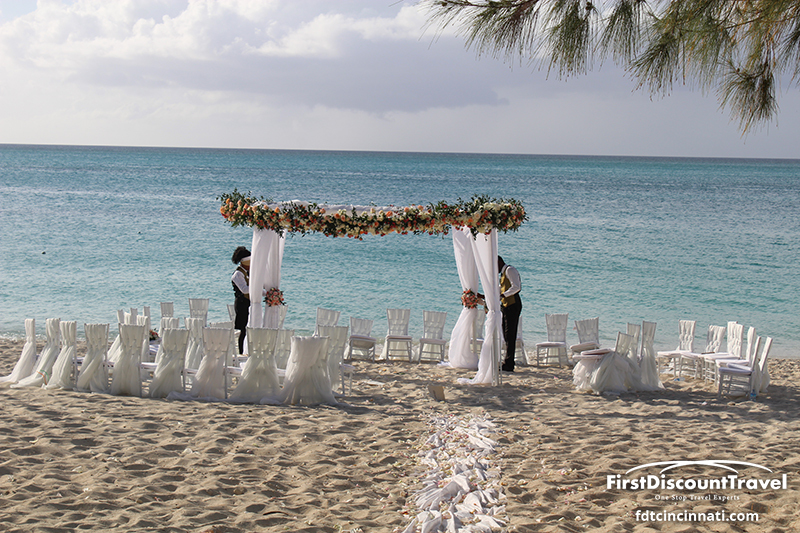 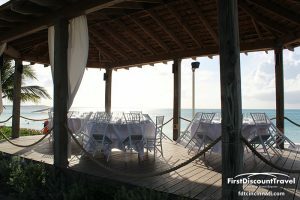 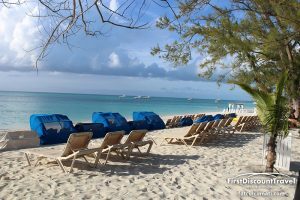 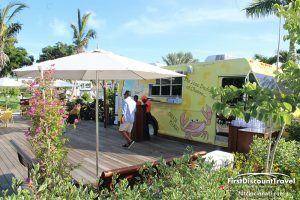 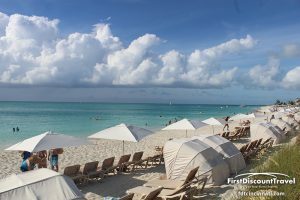 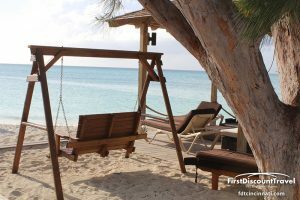 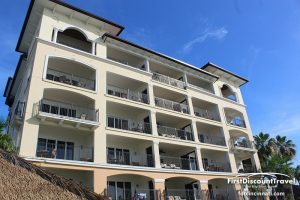 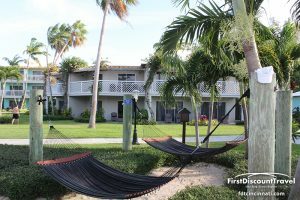 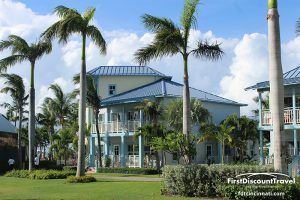 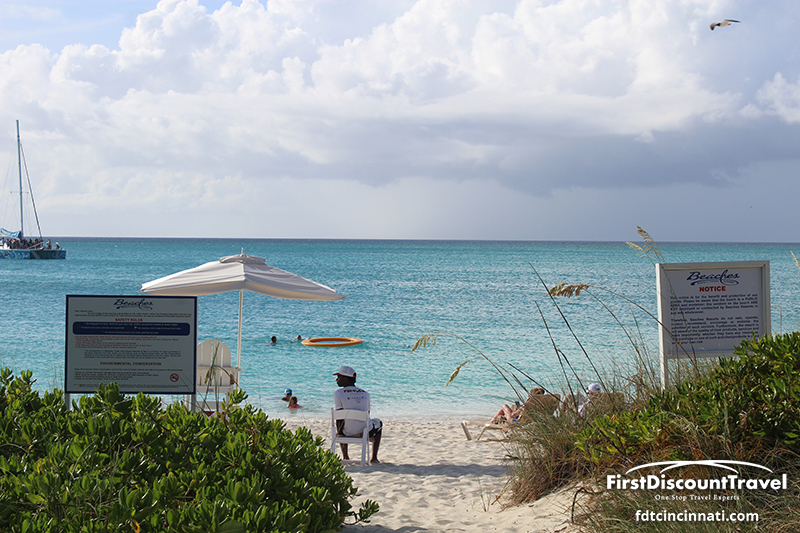 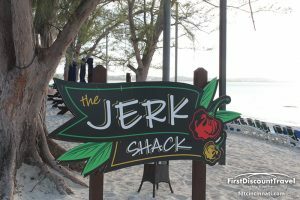 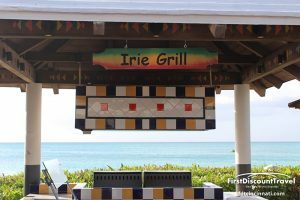 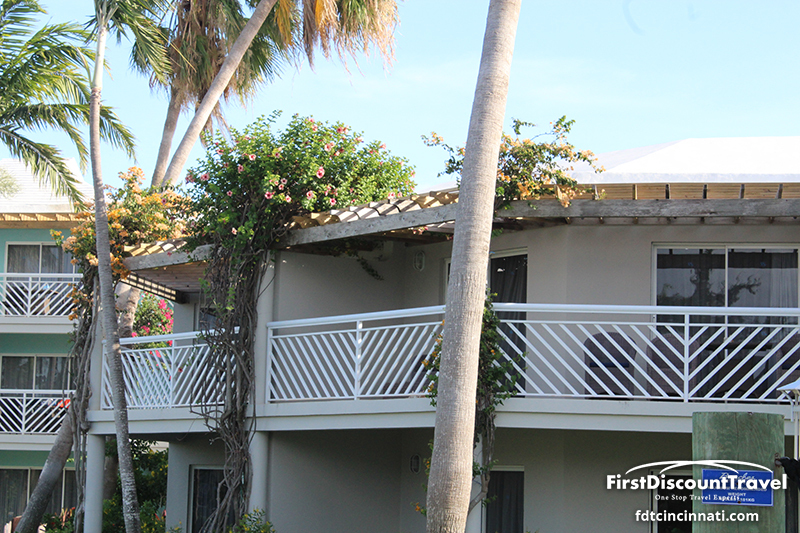 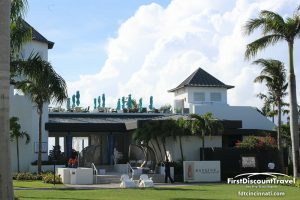 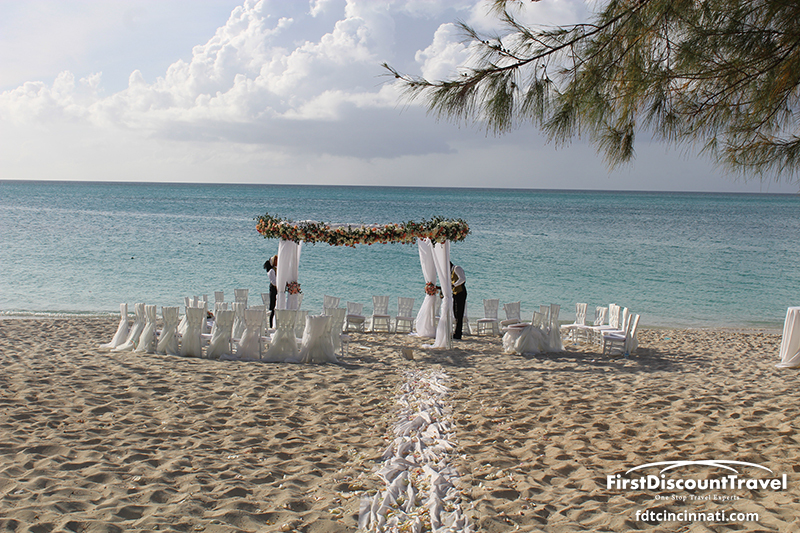 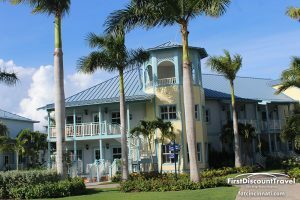 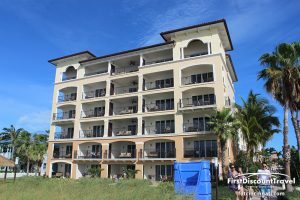 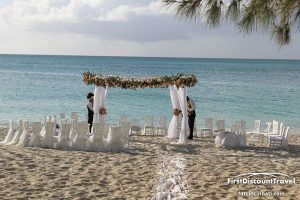 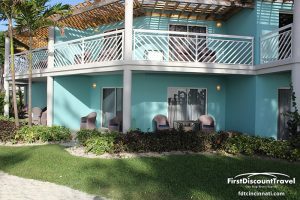 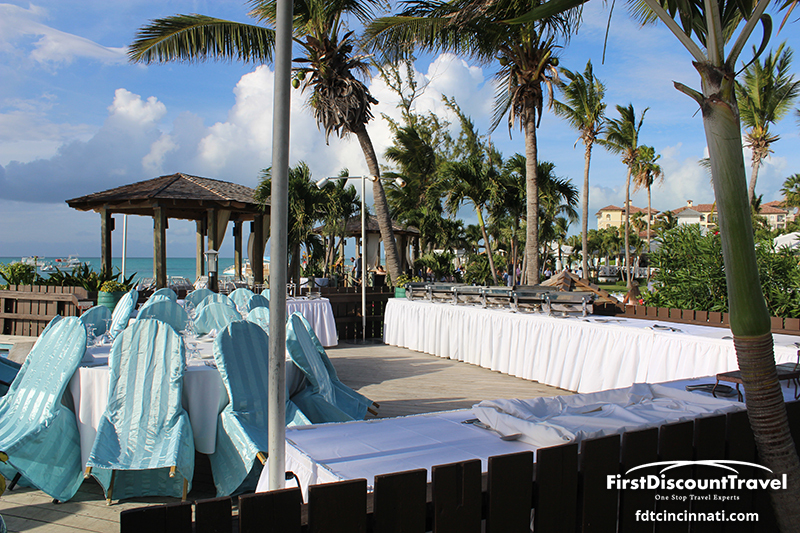 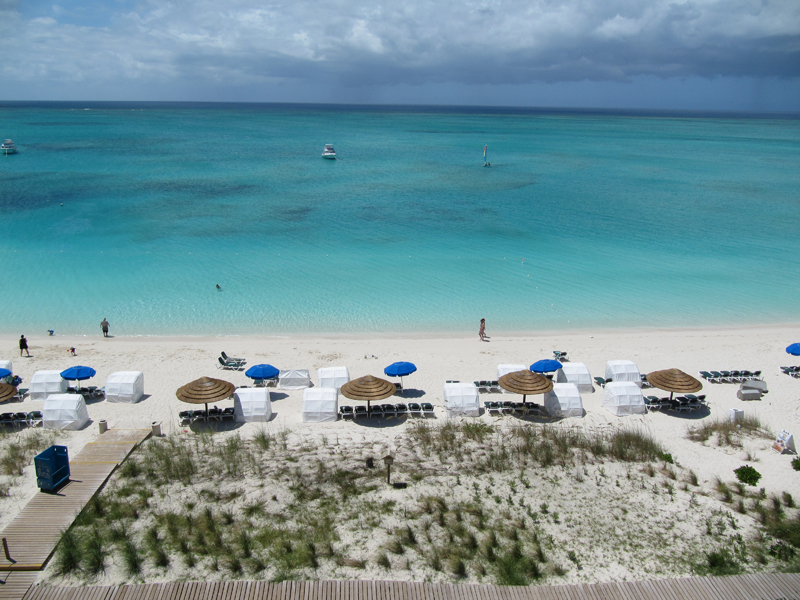 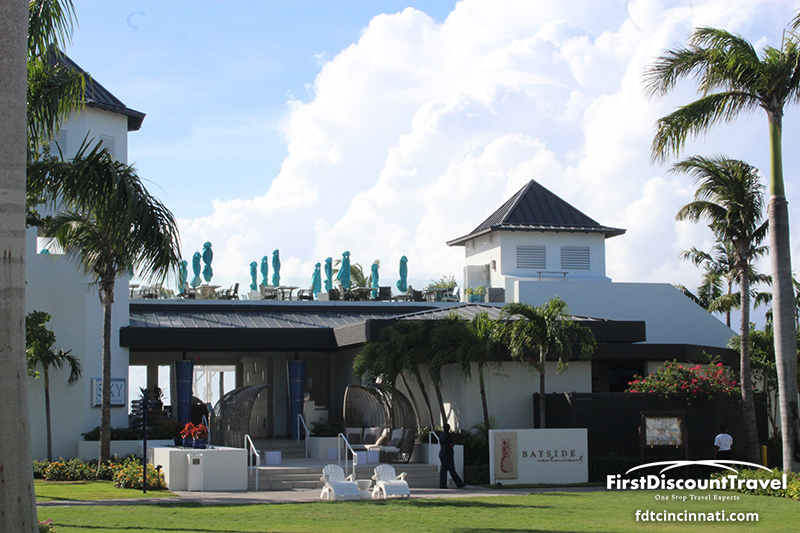 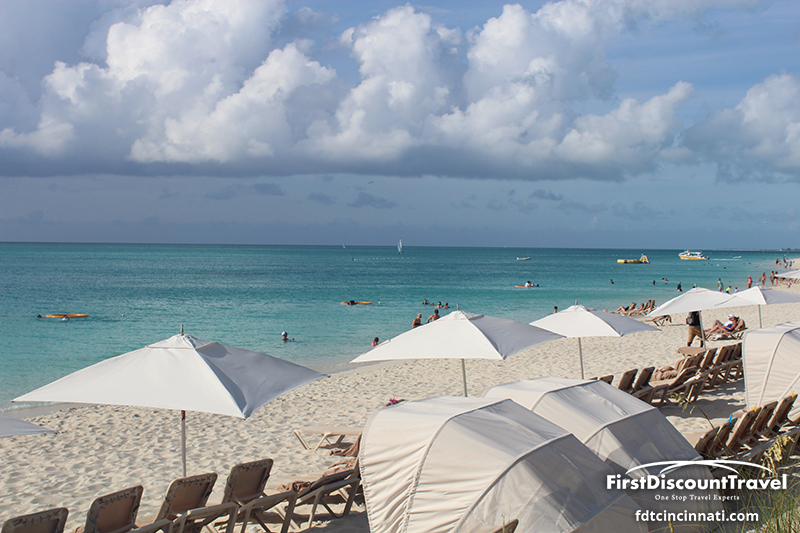 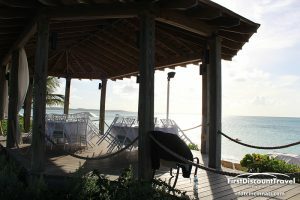 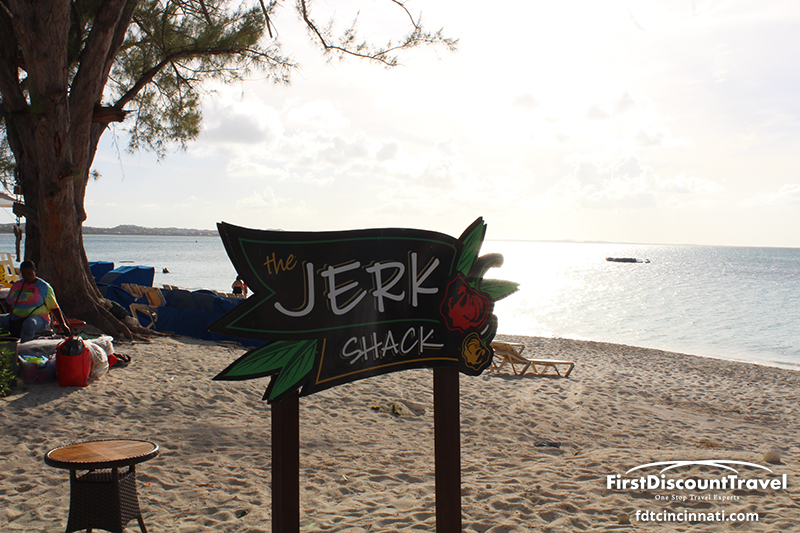 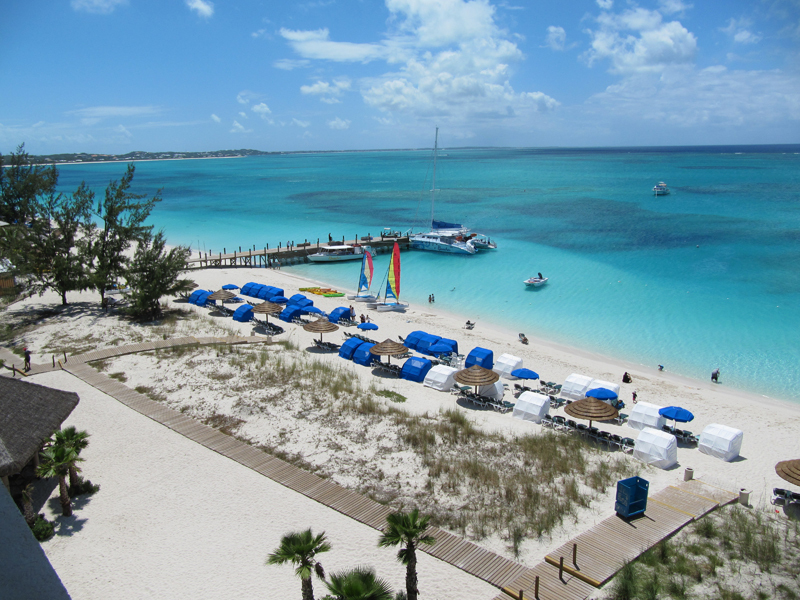 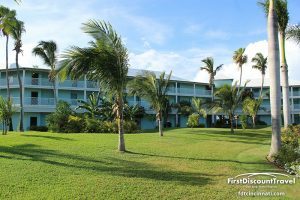 Set on Grace Bay's white-sand beach and home to limitless activities, this is the perfect vacation spot for singles and families. 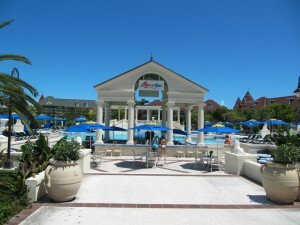 Beaches Turks offers three uniquely themed villages for one incredible vacation experience: Paris in paradise at the French Village; easy-going island elegance at the Caribbean Village; and the bellisimo Italian Village features luxurious two-bedroom family suites and an expanded Pirates Island Waterpark. 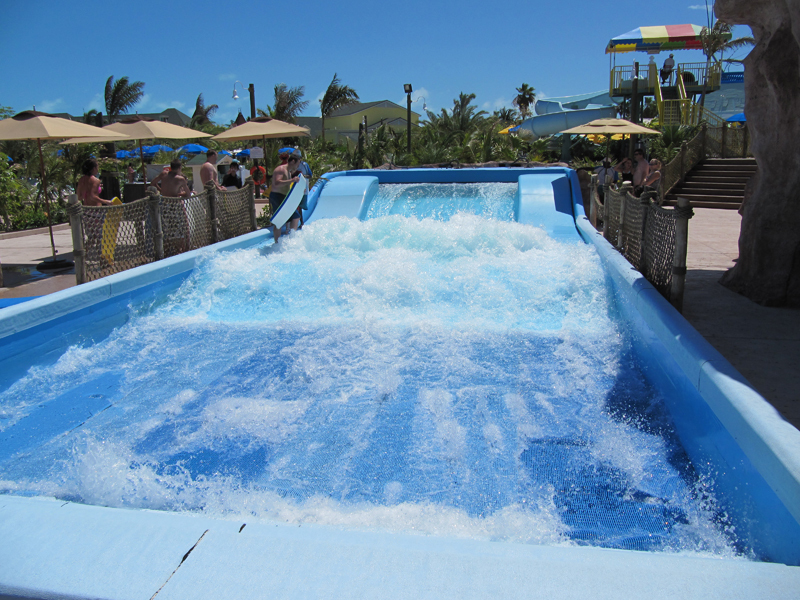 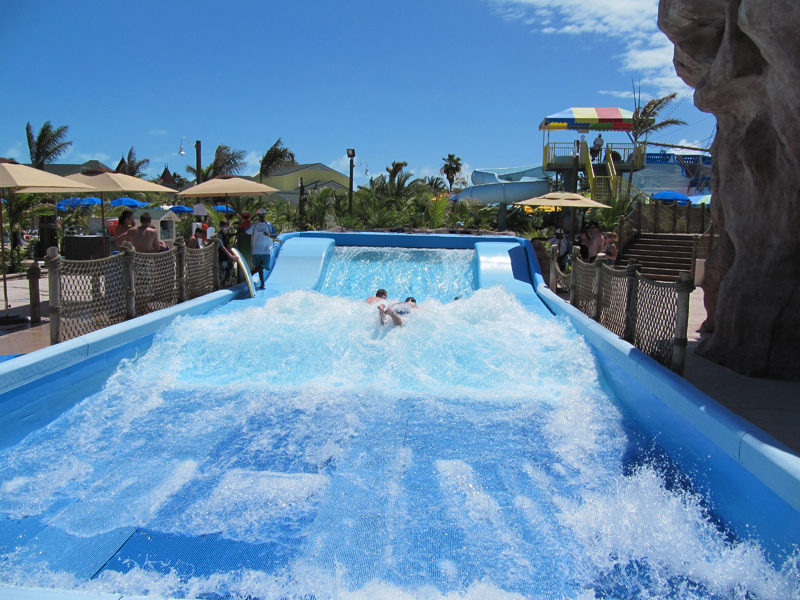 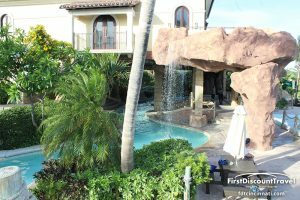 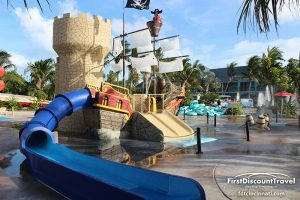 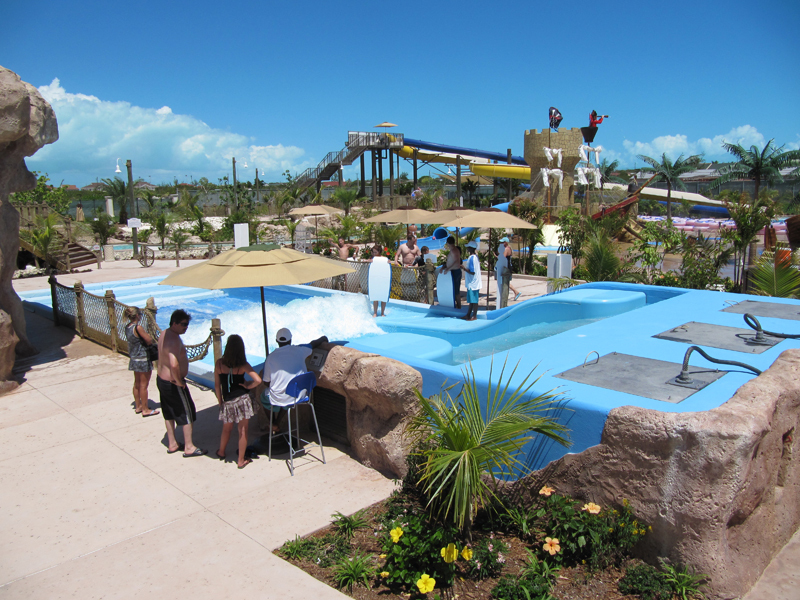 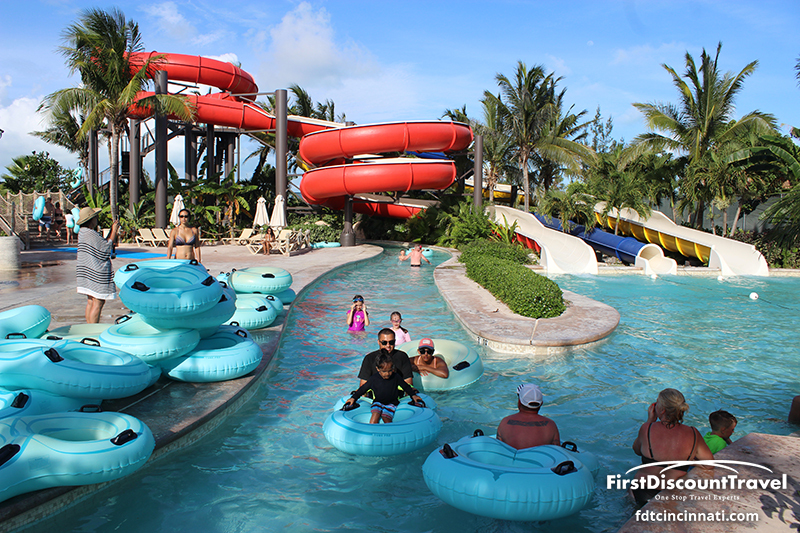 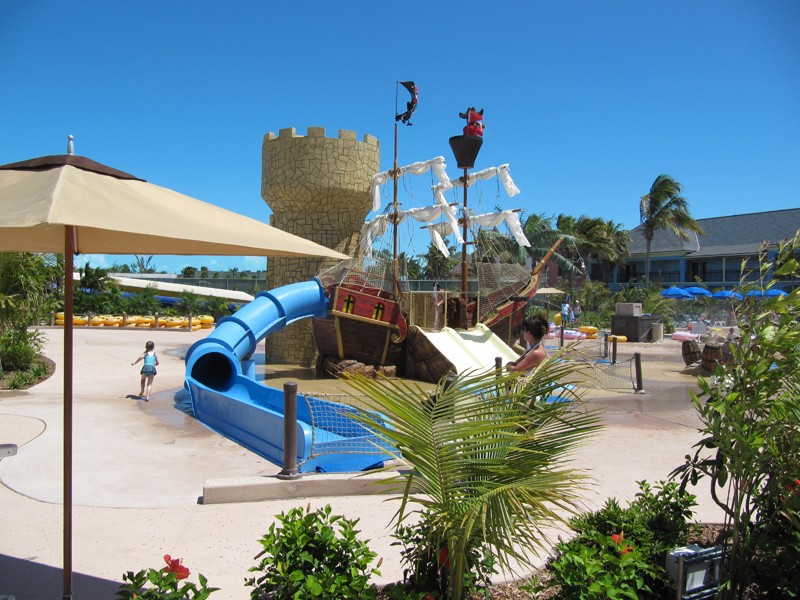 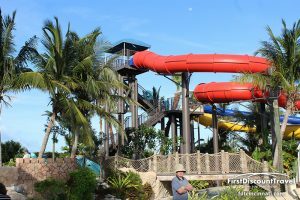 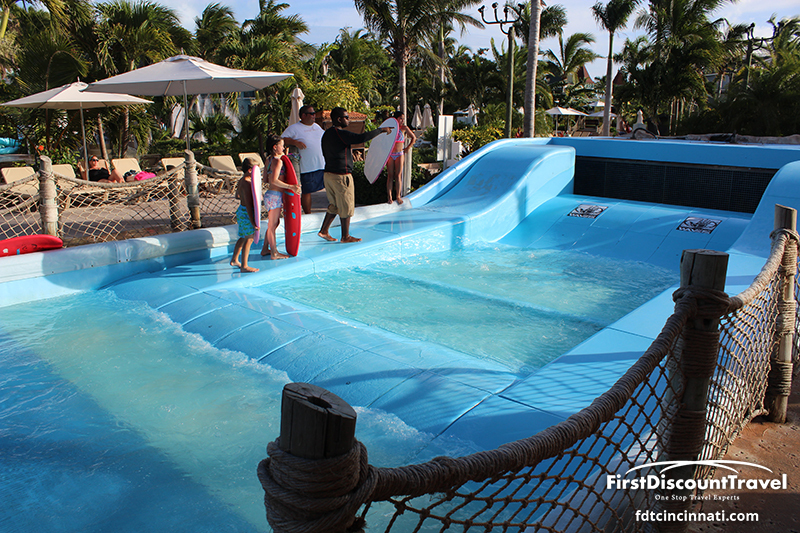 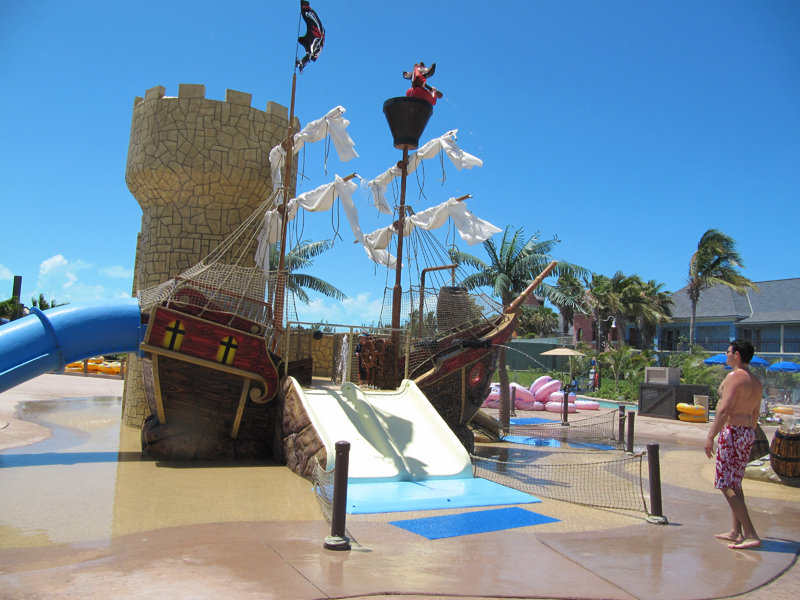 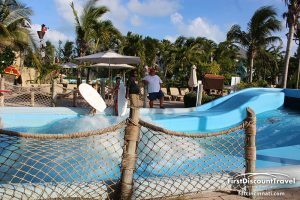 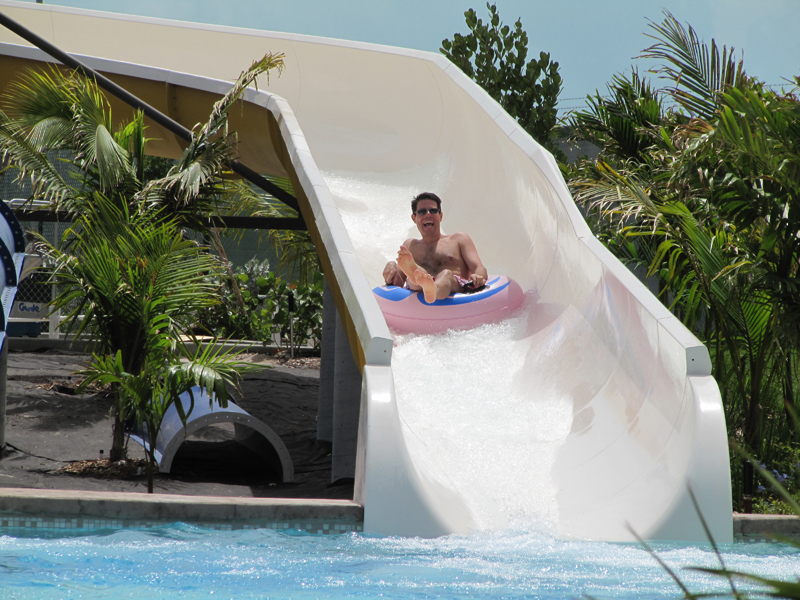 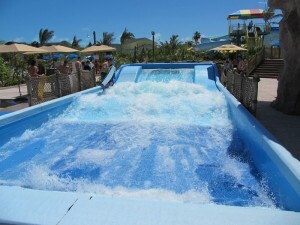 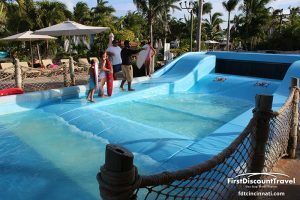 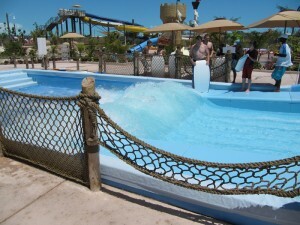 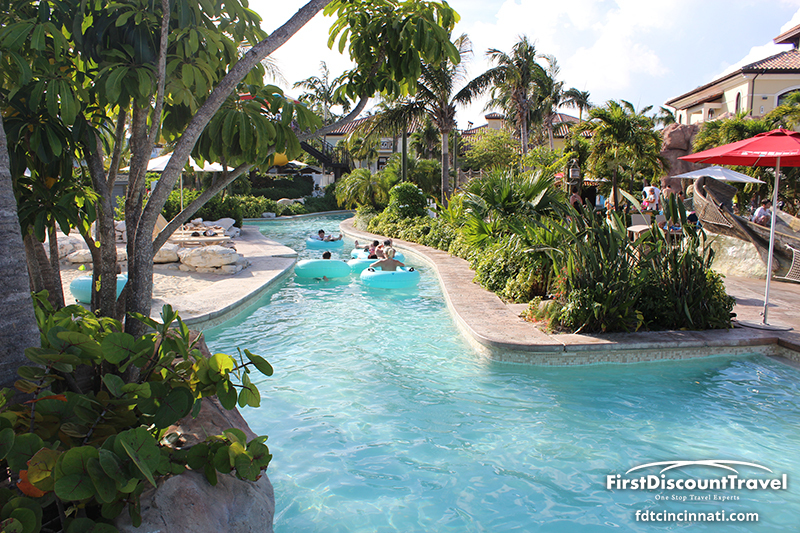 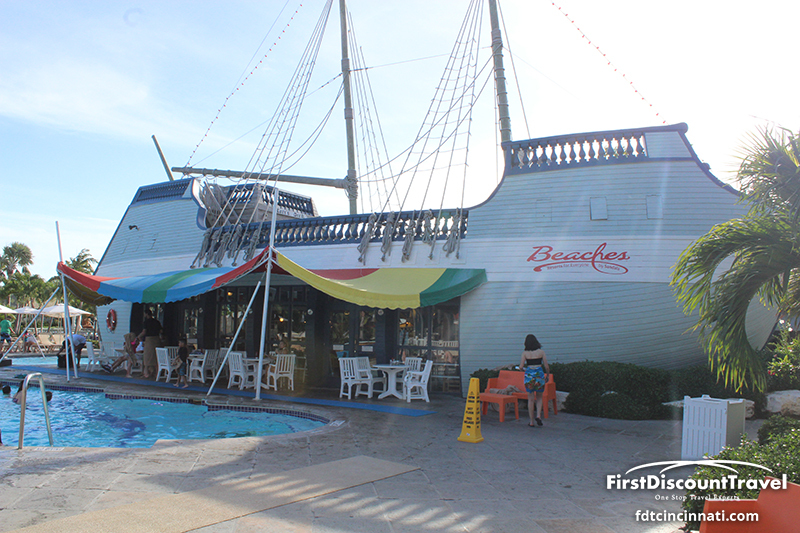 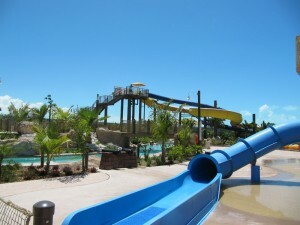 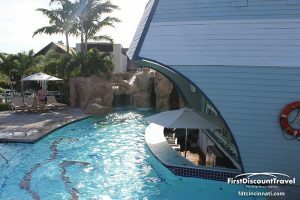 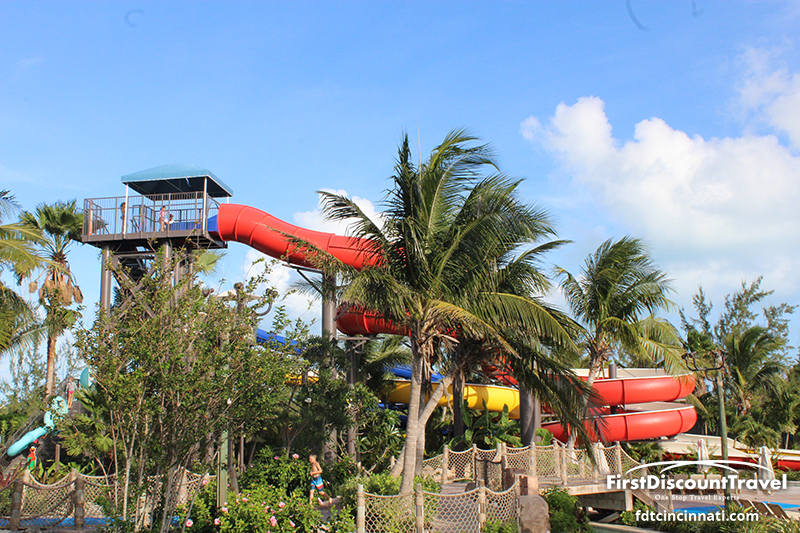 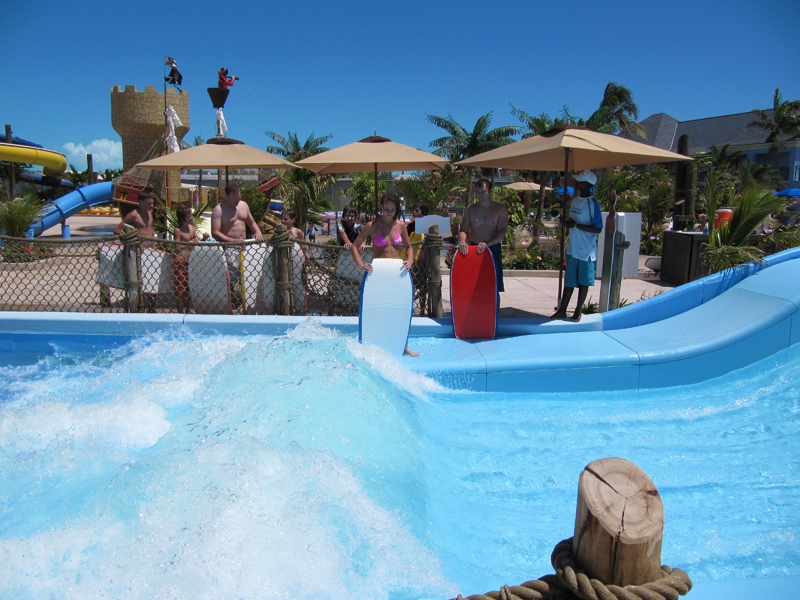 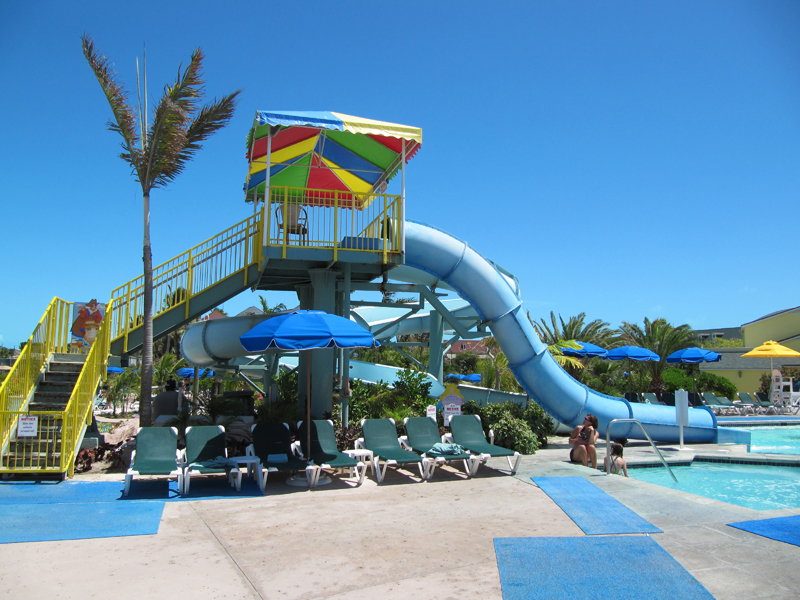 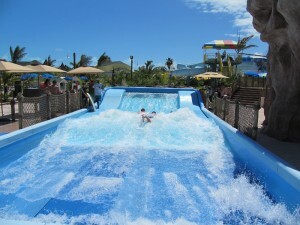 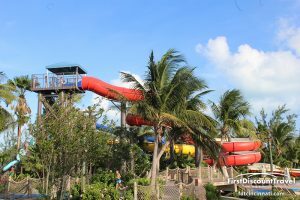 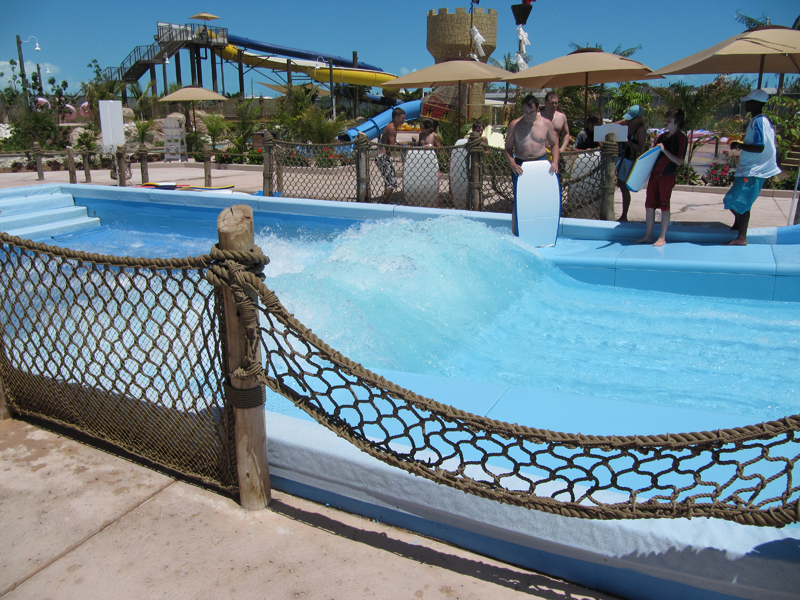 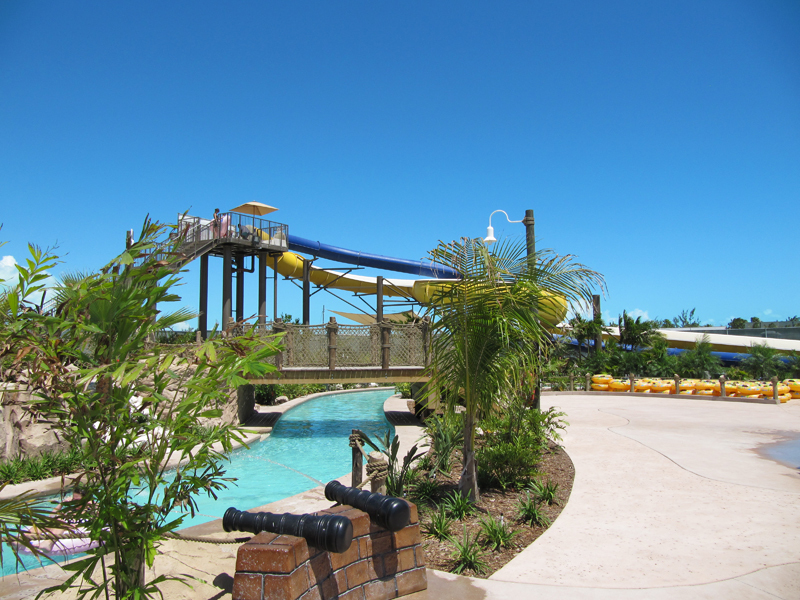 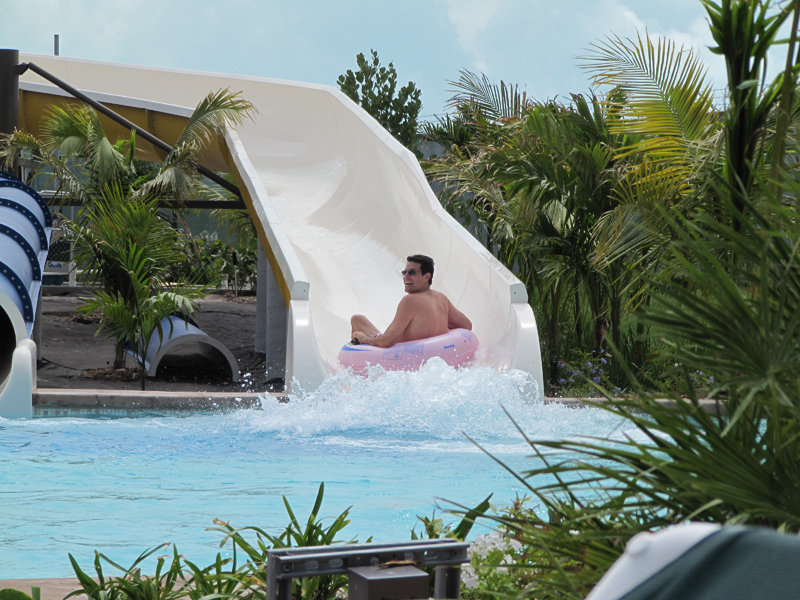 Not for the faint of heart, kids of all ages will splash about in the lazy river, hang ten in the surf simulator, or take the plunge down numerous twisting and turning waterslides. 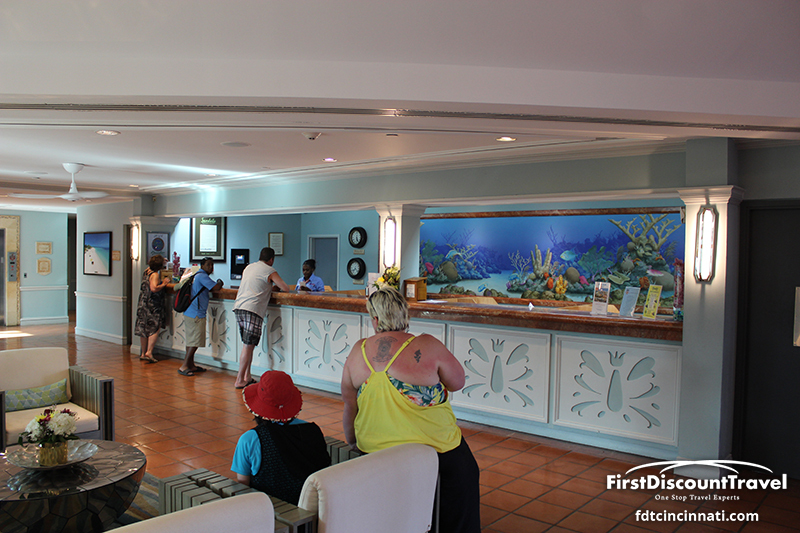 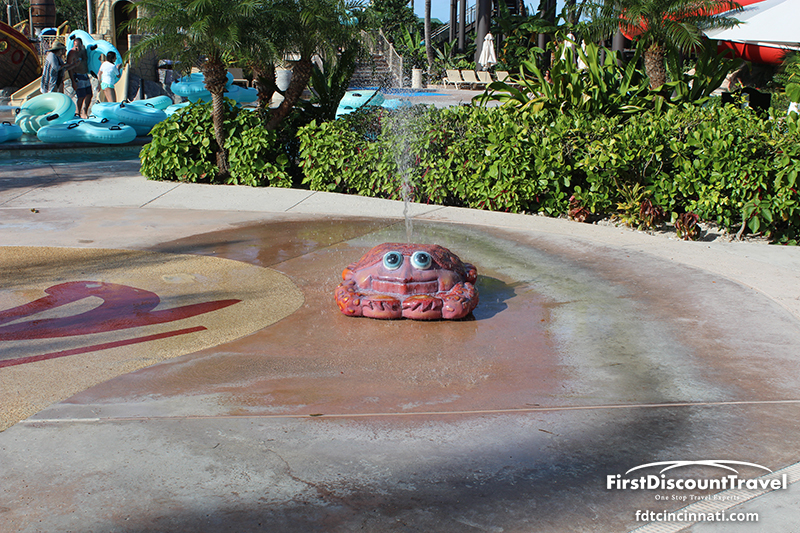 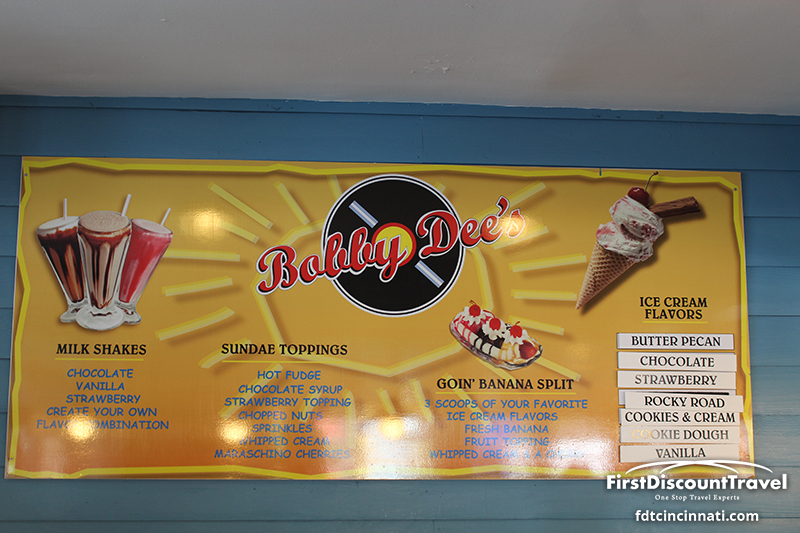 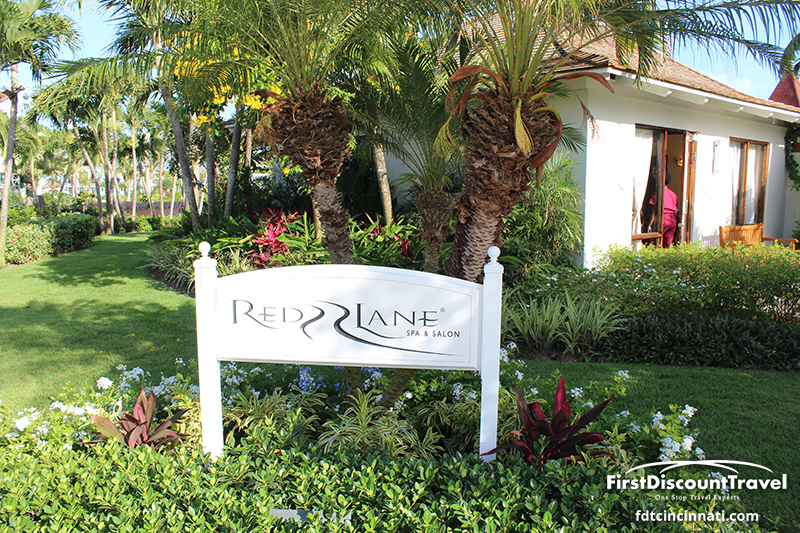 No other resort does so much to please the whole family. 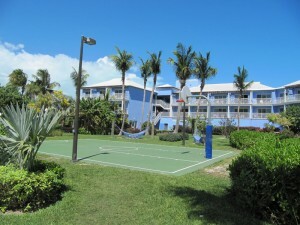 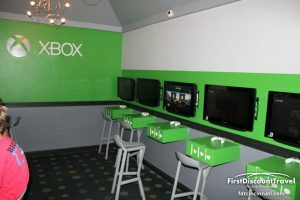 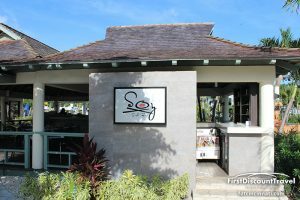 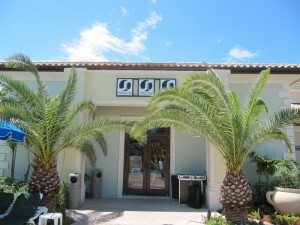 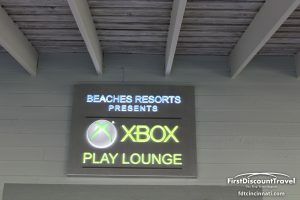 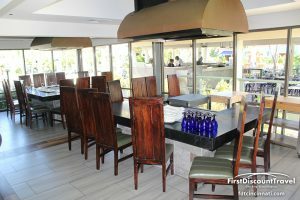 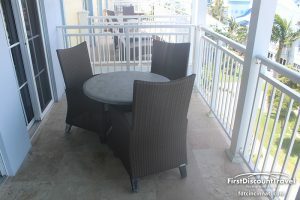 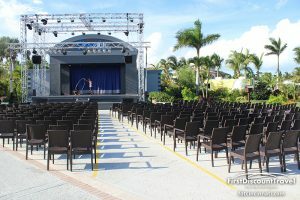 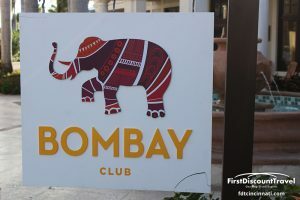 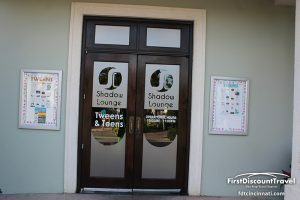 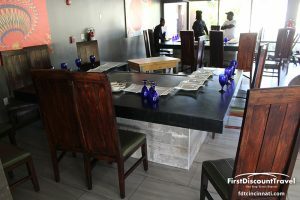 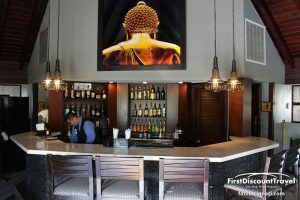 With 16 dining options, 12 bars serving premium-brand beverages including Beringer house wines, a full-service Red Lane Spa, 8 pools, unlimited land and water sports including scuba diving, a supervised Kids Camp, themed character activities with The Caribbean Adventure with Sesame Street, Liquid at Beaches the teen nightclub, and an Xbox Play Lounge, this resort features limitless things to do! 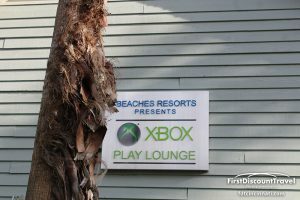 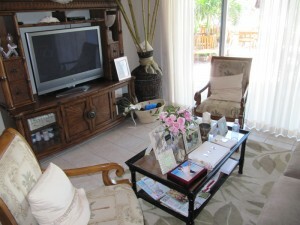 Before giving my description of this resort specifically, let’s summarize what is true about all Beaches resorts. 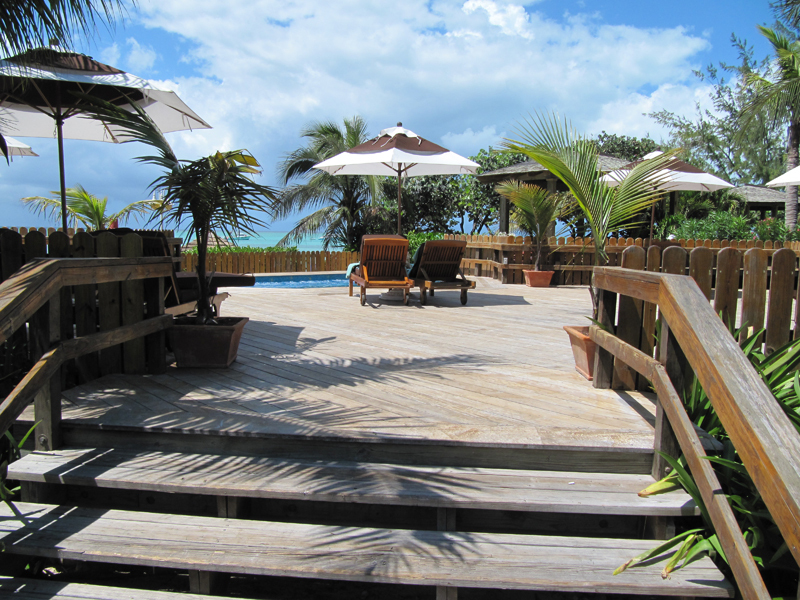 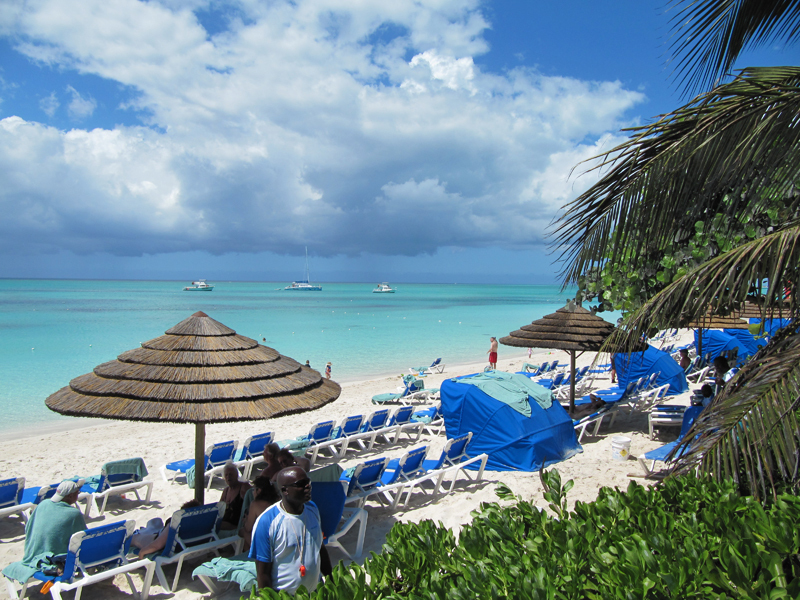 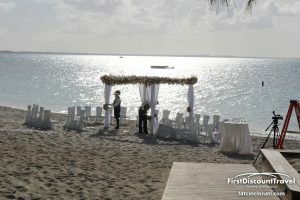 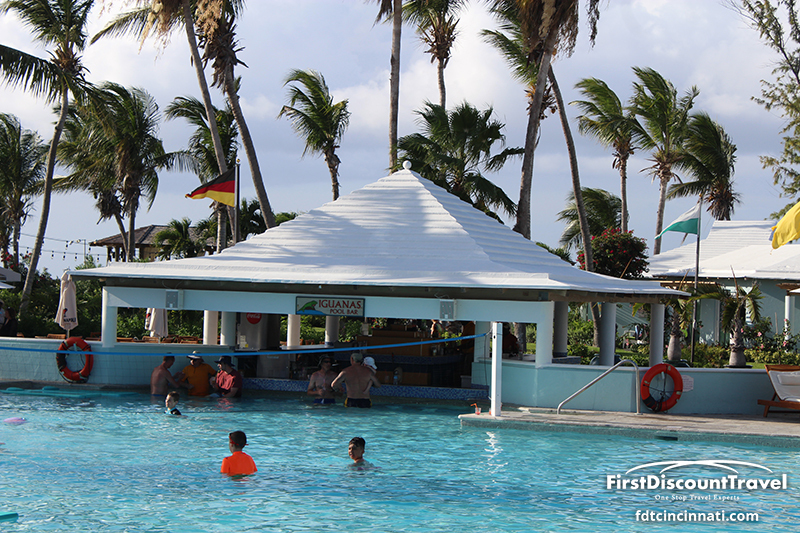 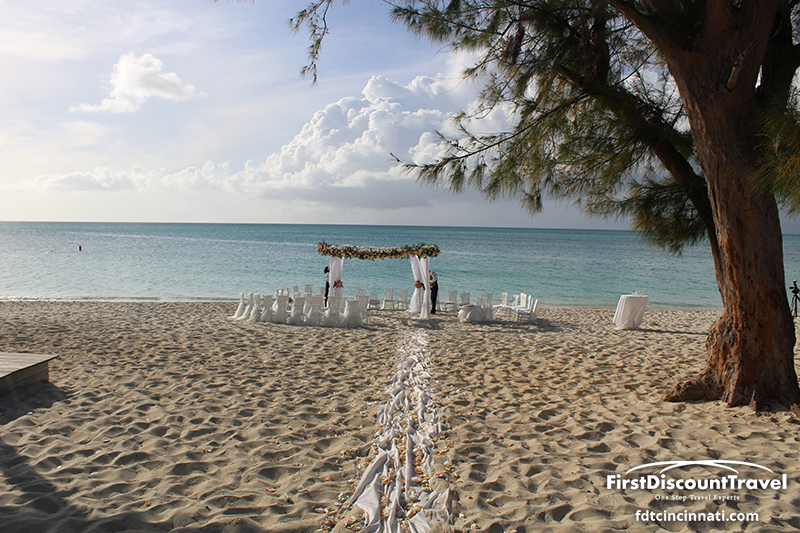 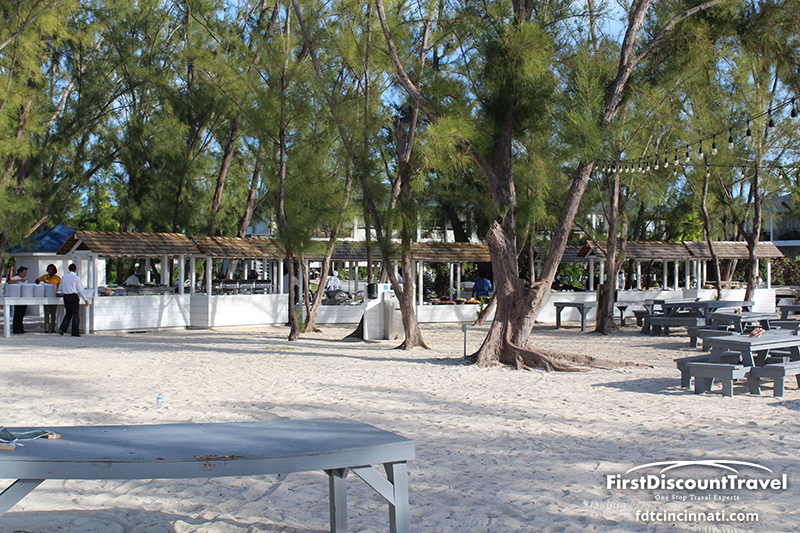 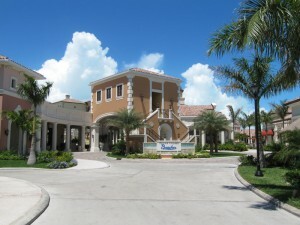 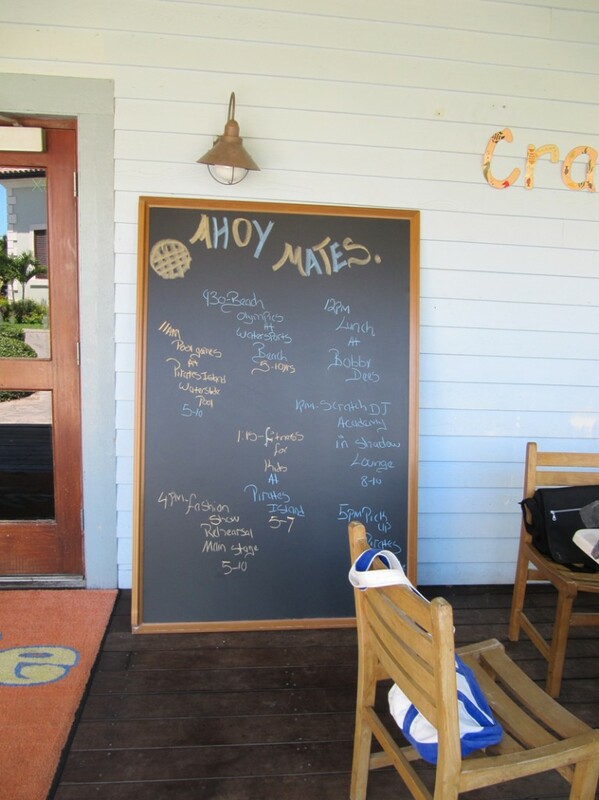 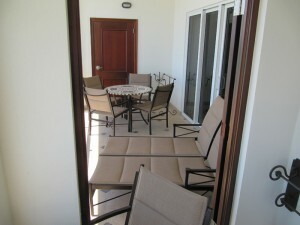 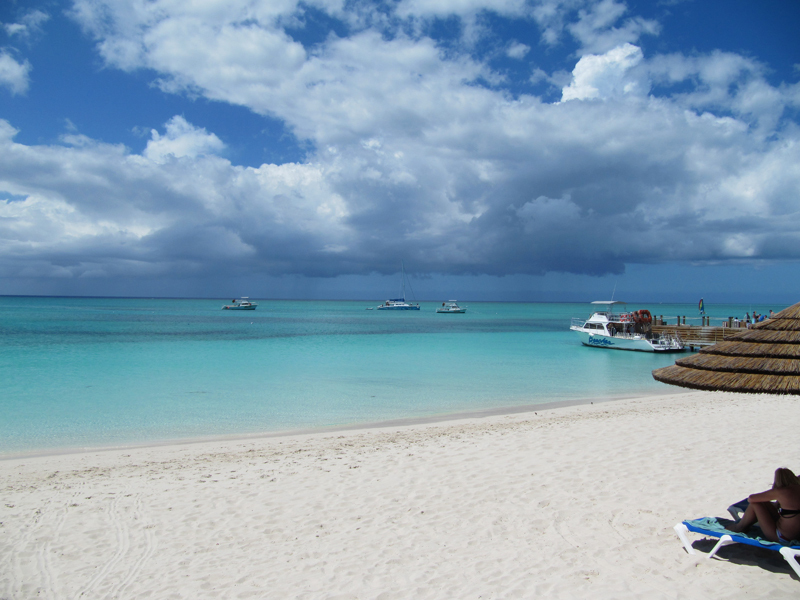 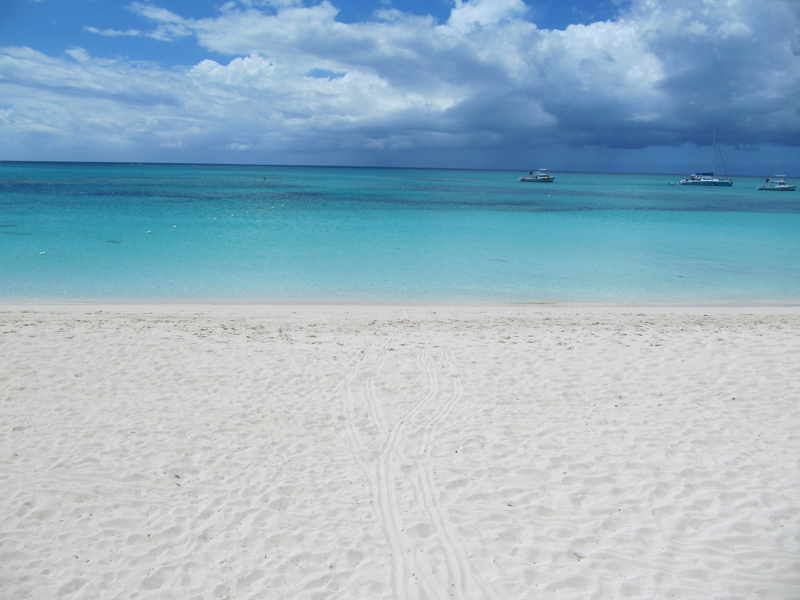 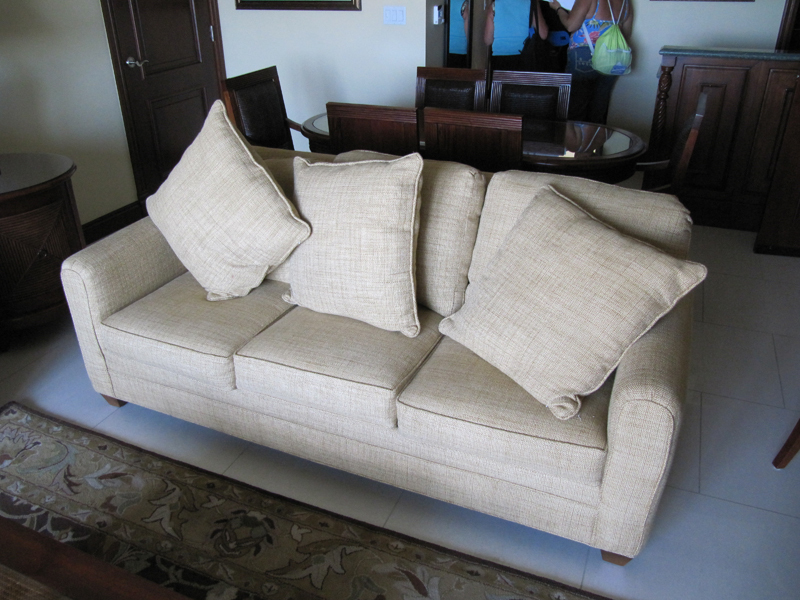 All Beaches resorts are located on English speaking islands in the Caribbean. 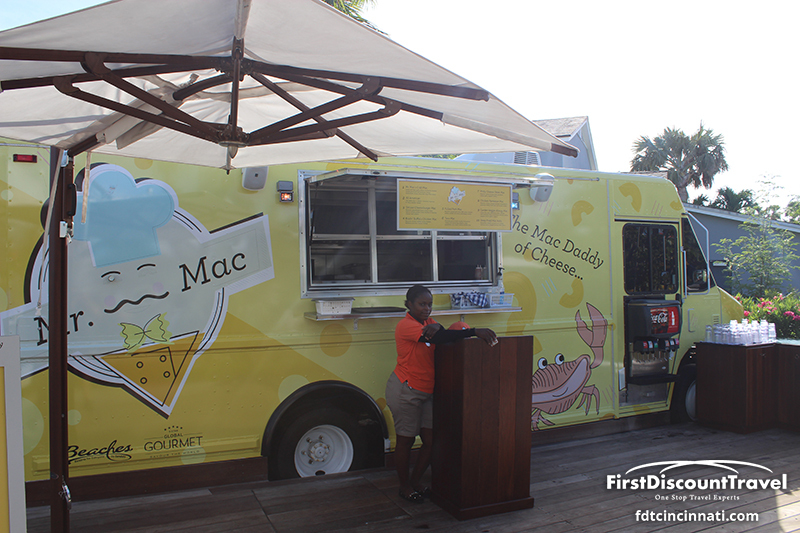 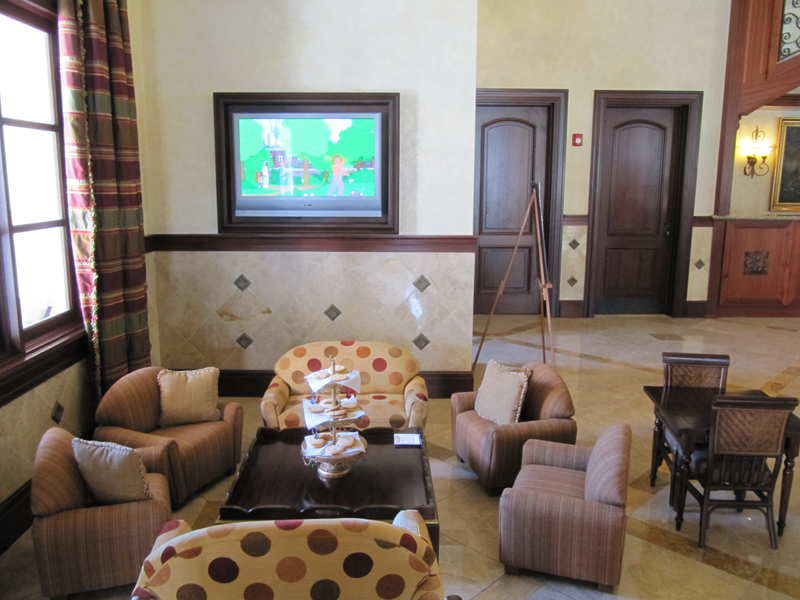 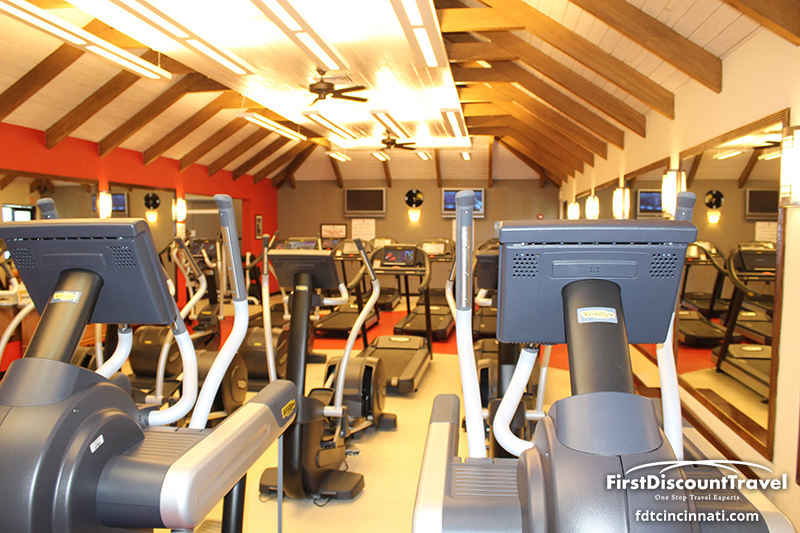 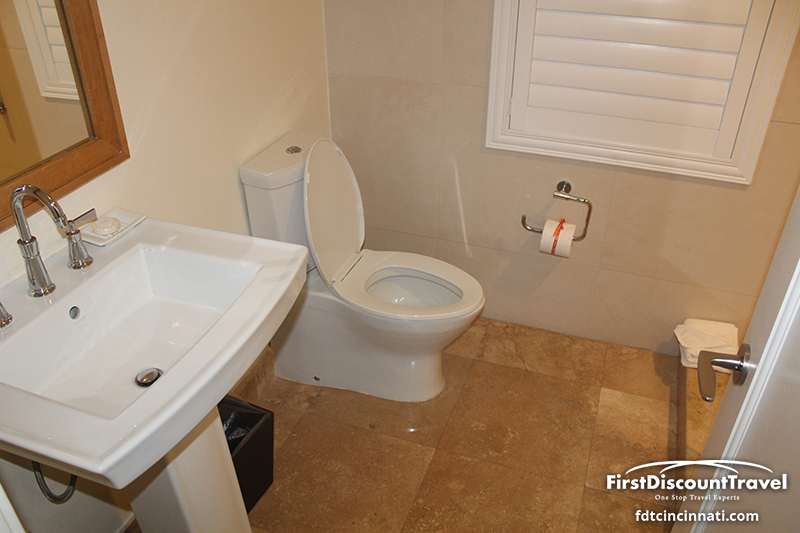 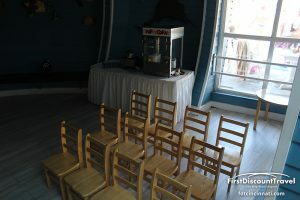 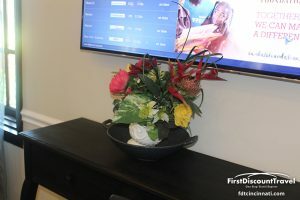 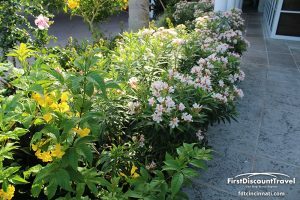 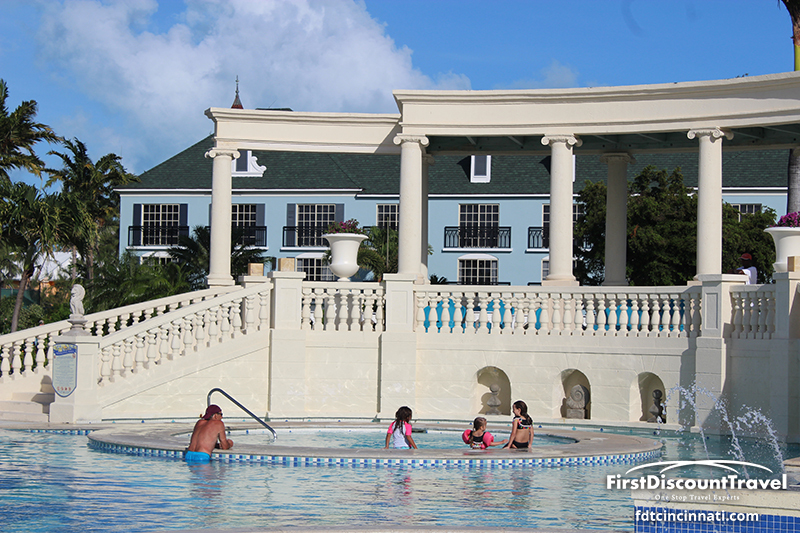 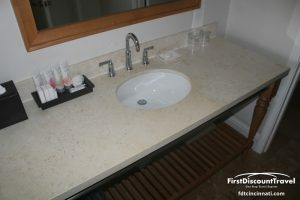 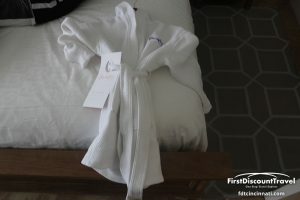 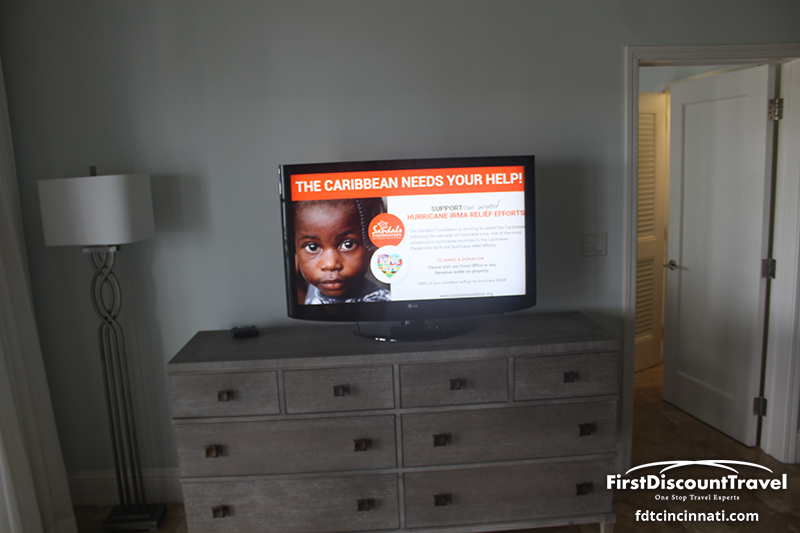 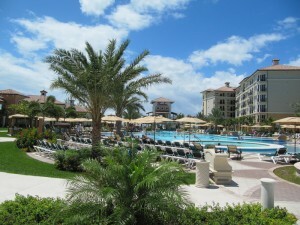 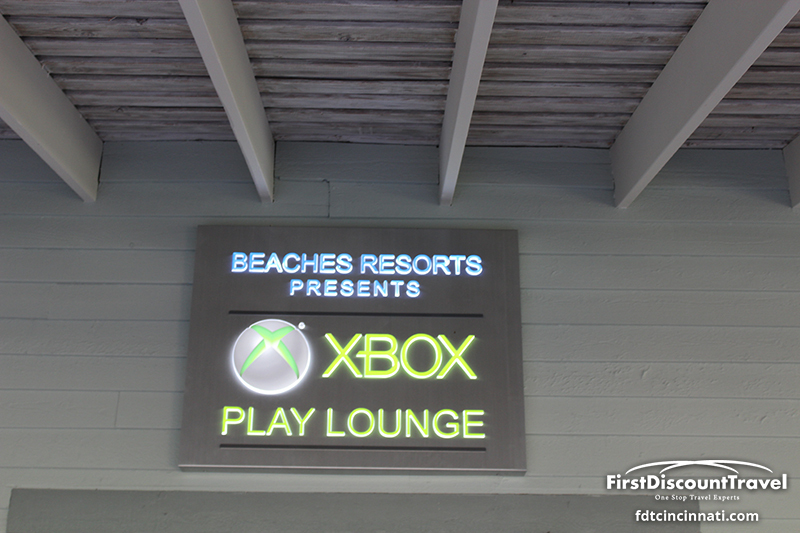 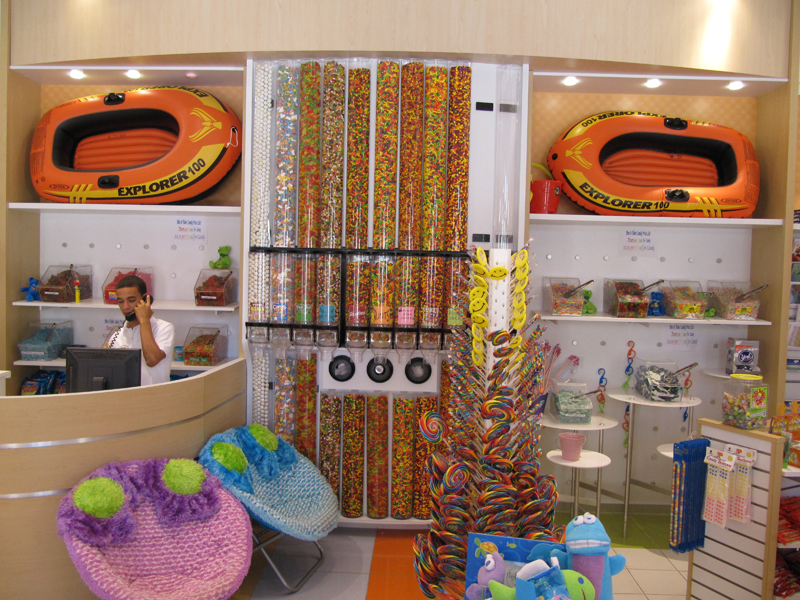 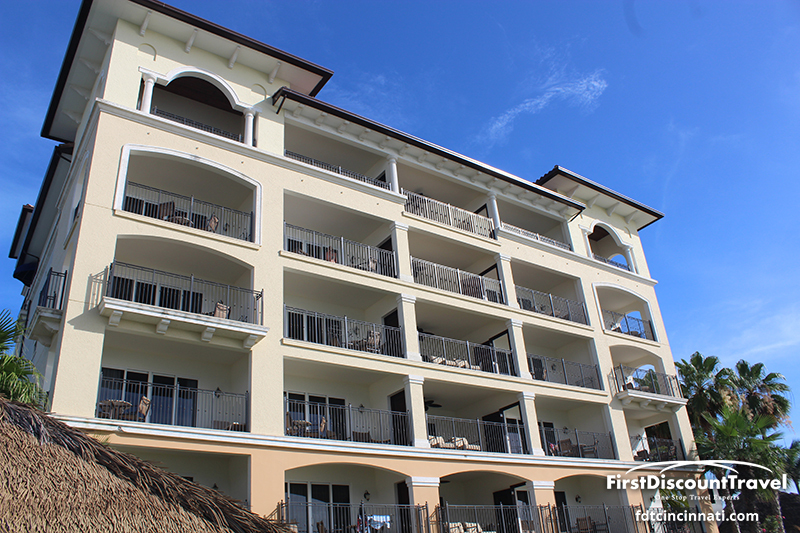 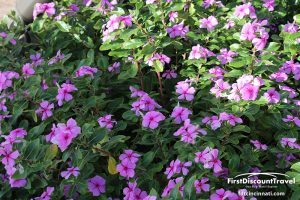 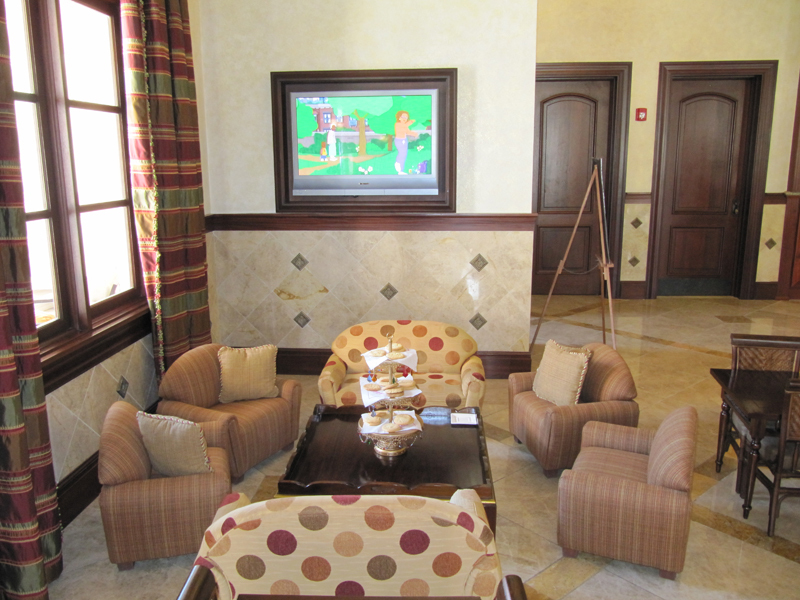 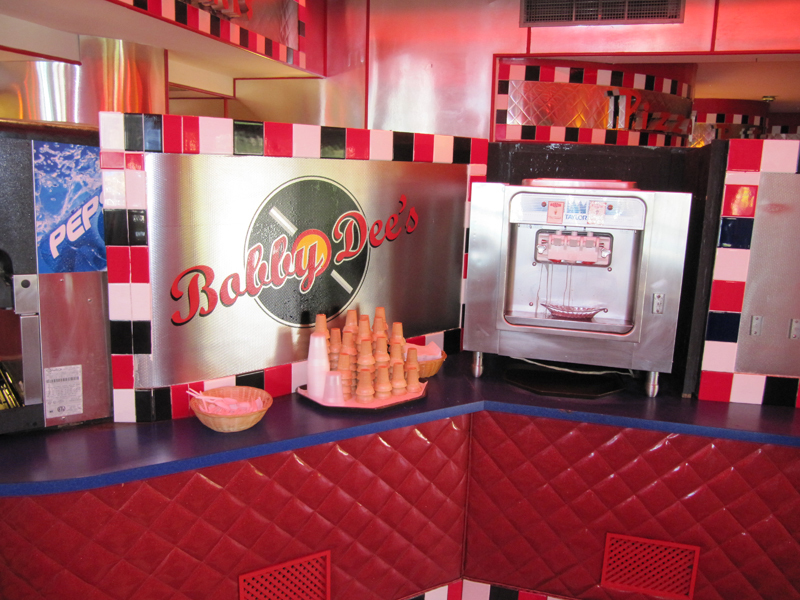 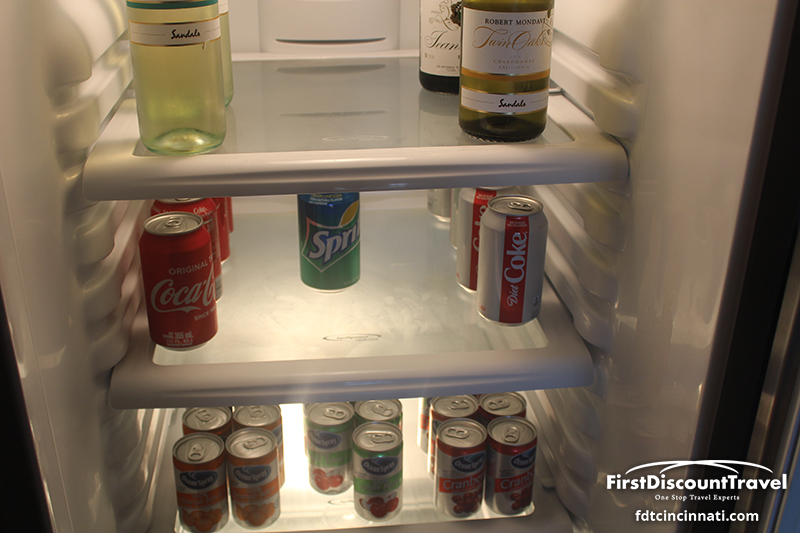 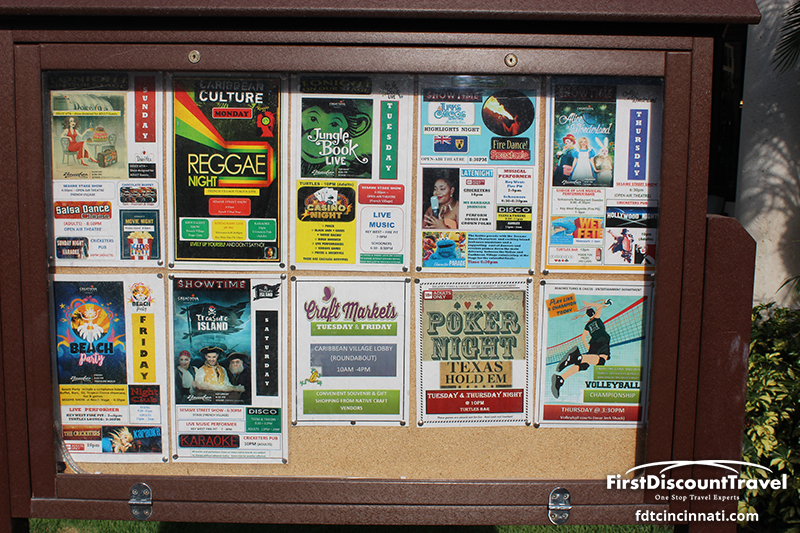 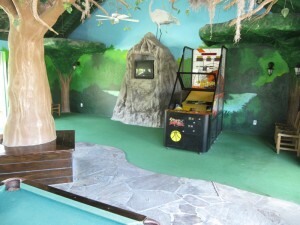 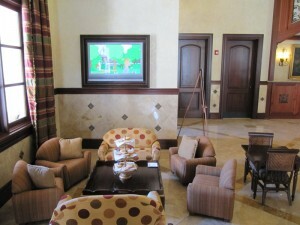 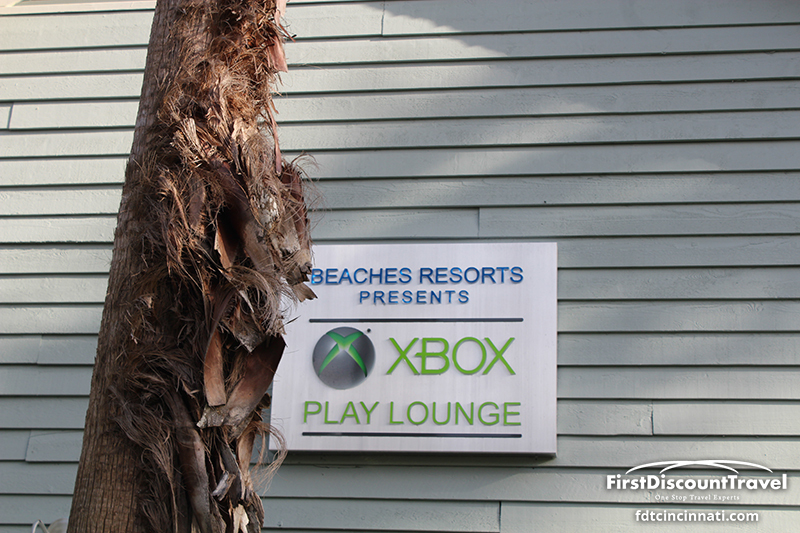 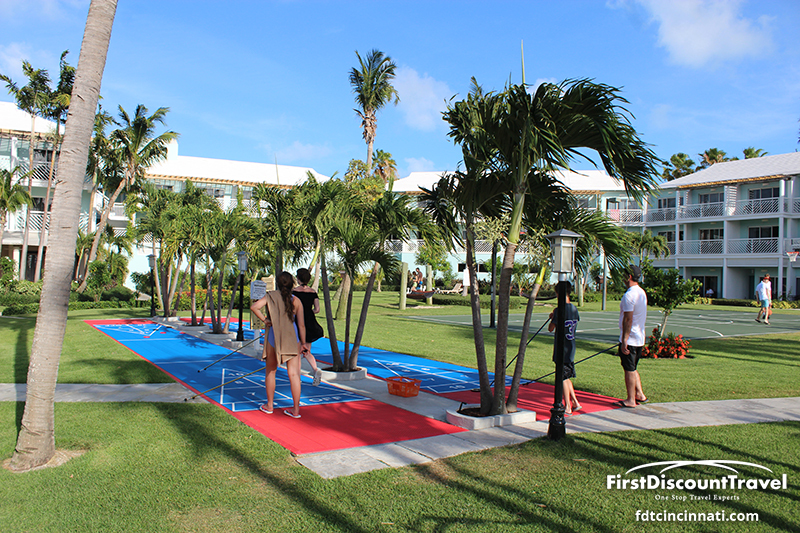 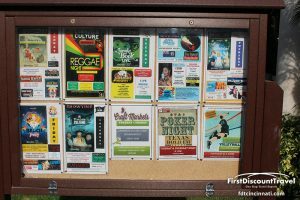 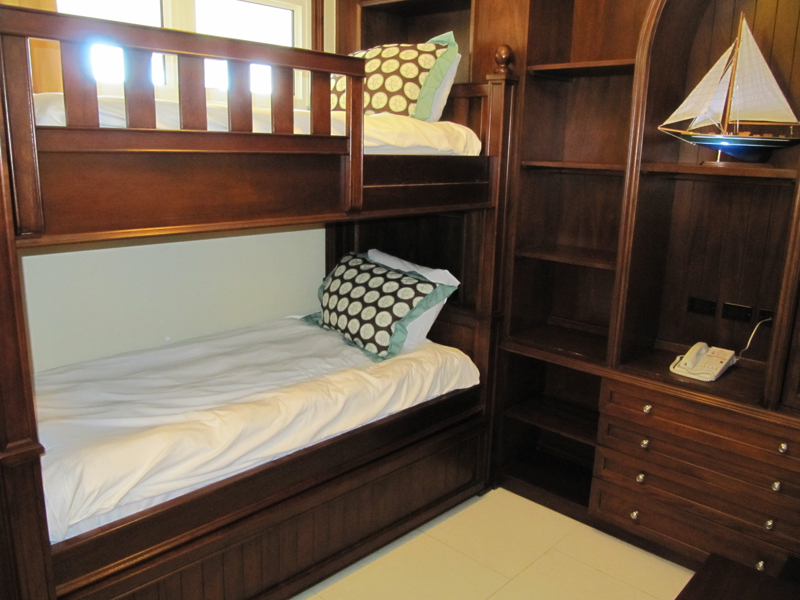 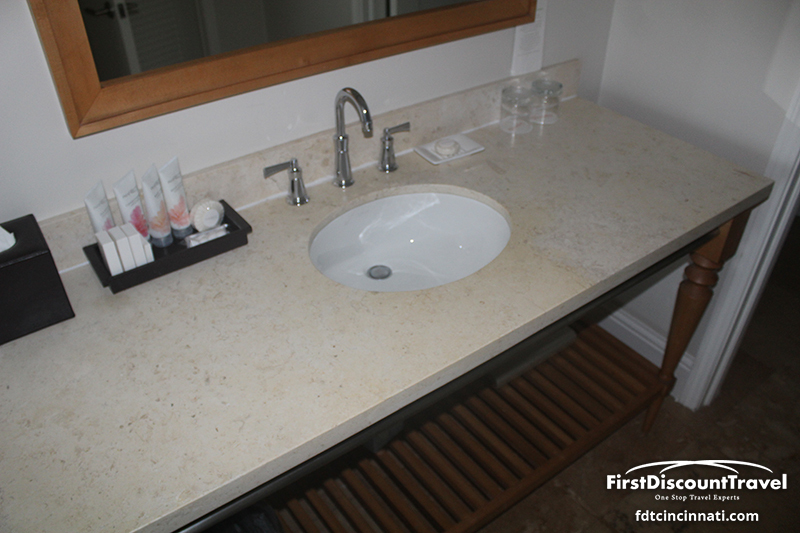 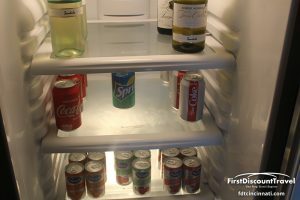 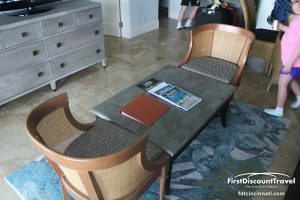 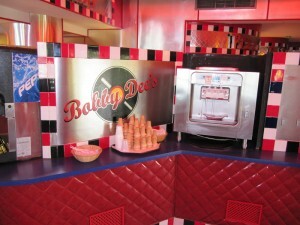 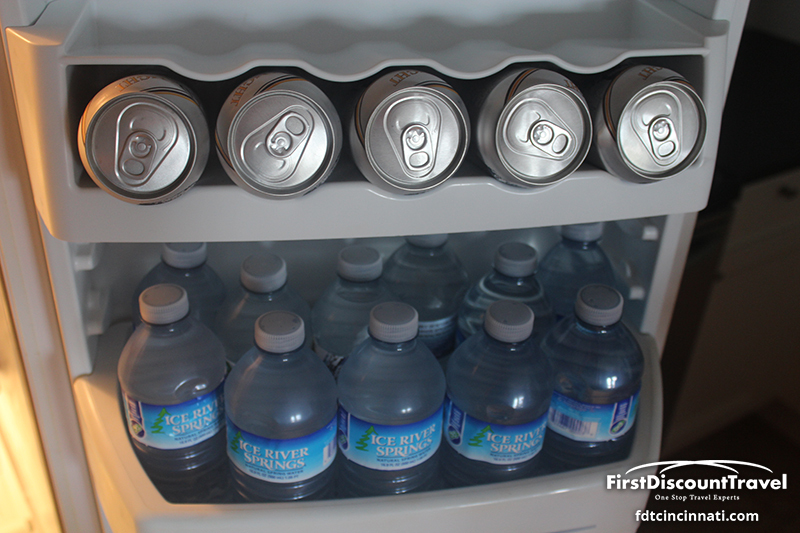 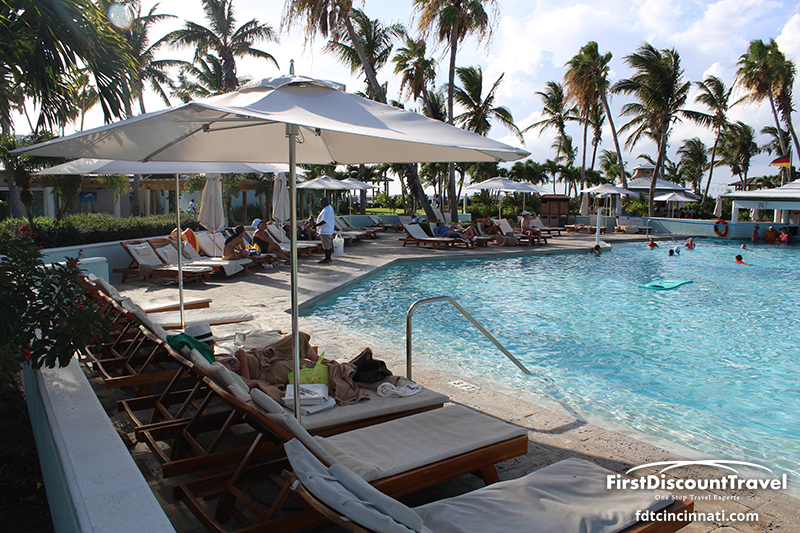 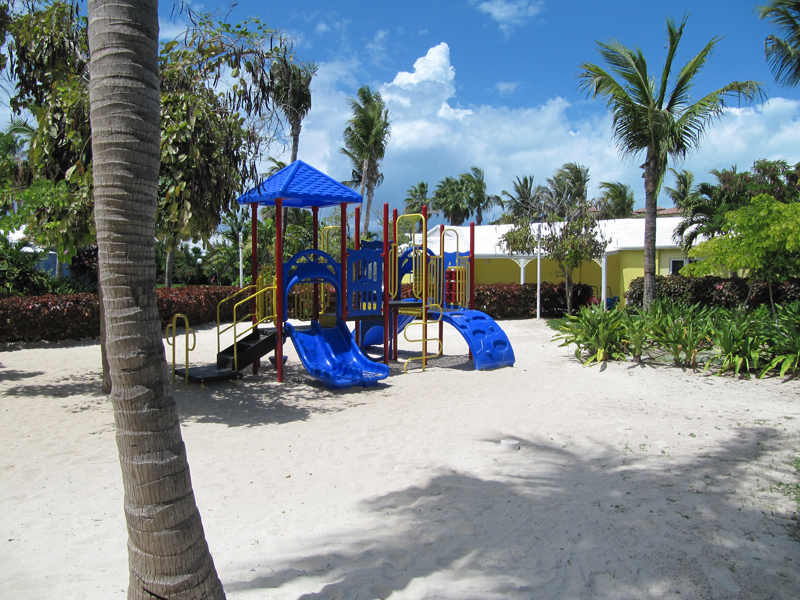 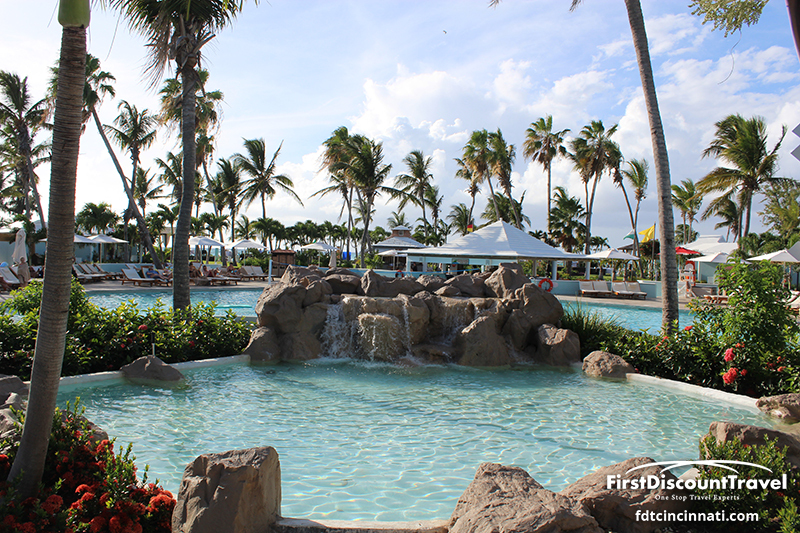 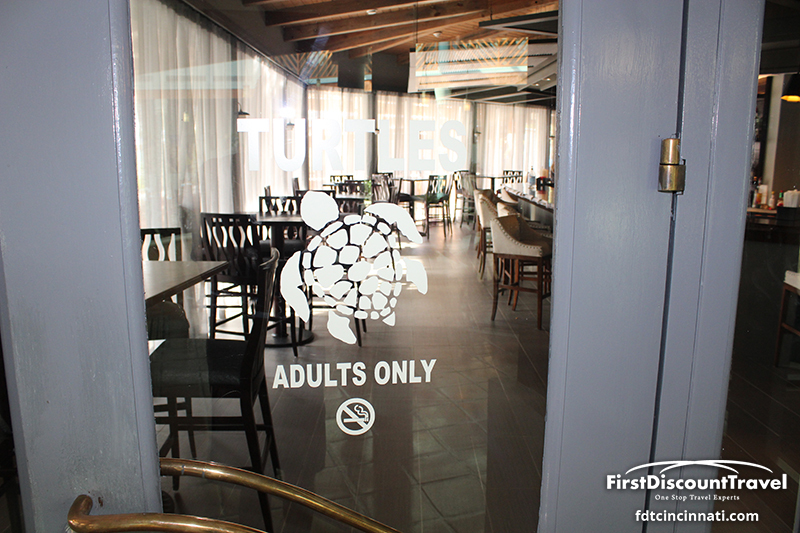 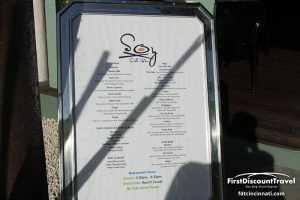 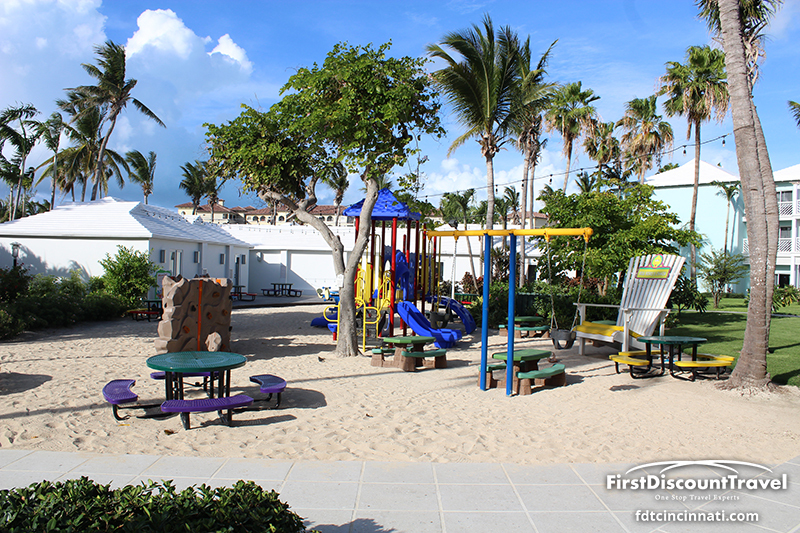 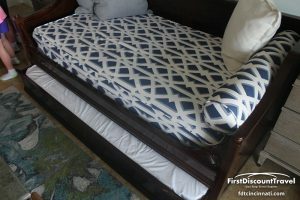 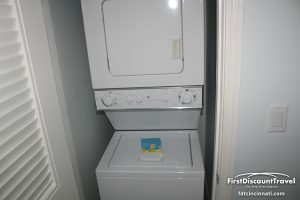 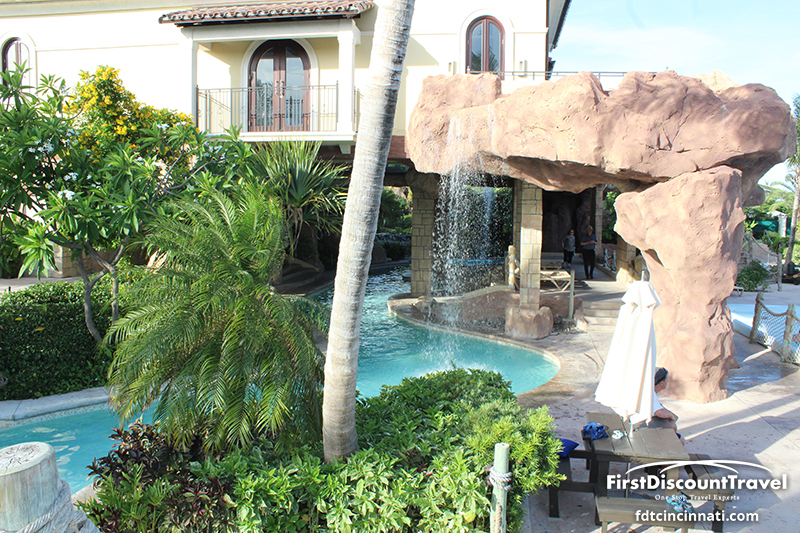 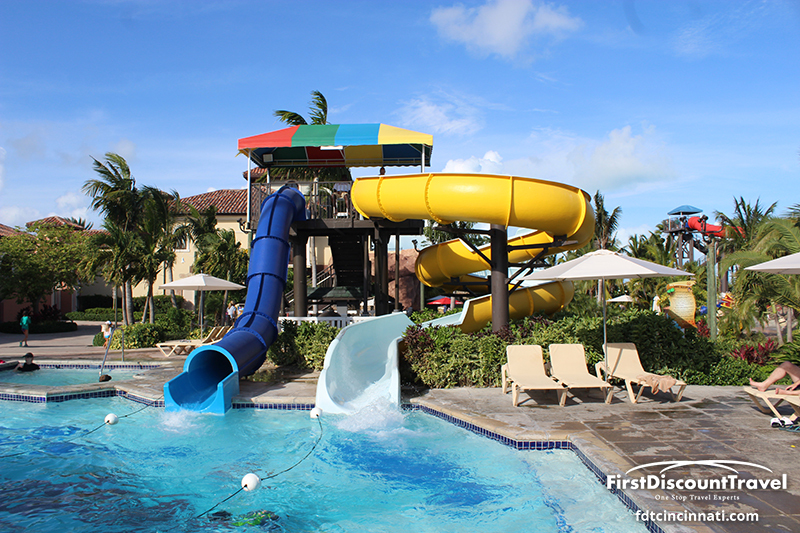 They’re family friendly and include more amenities than any other resort chain. 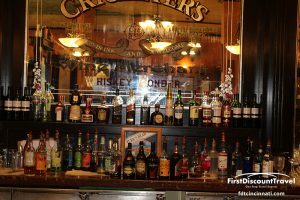 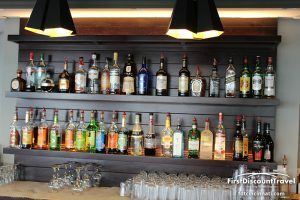 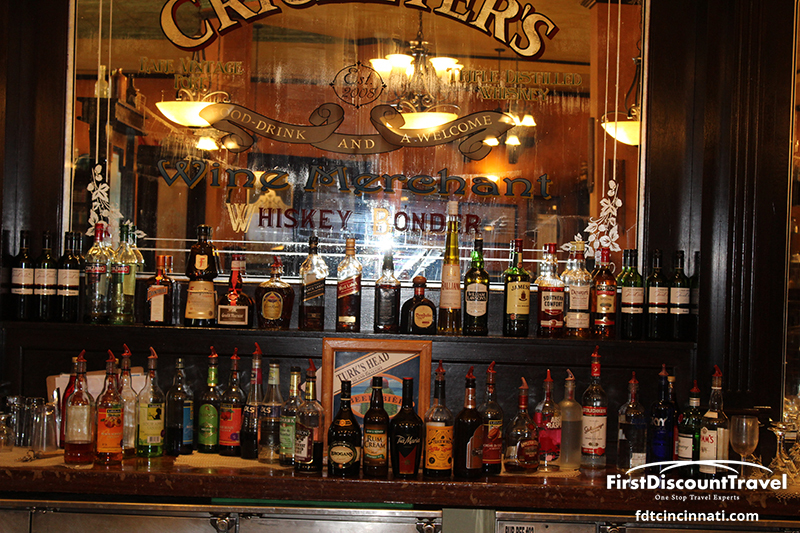 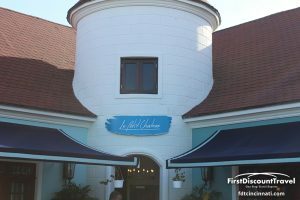 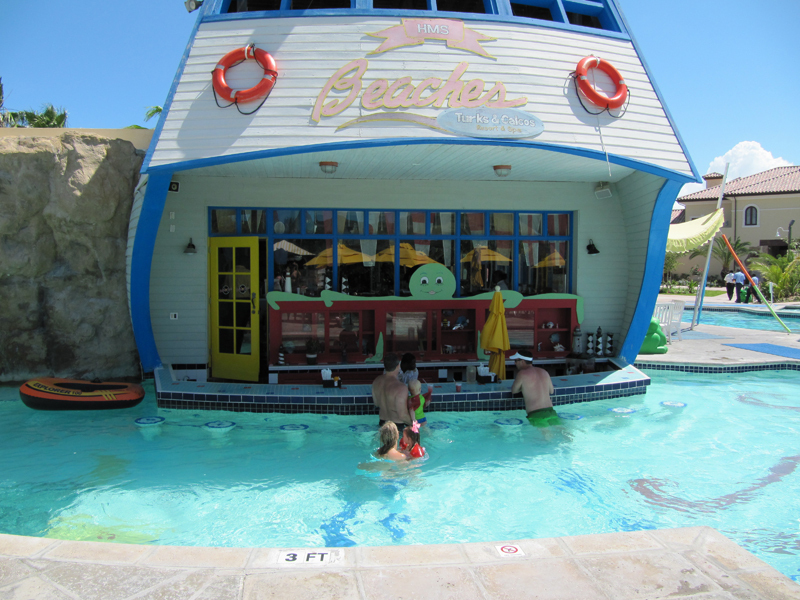 Beaches serves top shelf liquor and partners with Beringer for their house wines. 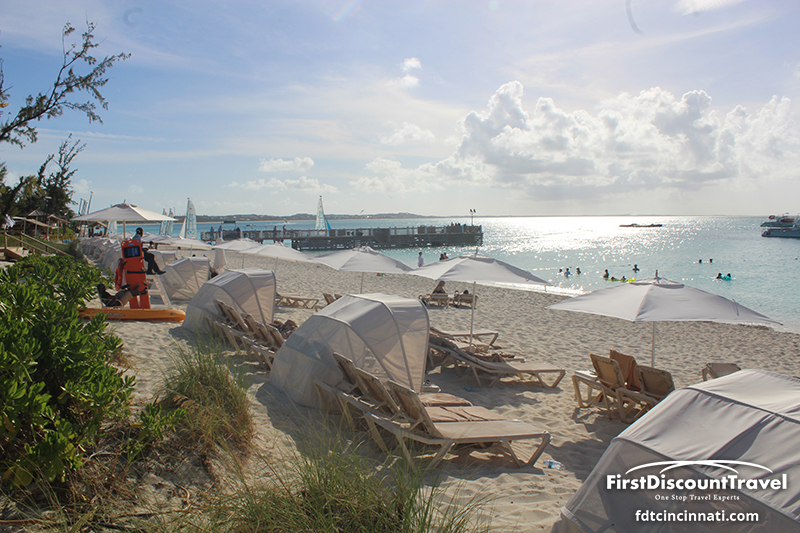 All non-motorized water sports are included (Hobie Cats, water trikes, sea kayaks, stand up paddle boards, wind surfing, and more). 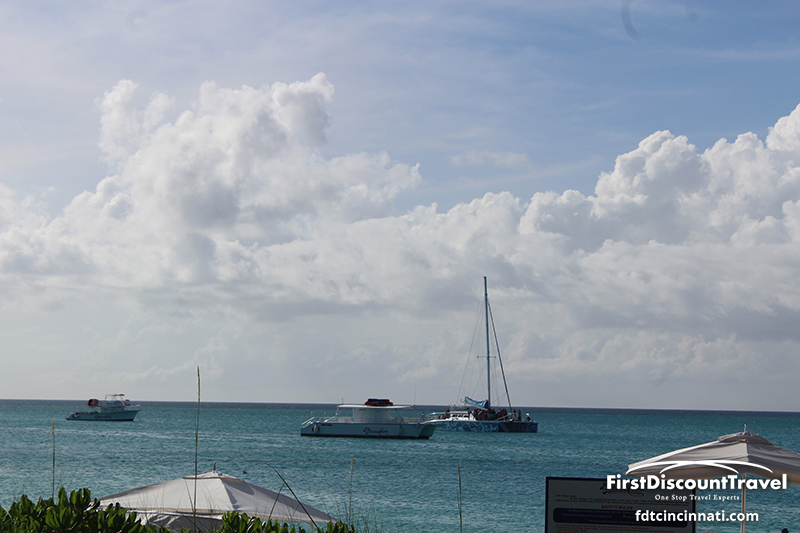 SCUBA (if you’re certified) and snorkeling trips are included as well. 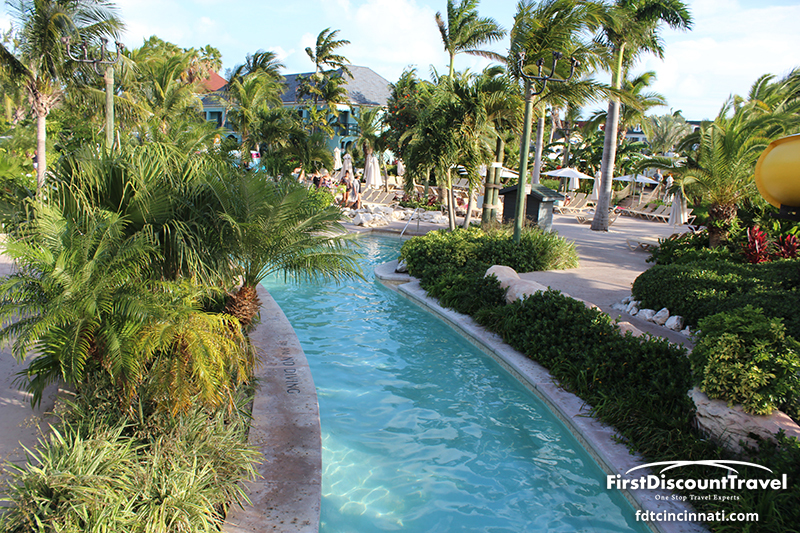 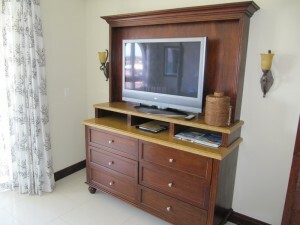 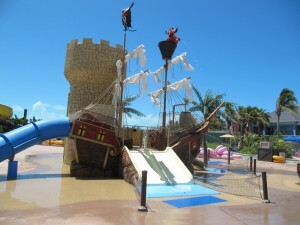 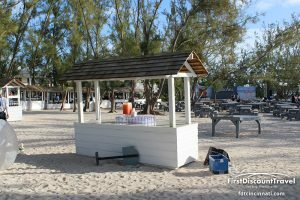 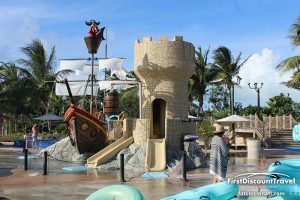 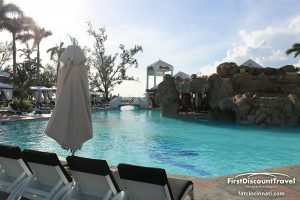 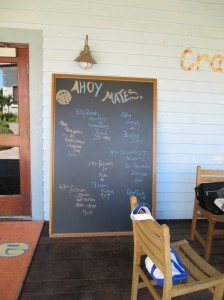 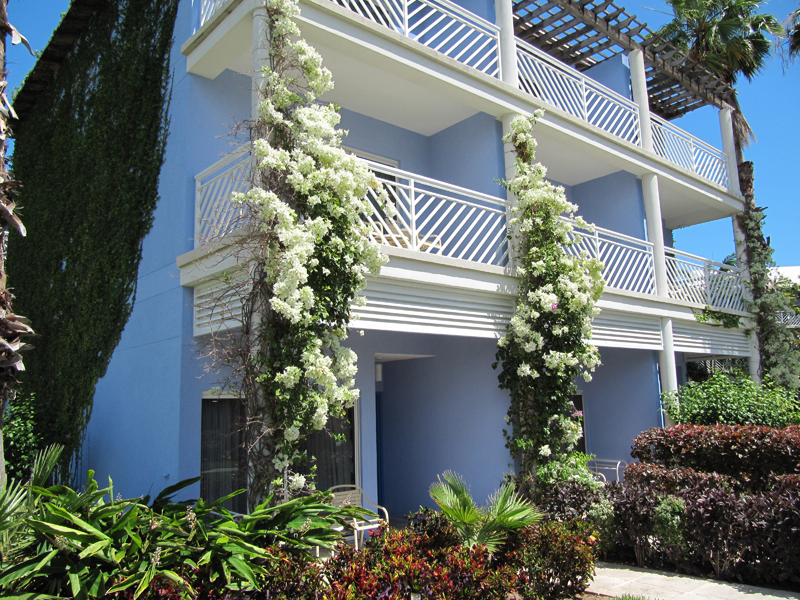 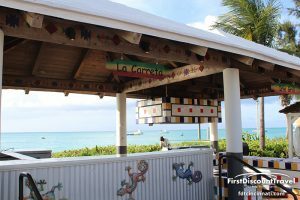 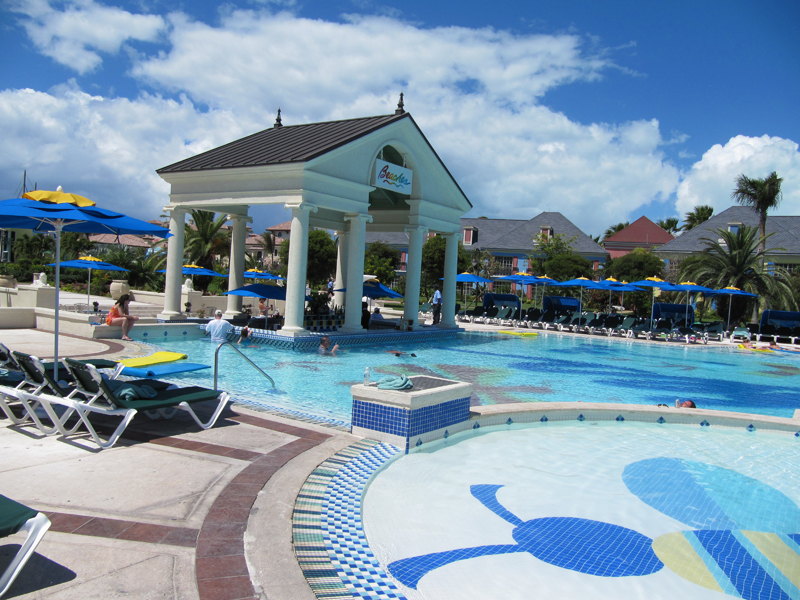 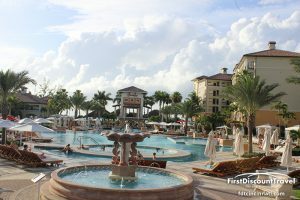 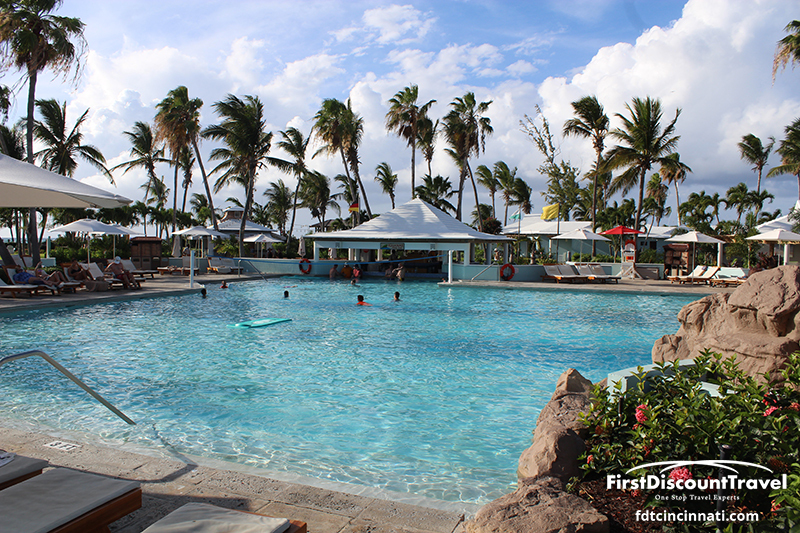 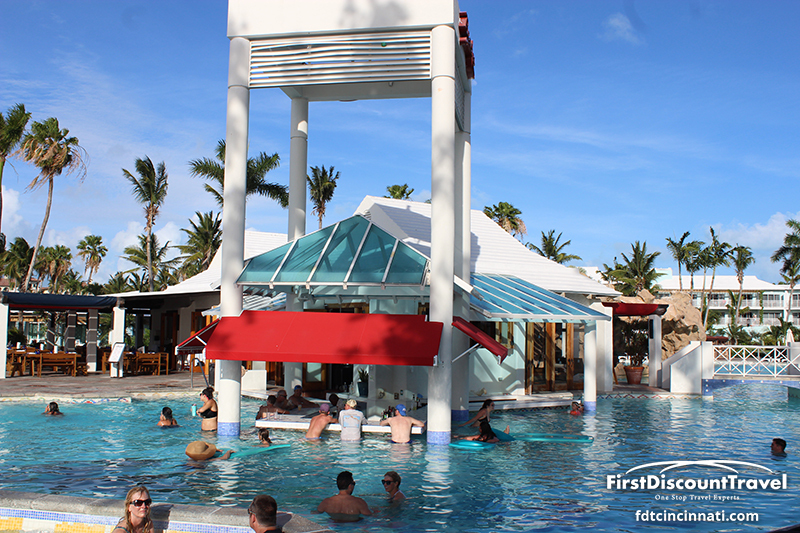 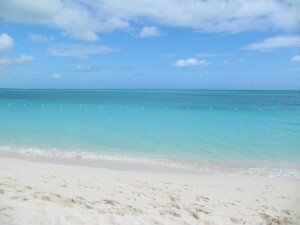 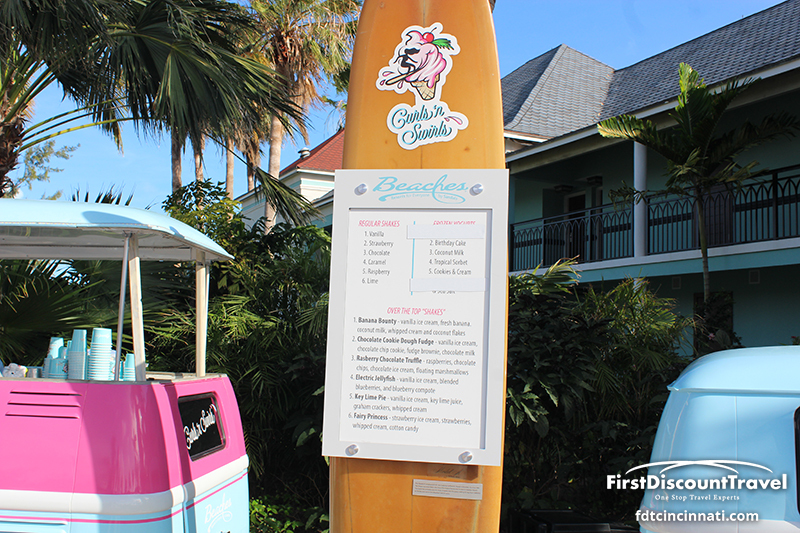 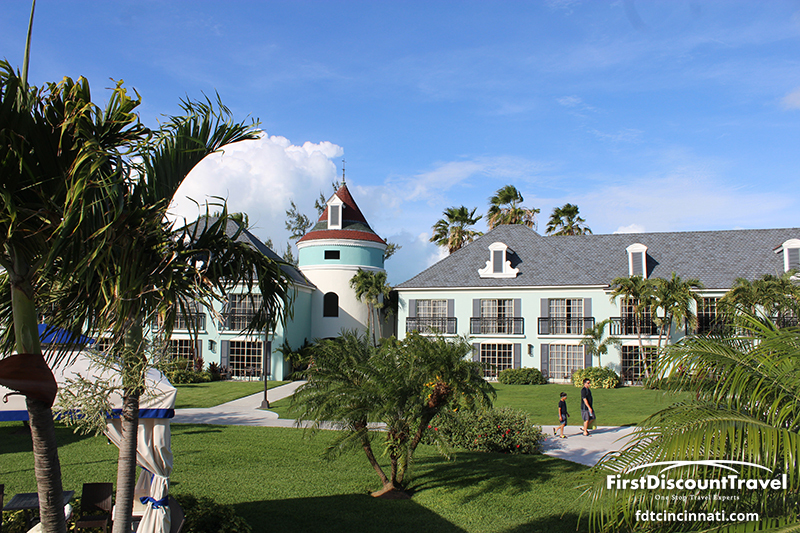 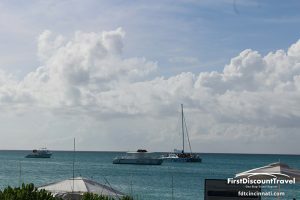 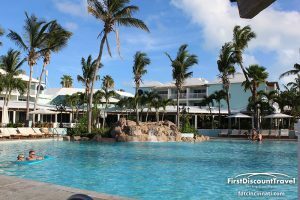 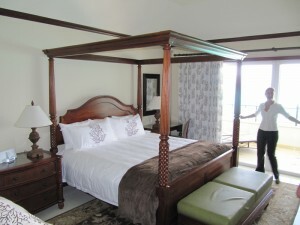 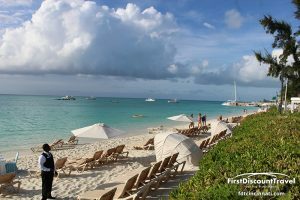 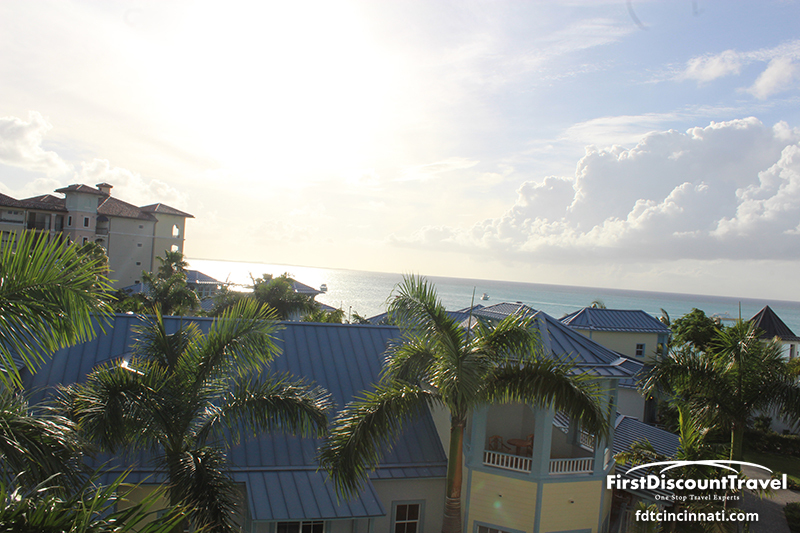 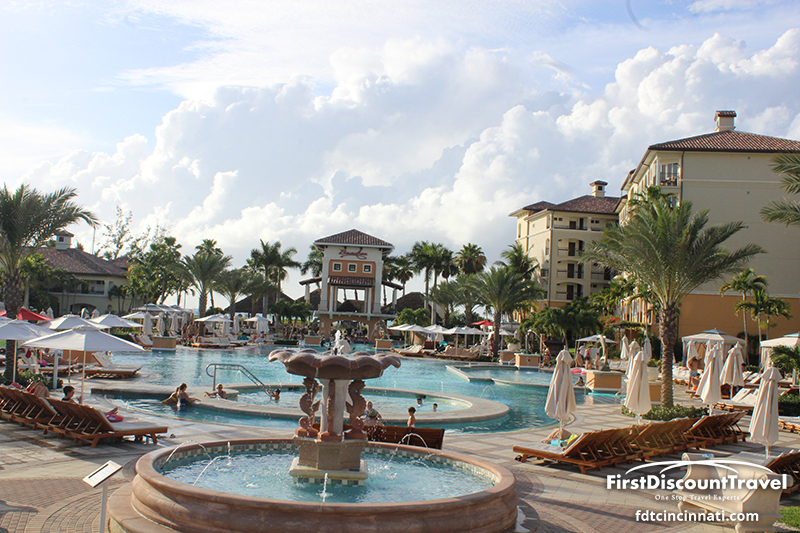 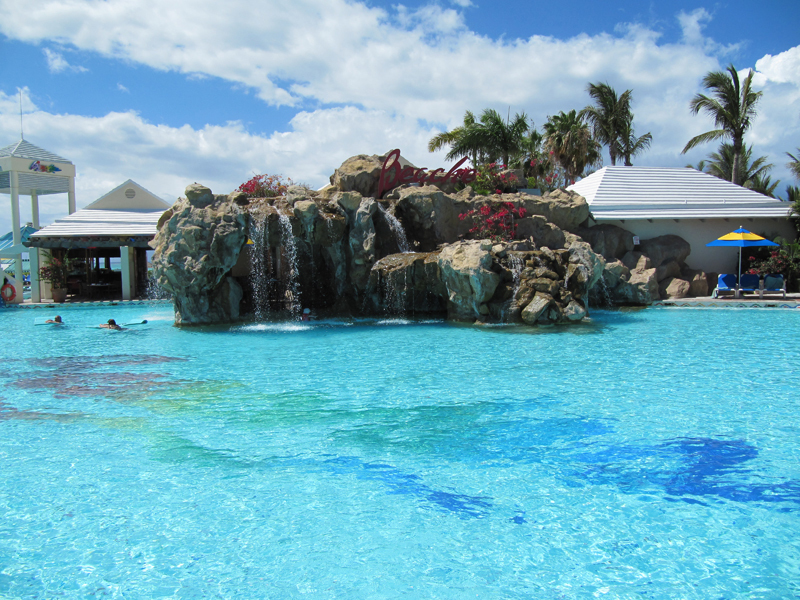 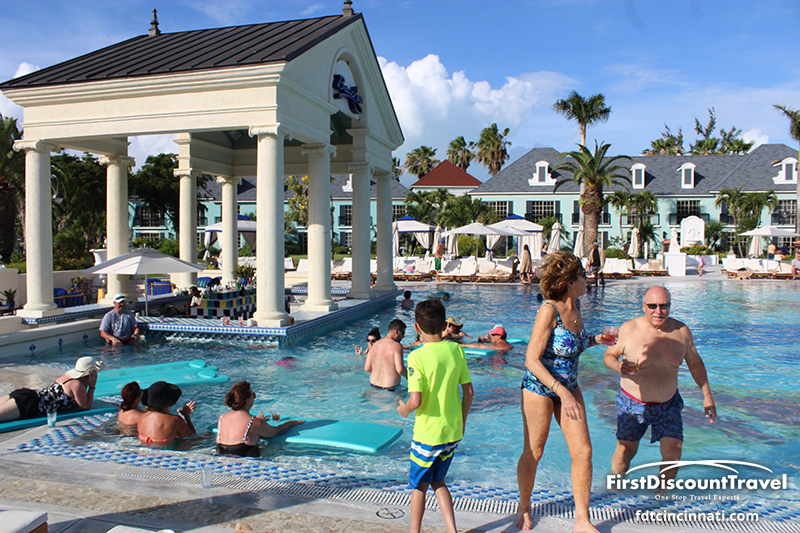 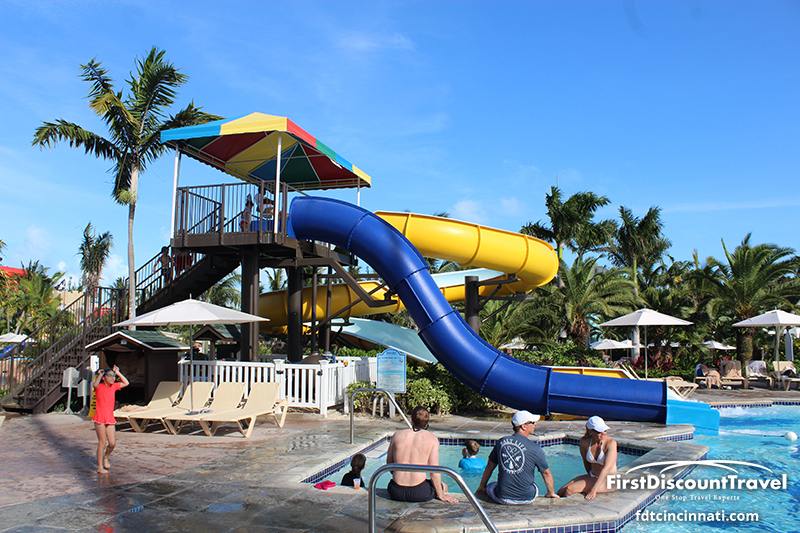 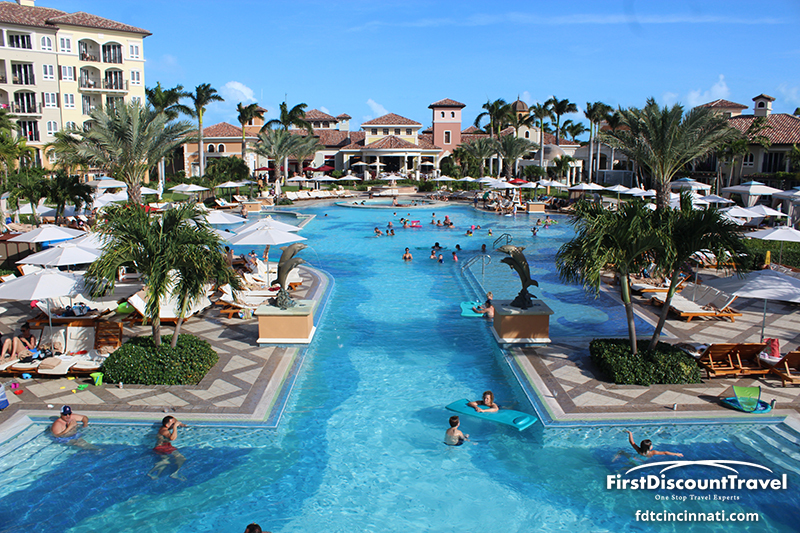 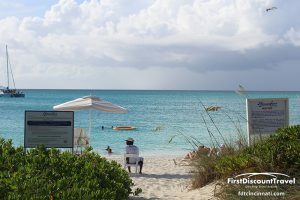 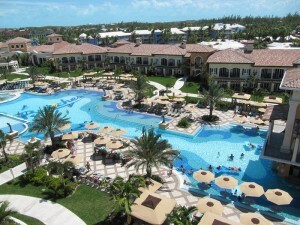 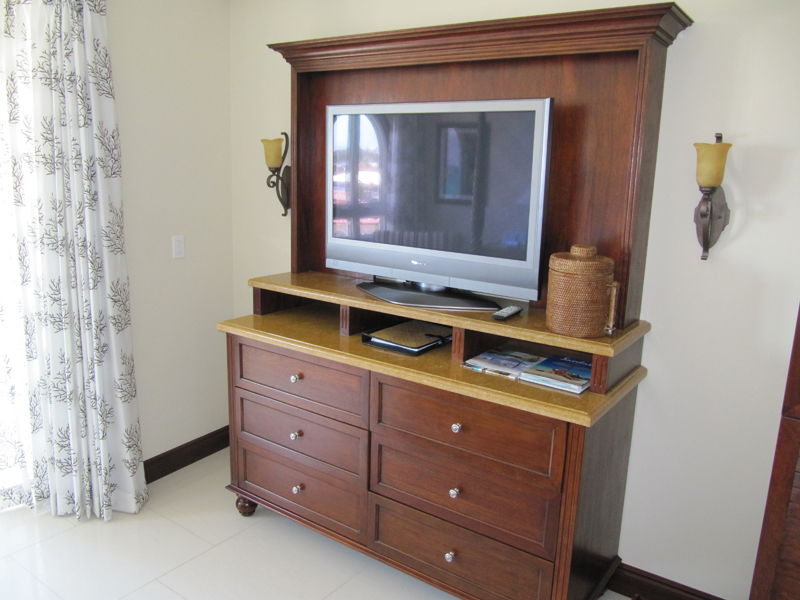 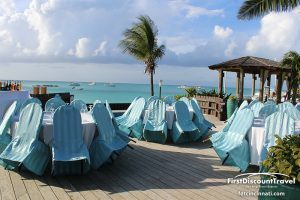 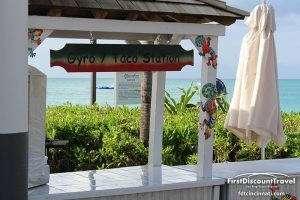 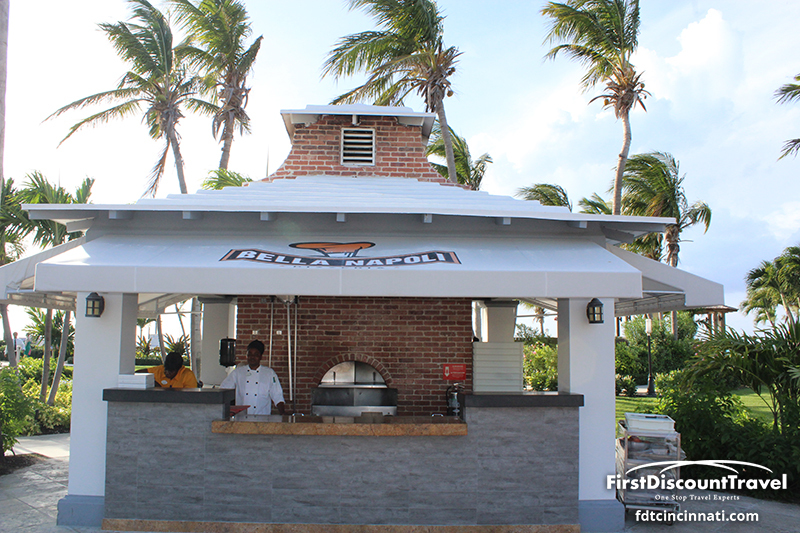 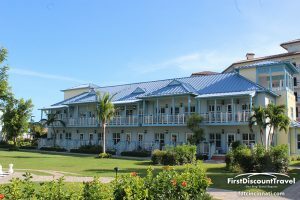 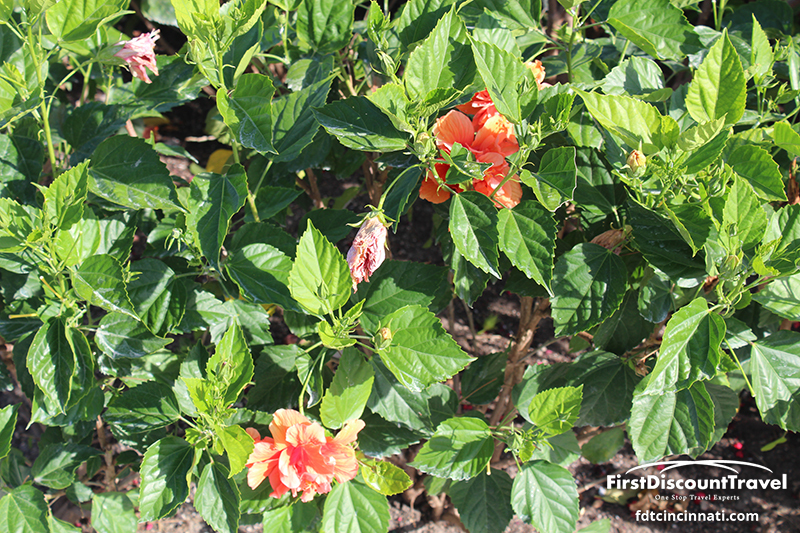 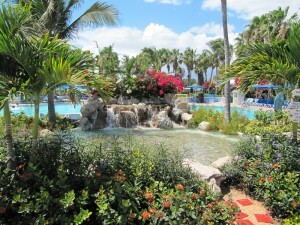 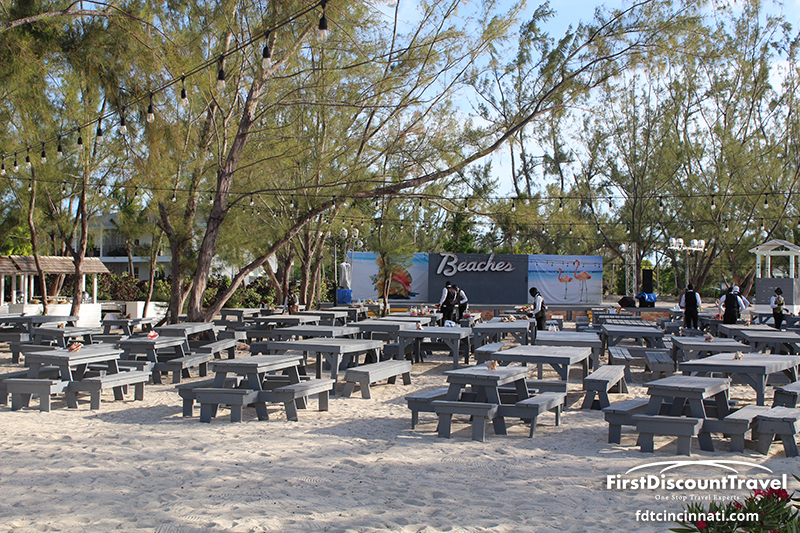 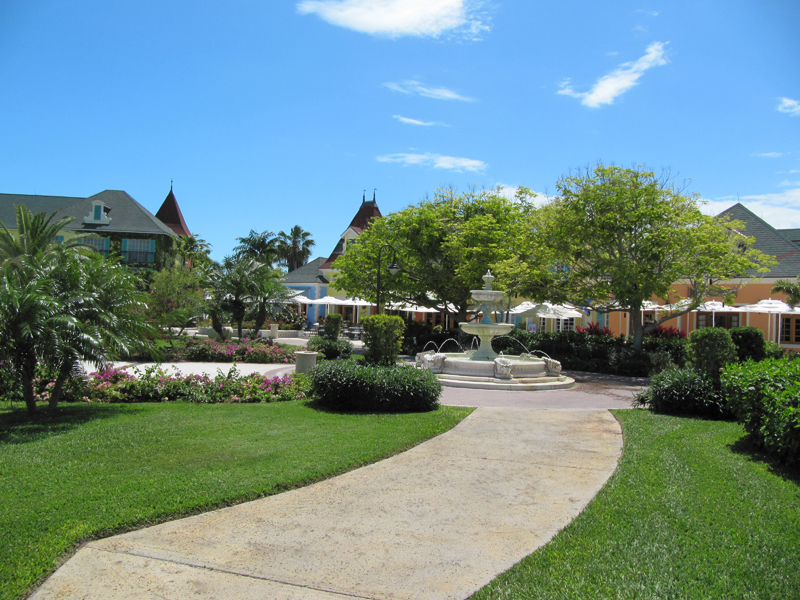 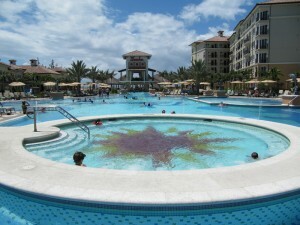 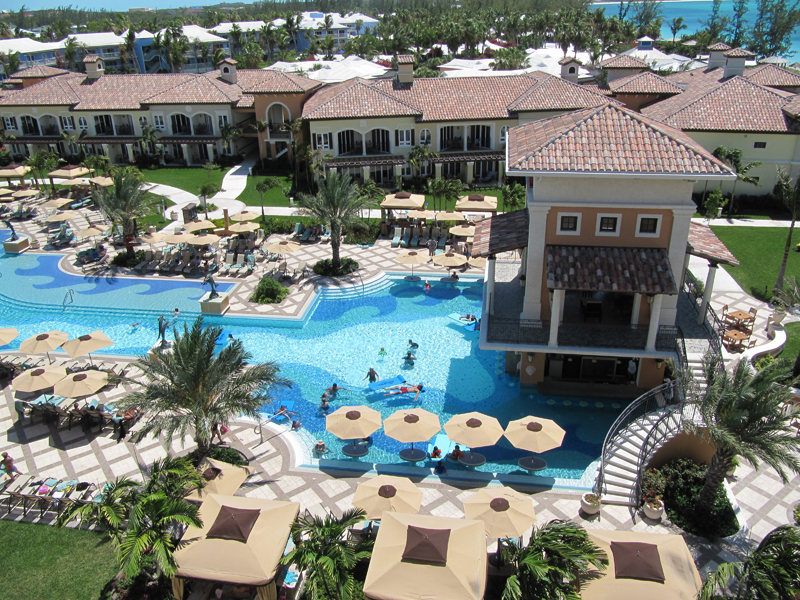 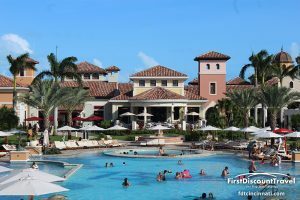 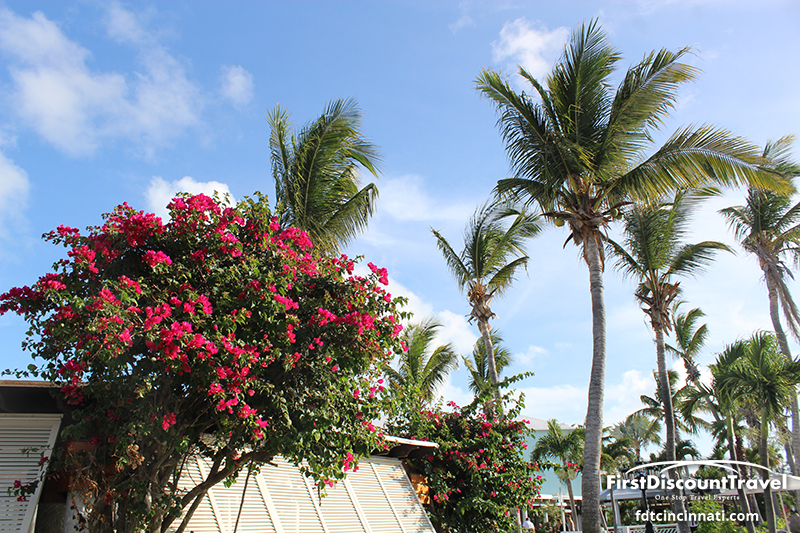 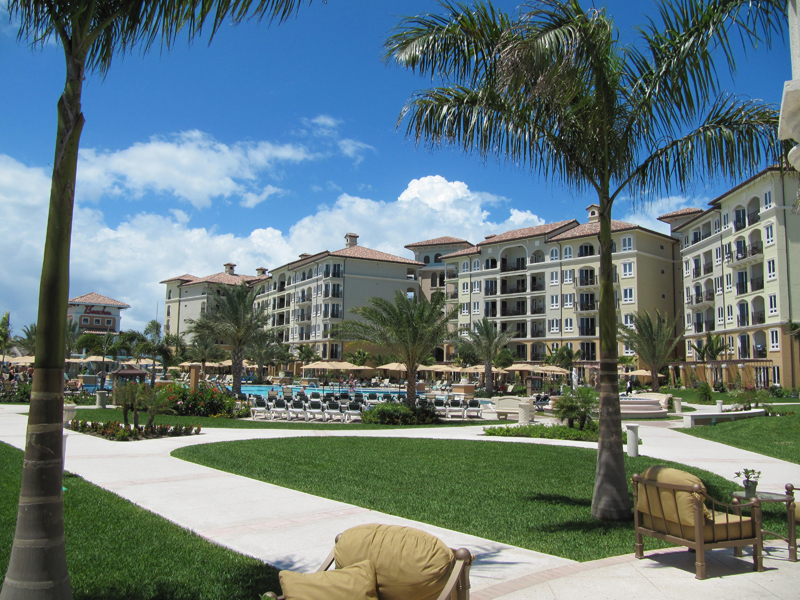 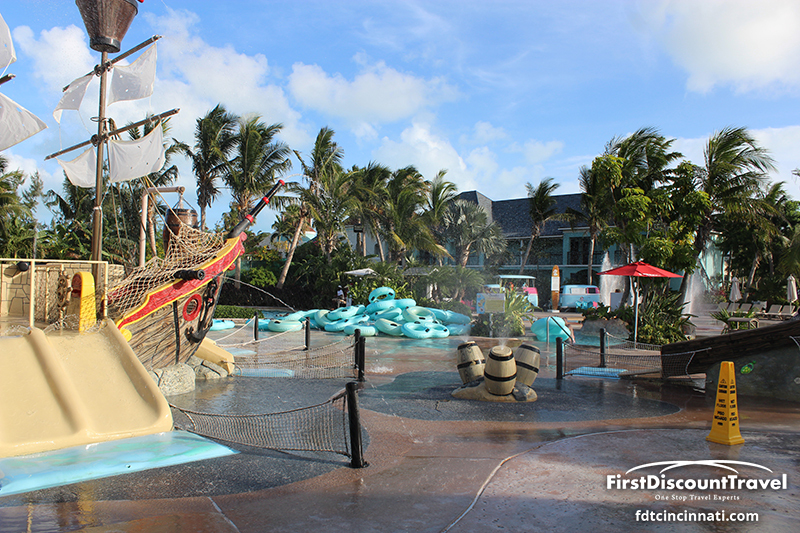 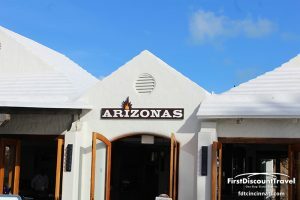 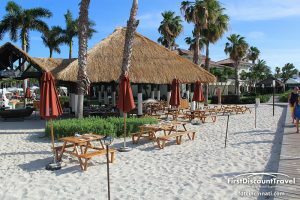 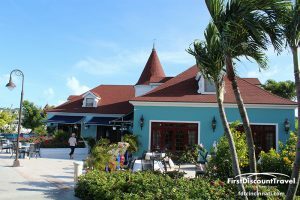 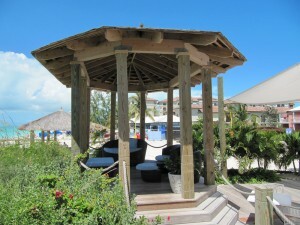 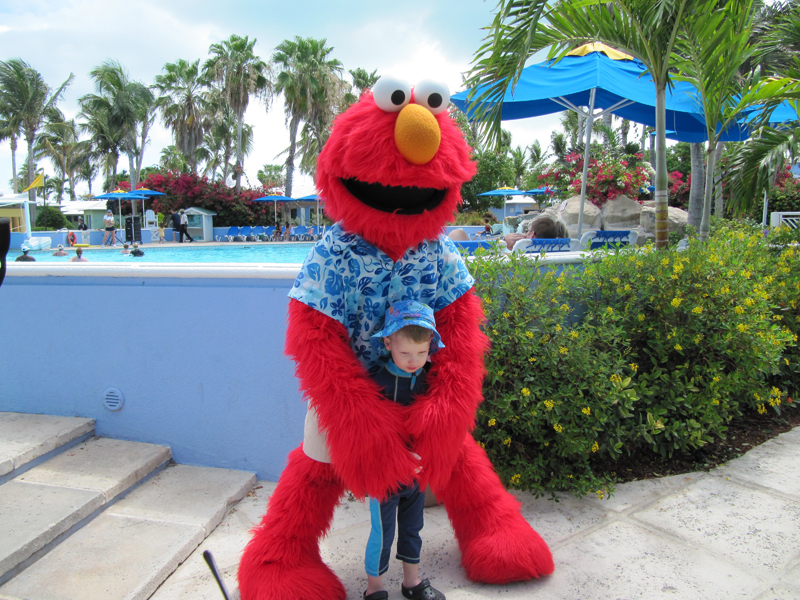 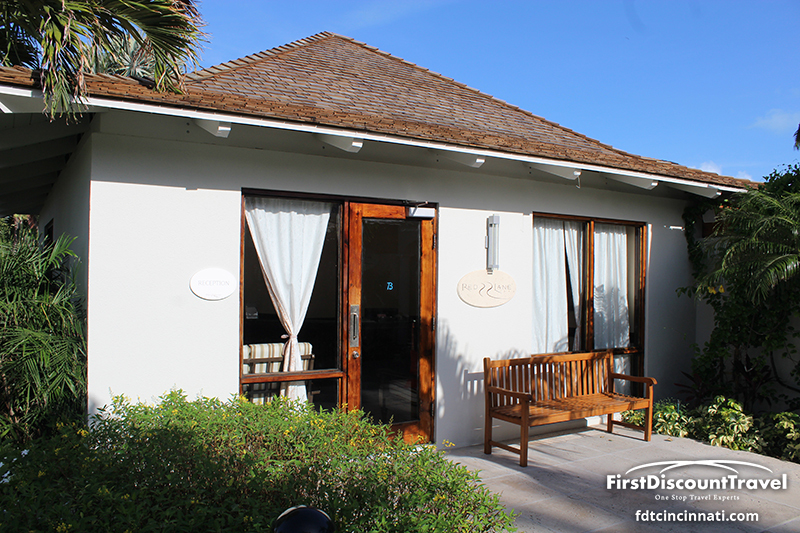 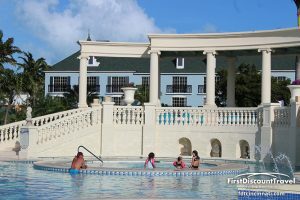 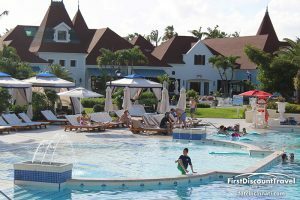 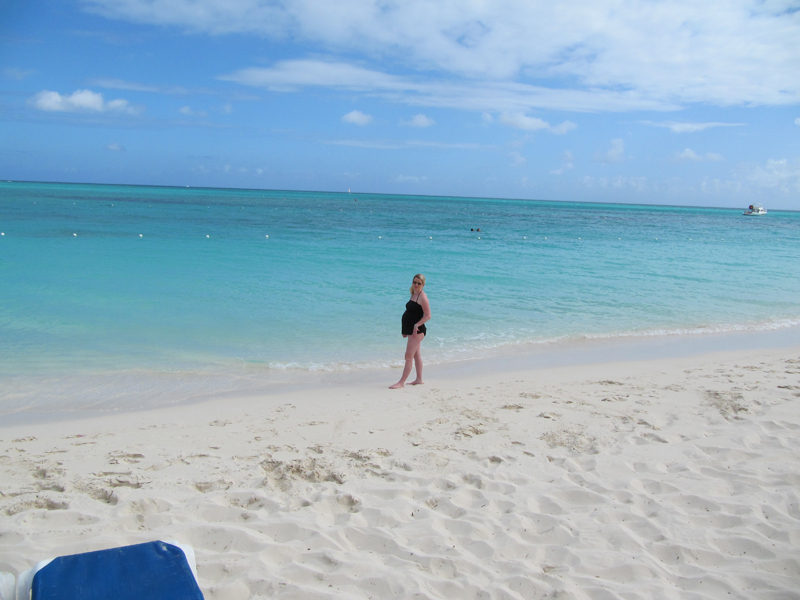 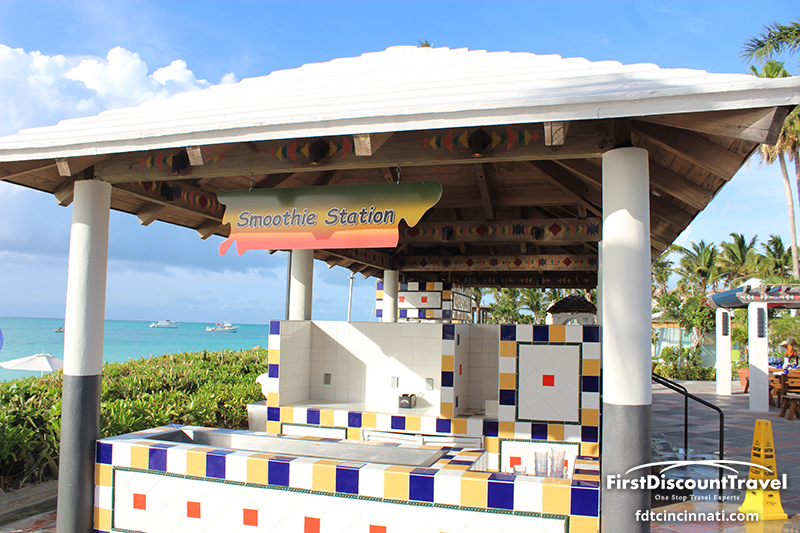 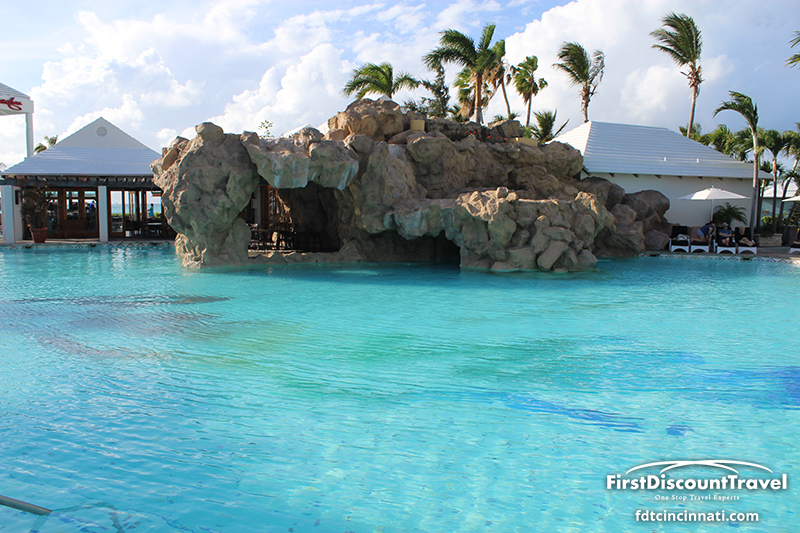 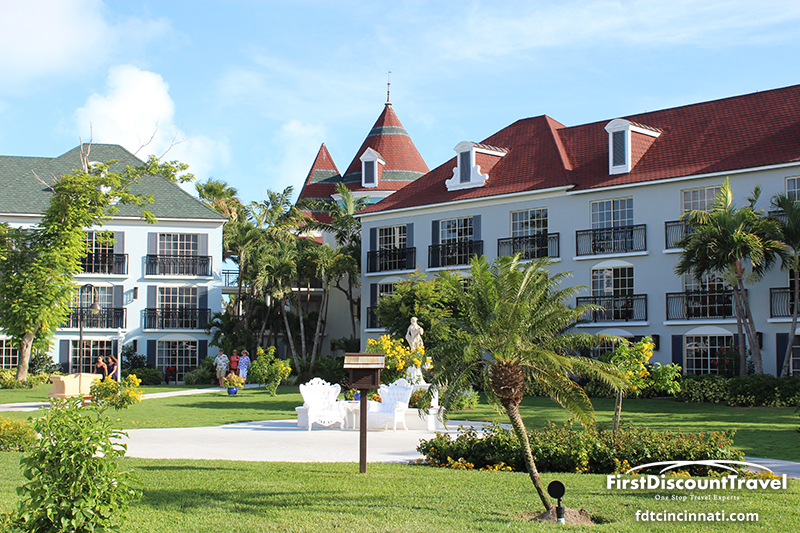 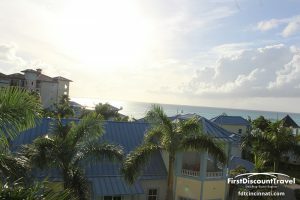 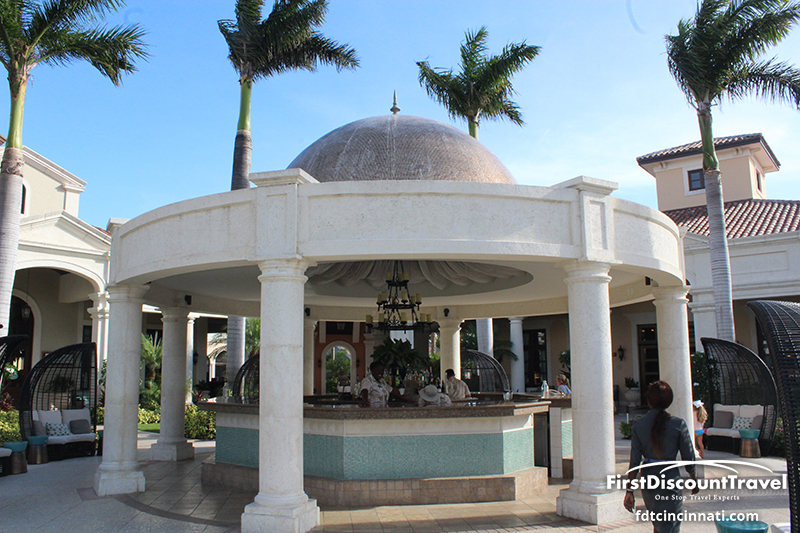 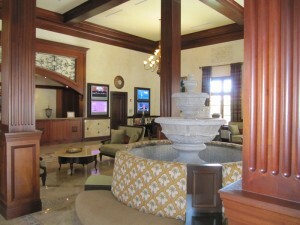 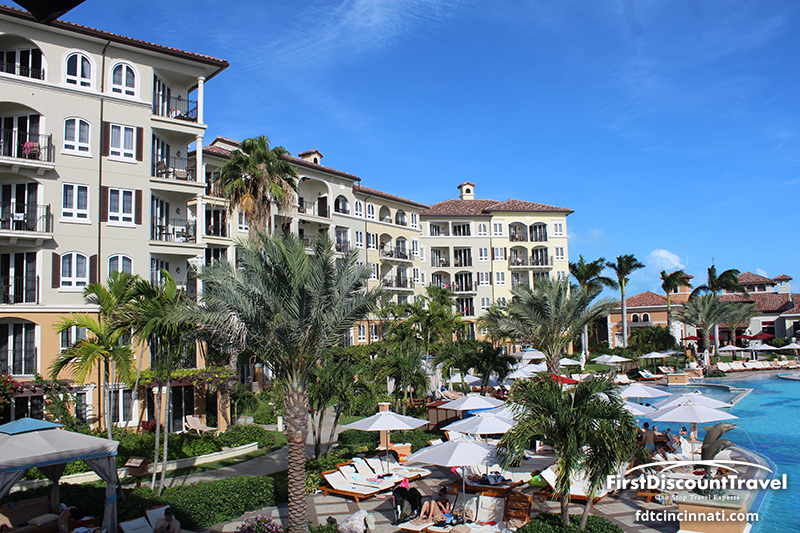 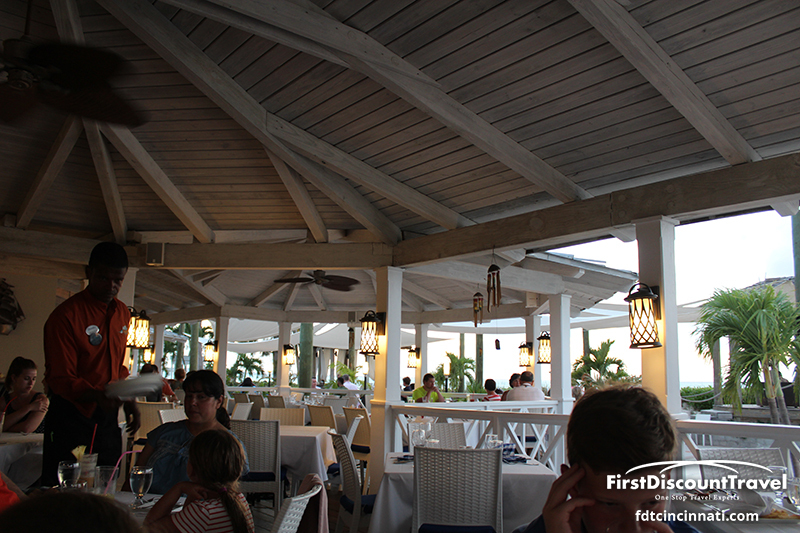 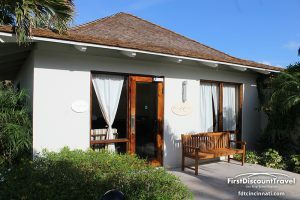 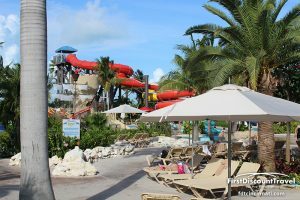 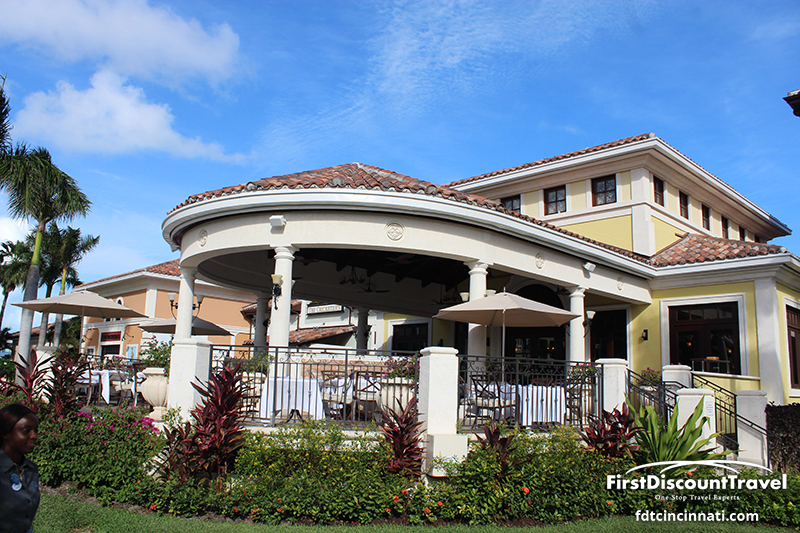 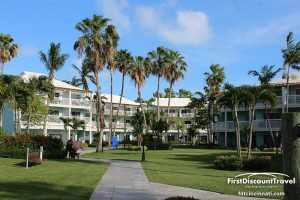 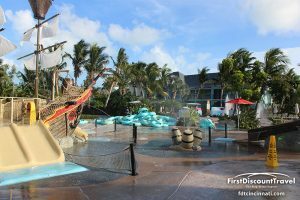 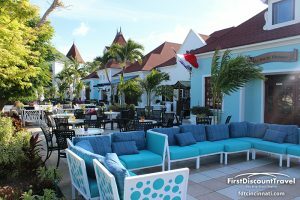 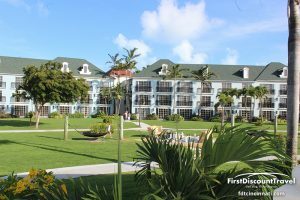 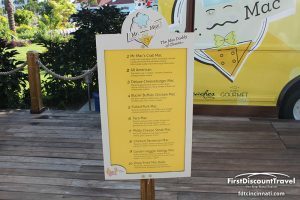 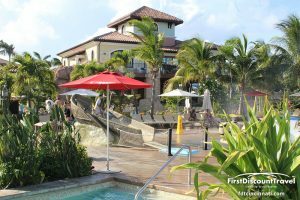 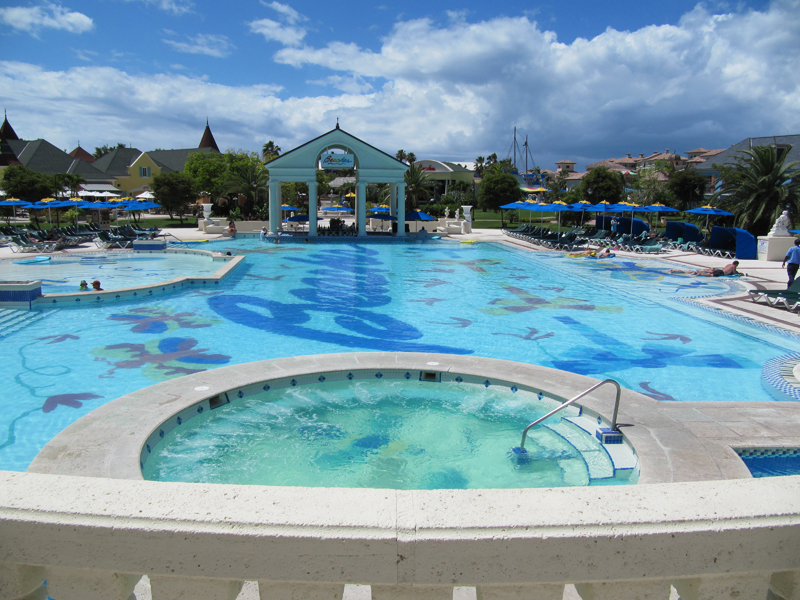 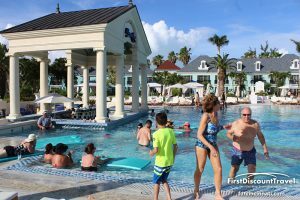 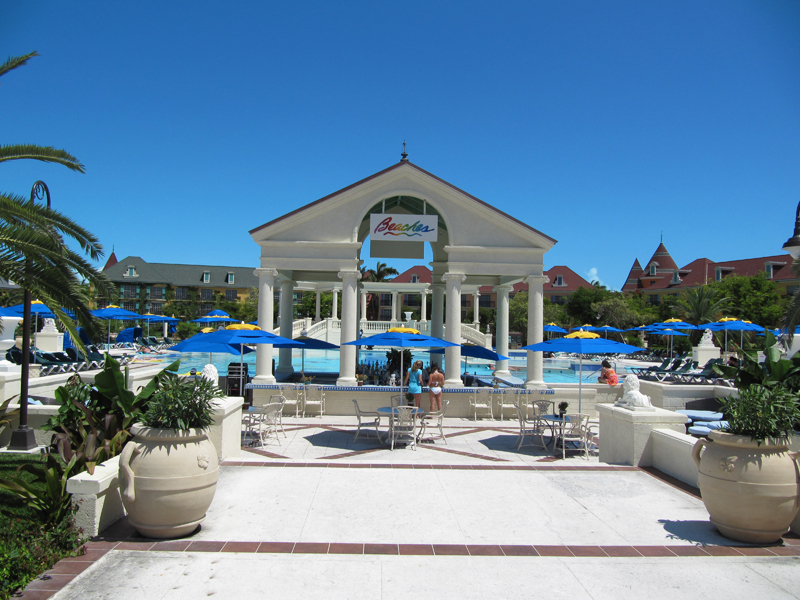 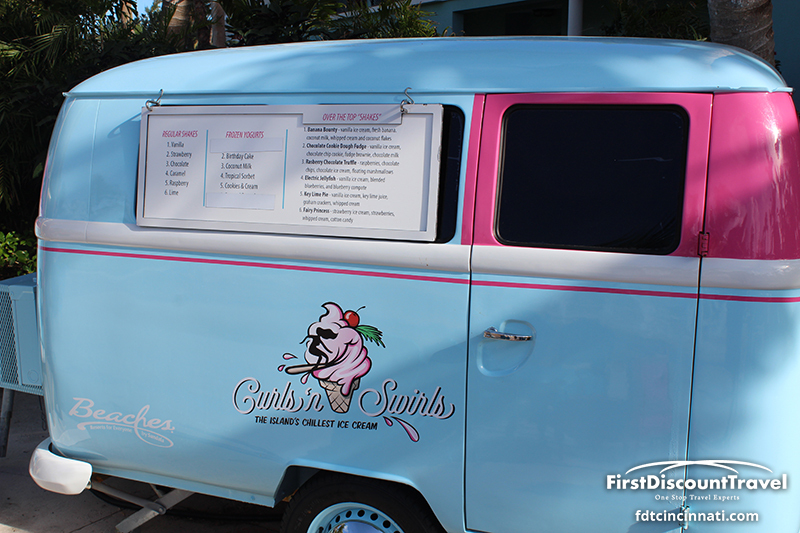 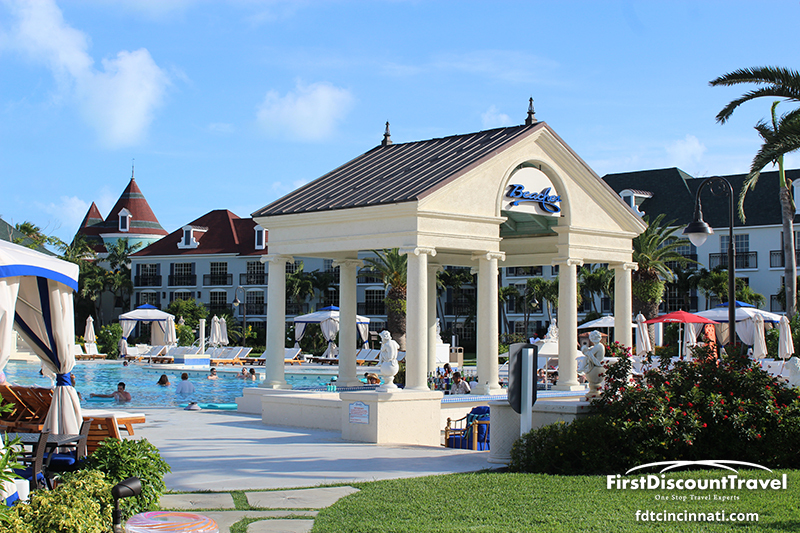 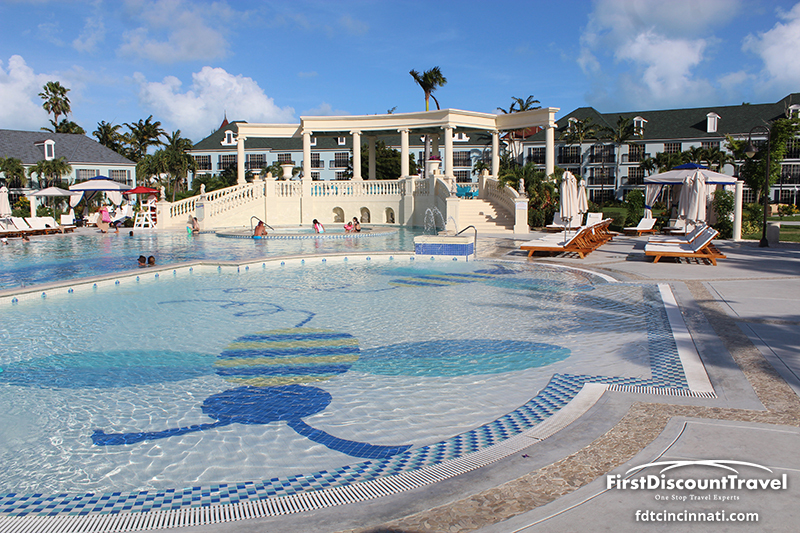 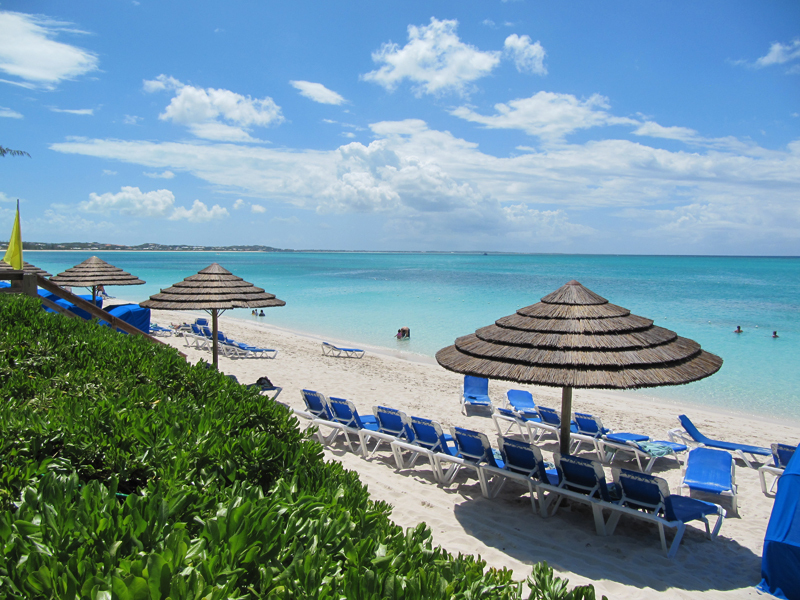 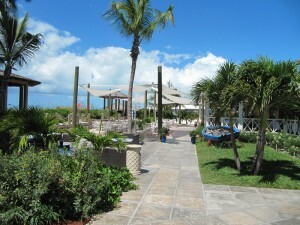 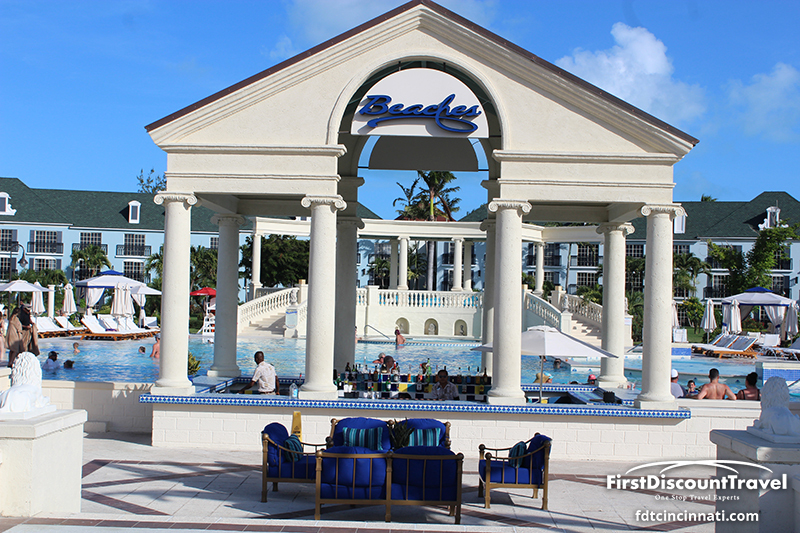 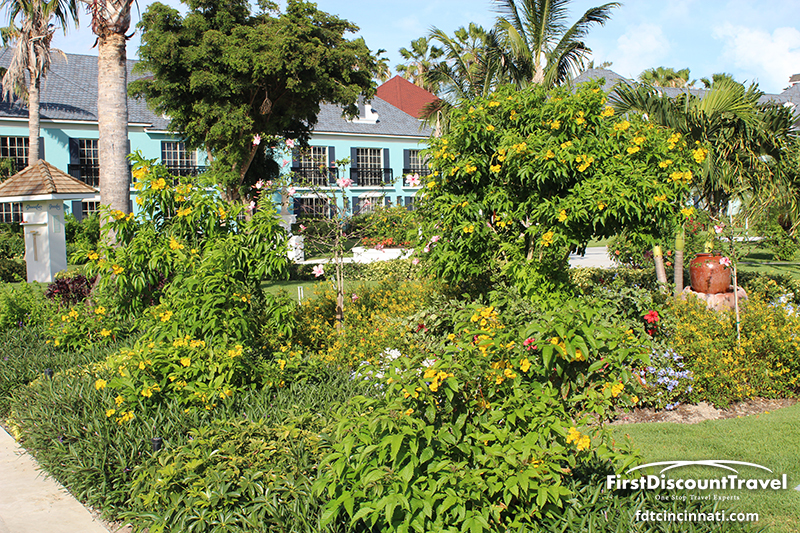 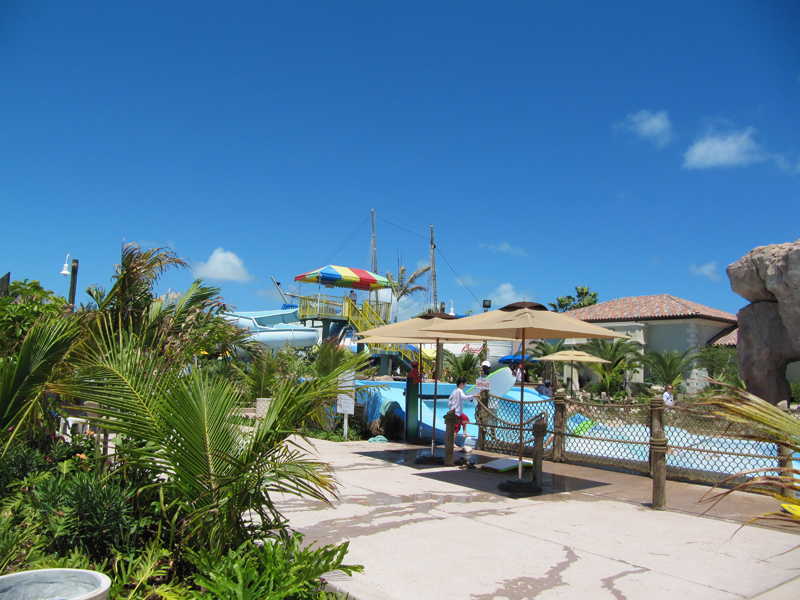 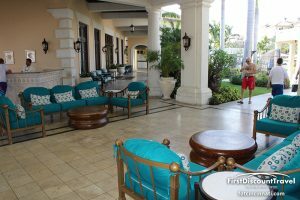 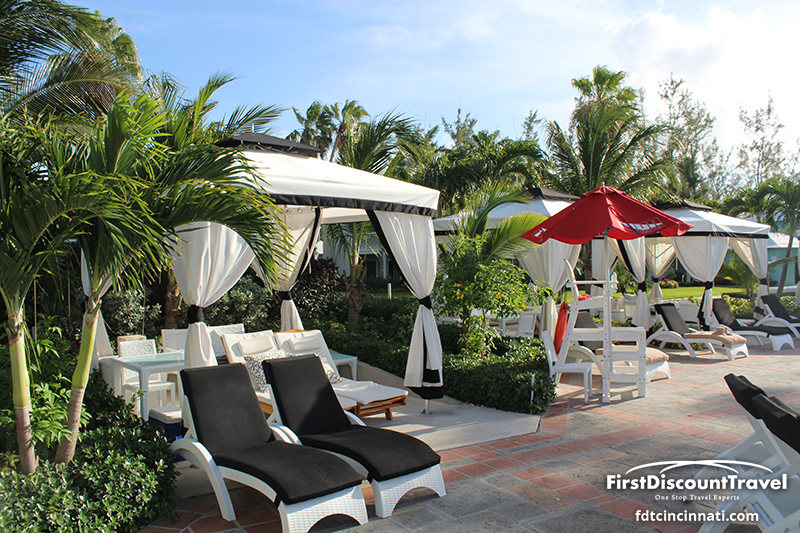 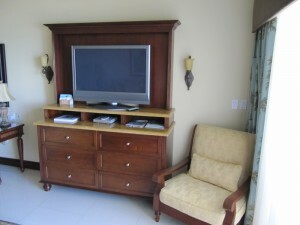 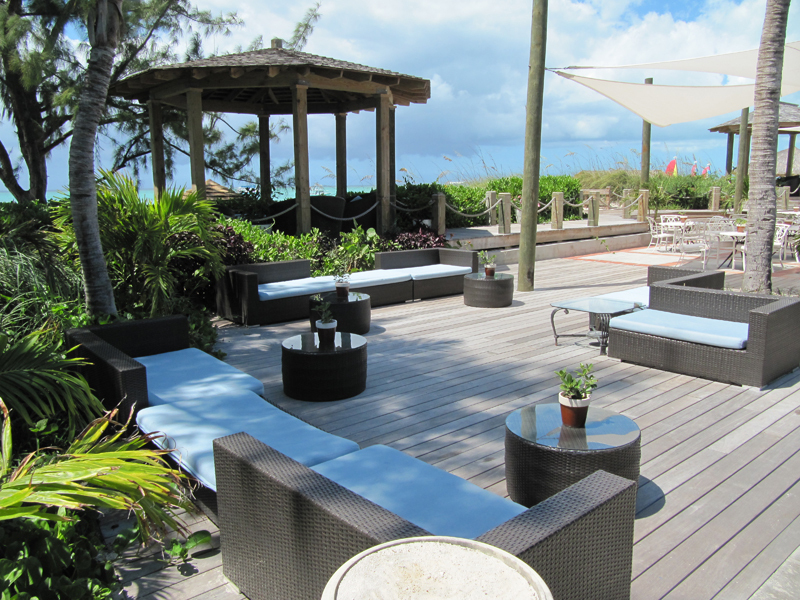 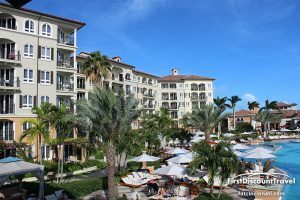 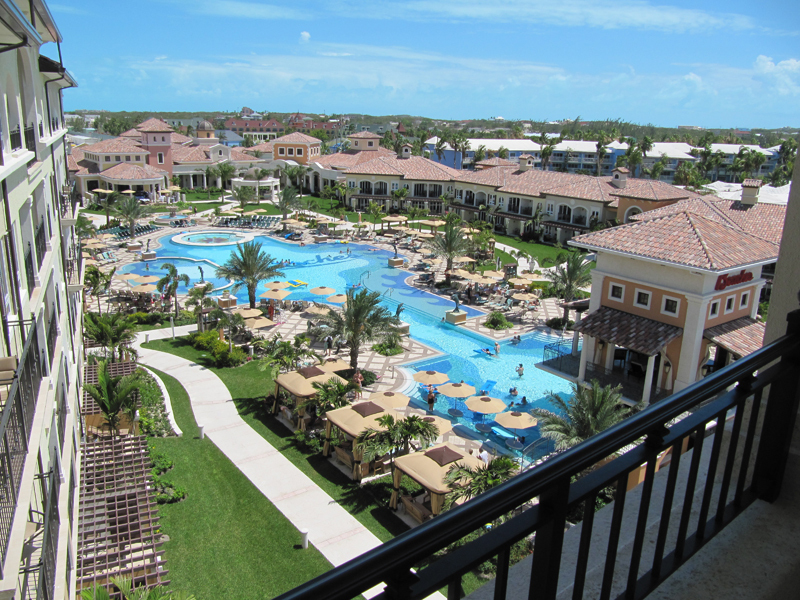 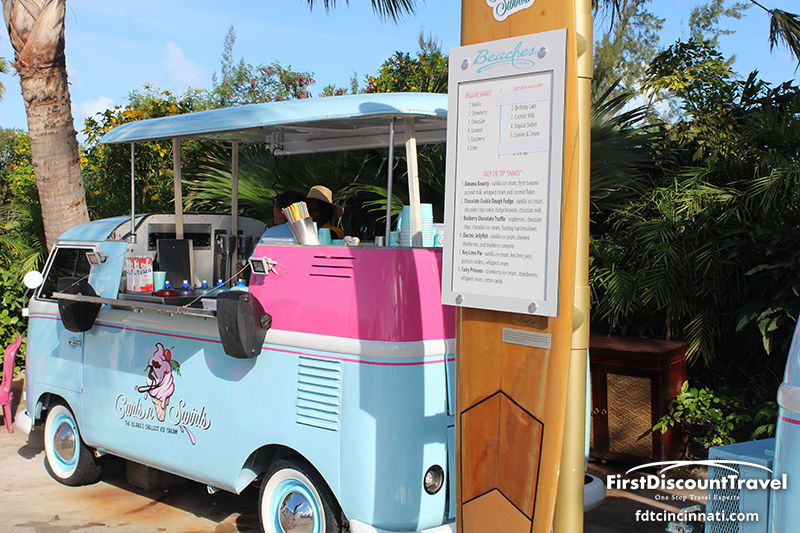 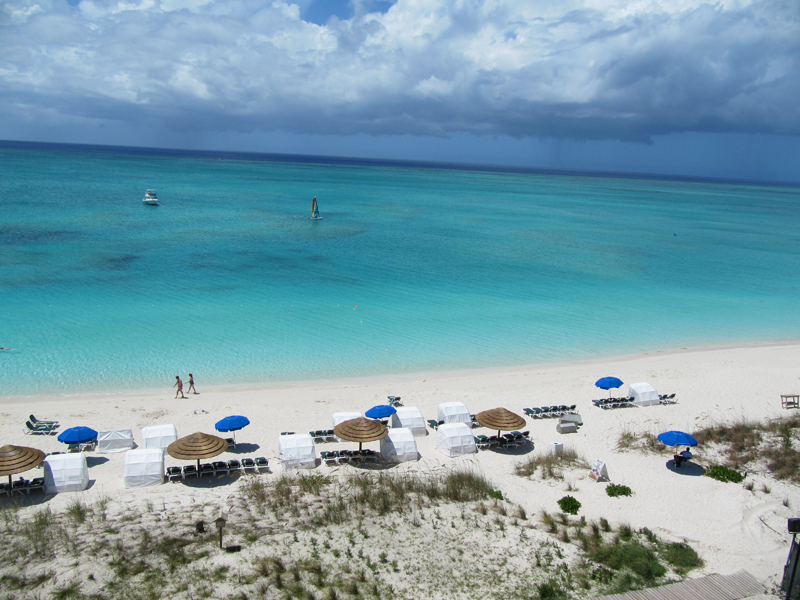 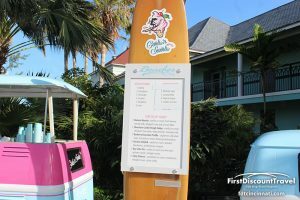 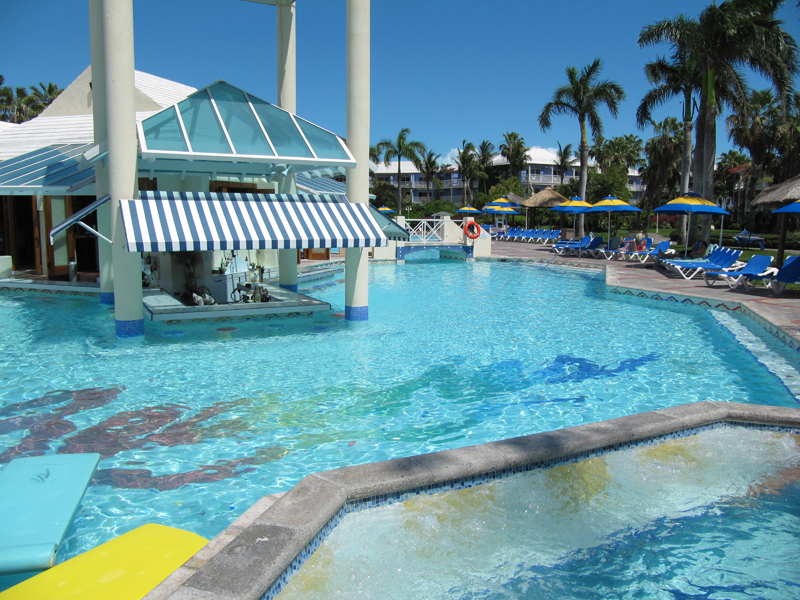 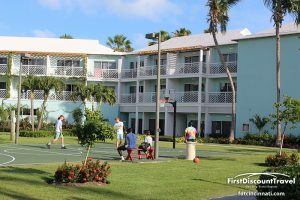 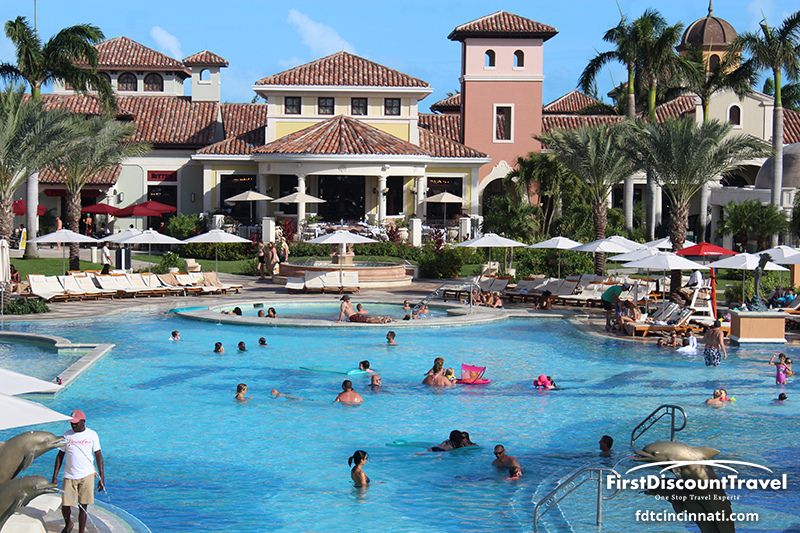 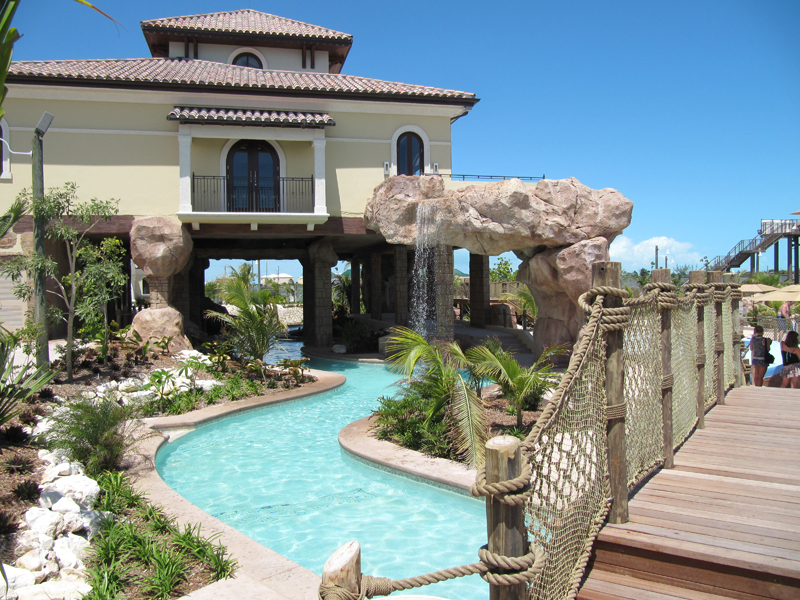 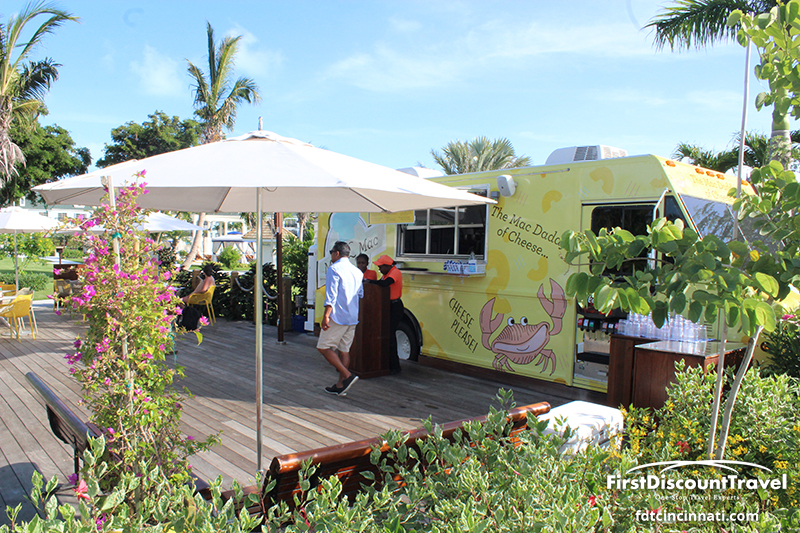 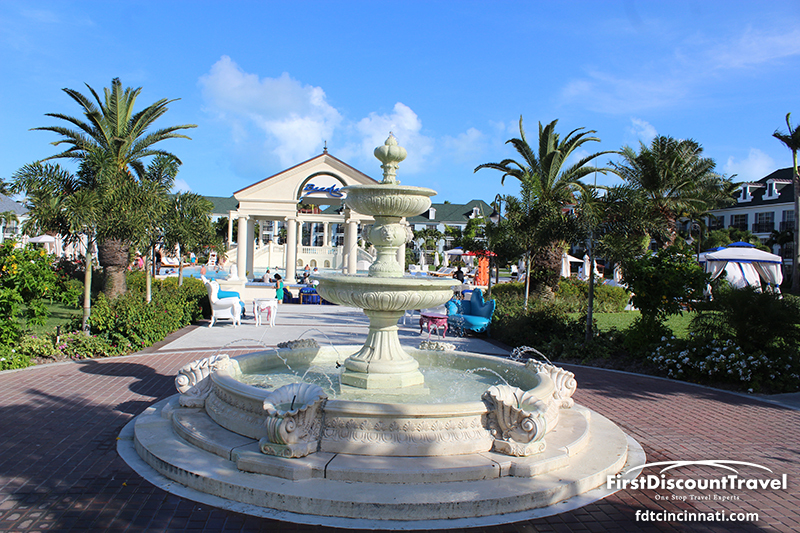 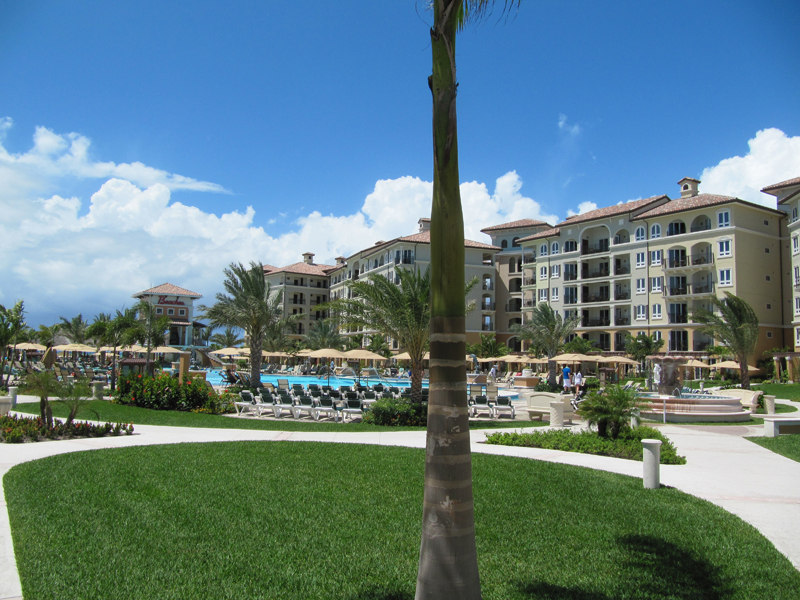 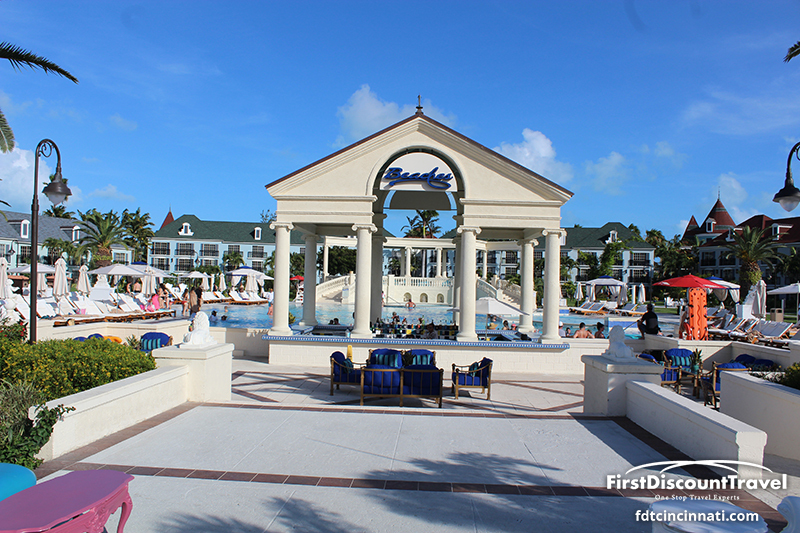 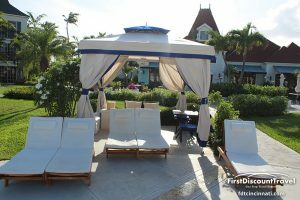 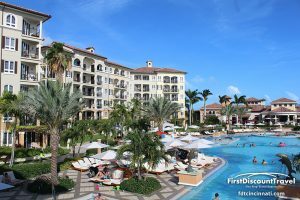 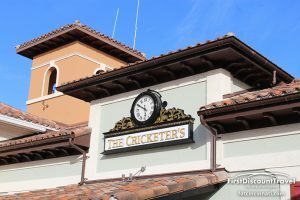 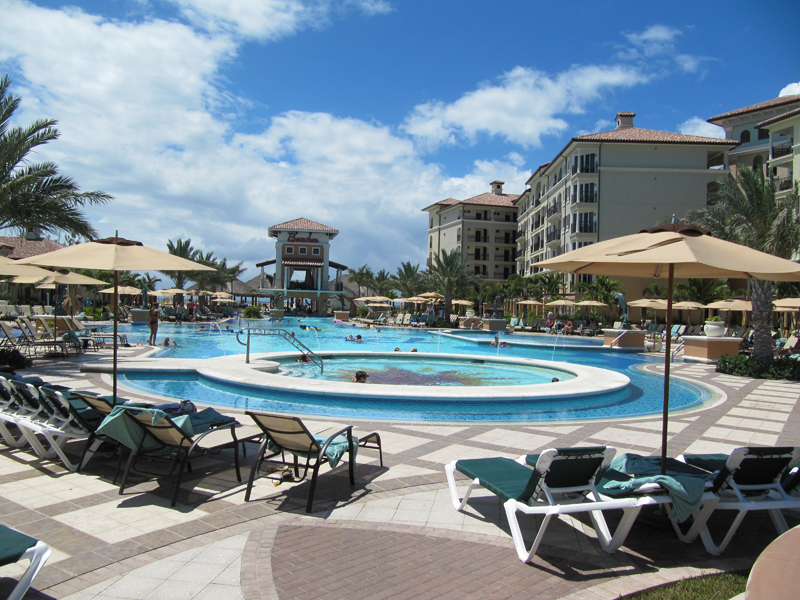 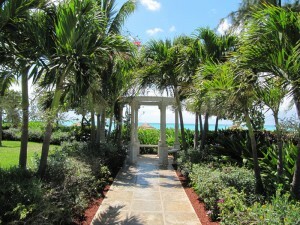 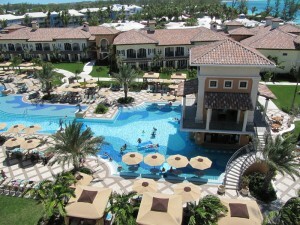 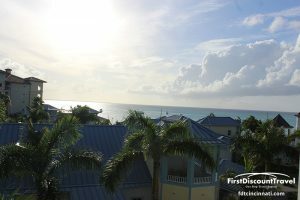 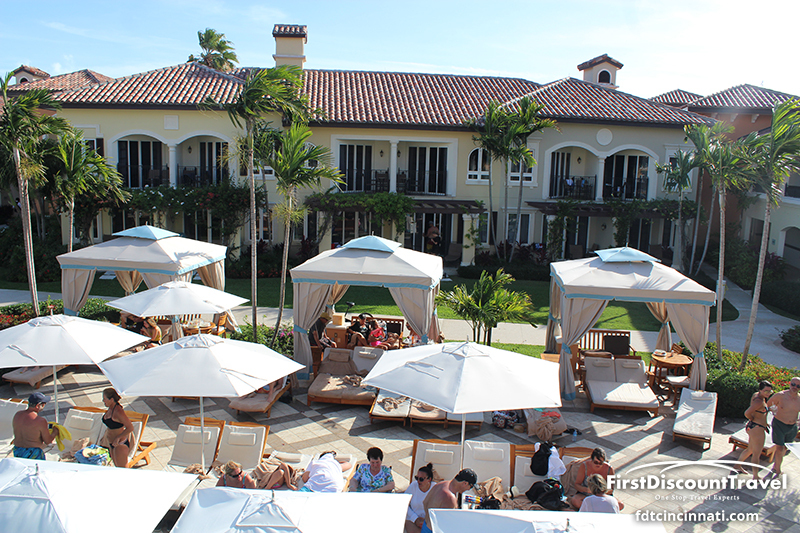 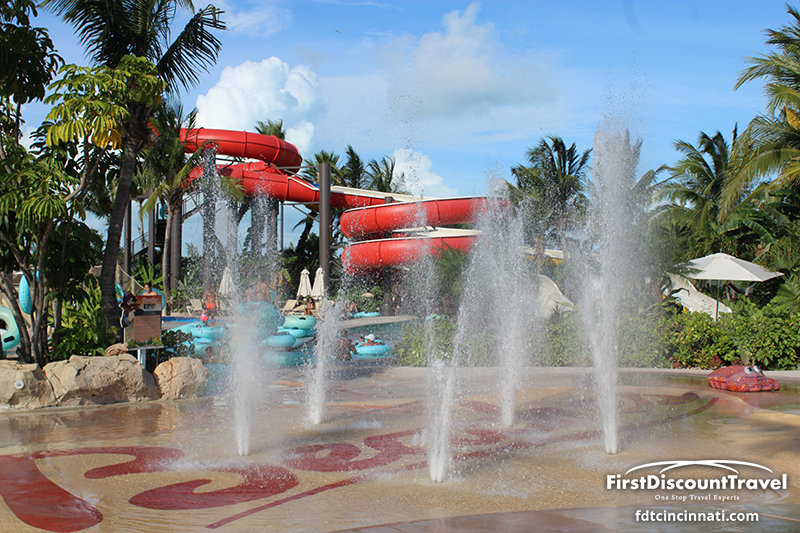 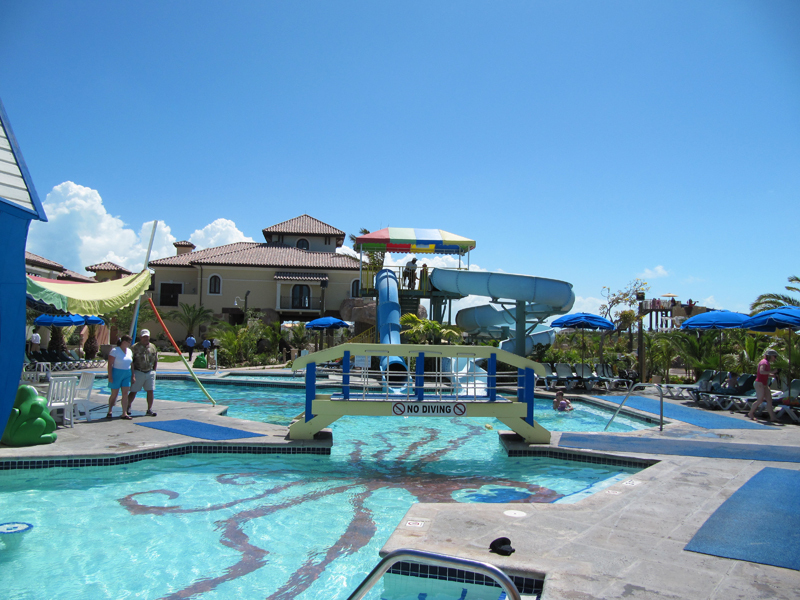 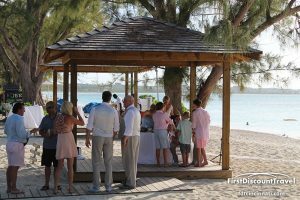 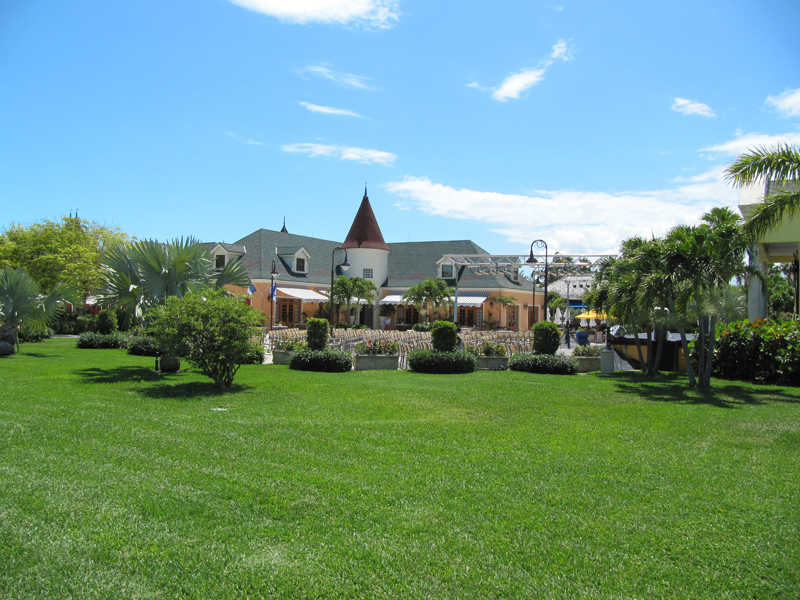 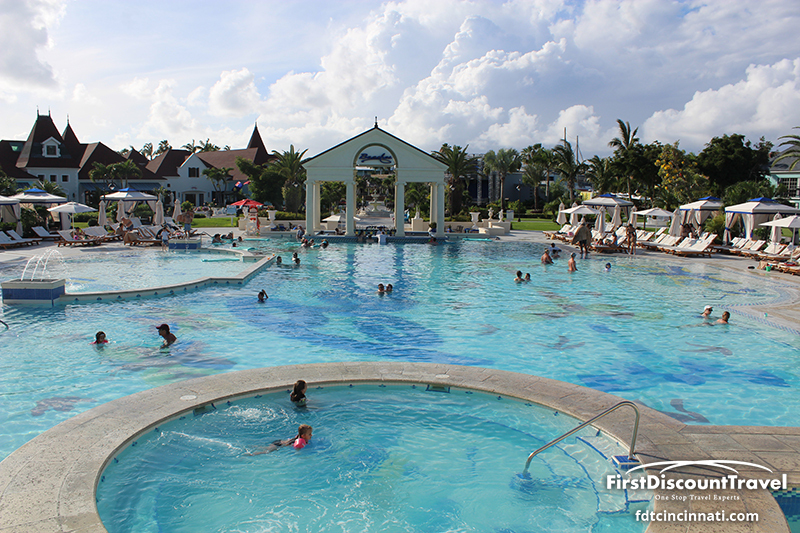 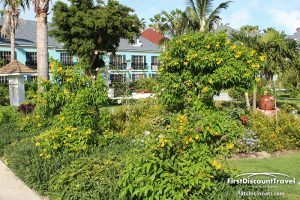 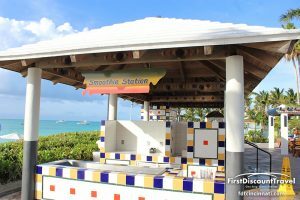 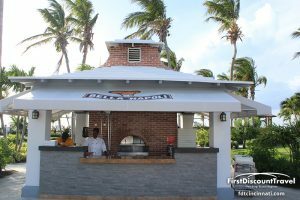 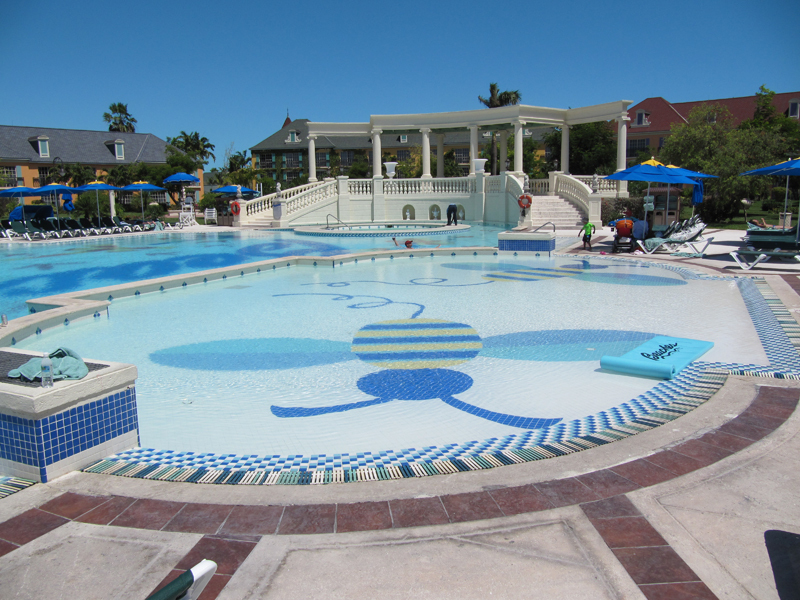 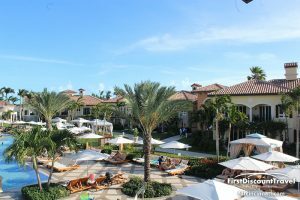 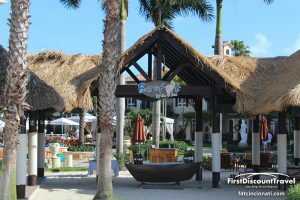 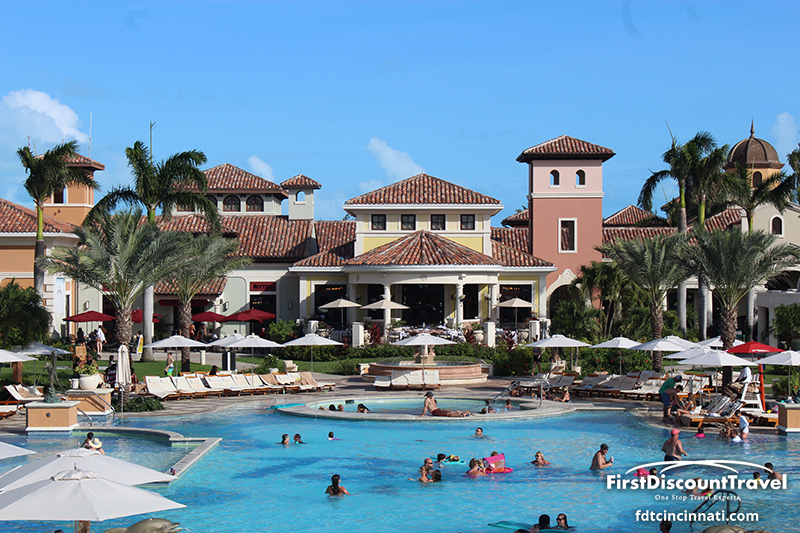 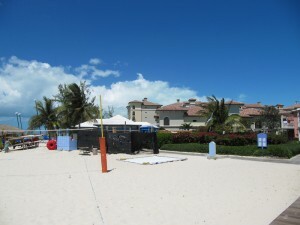 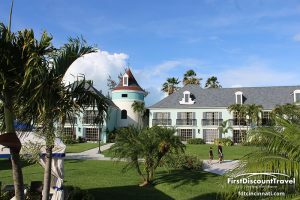 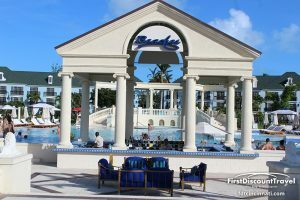 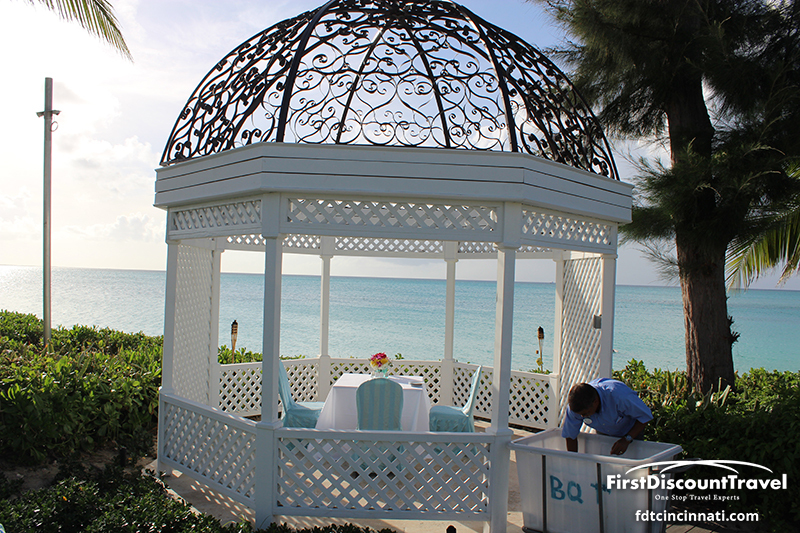 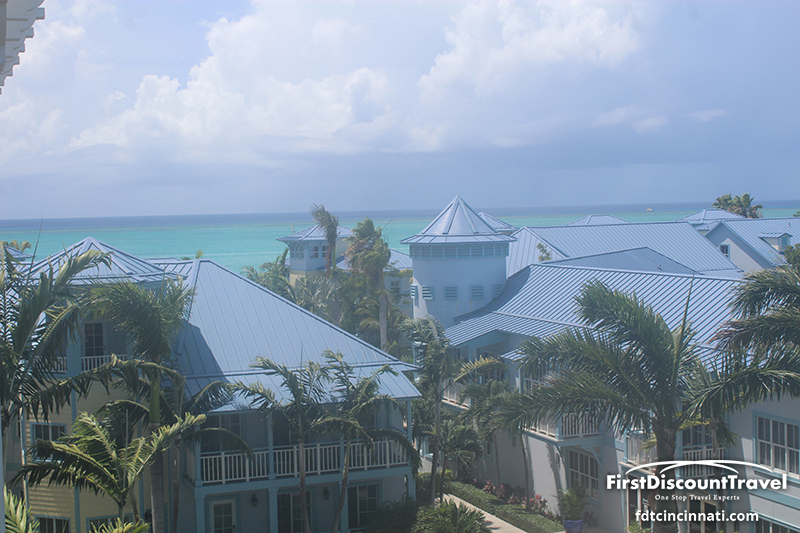 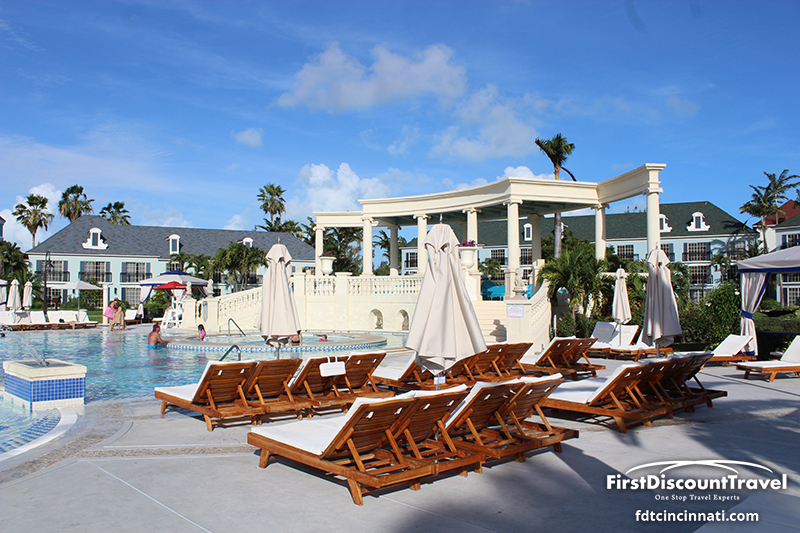 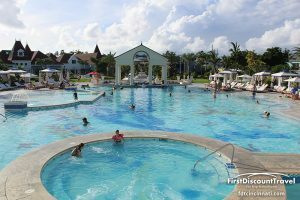 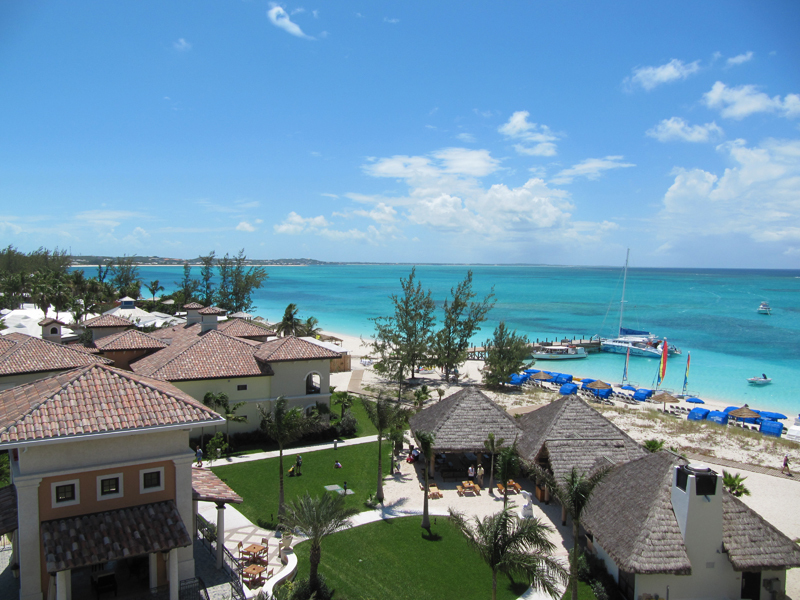 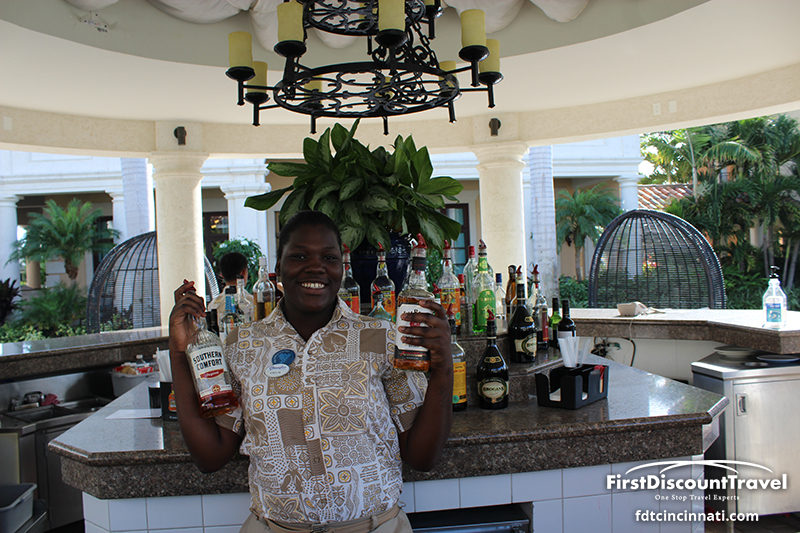 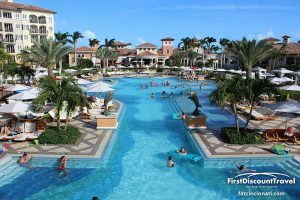 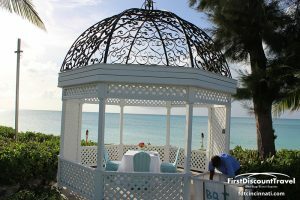 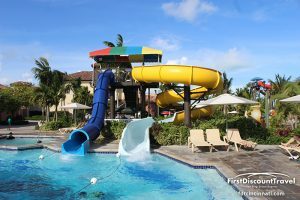 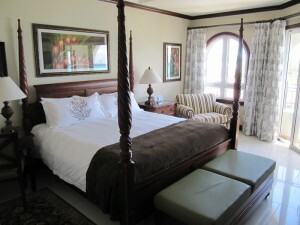 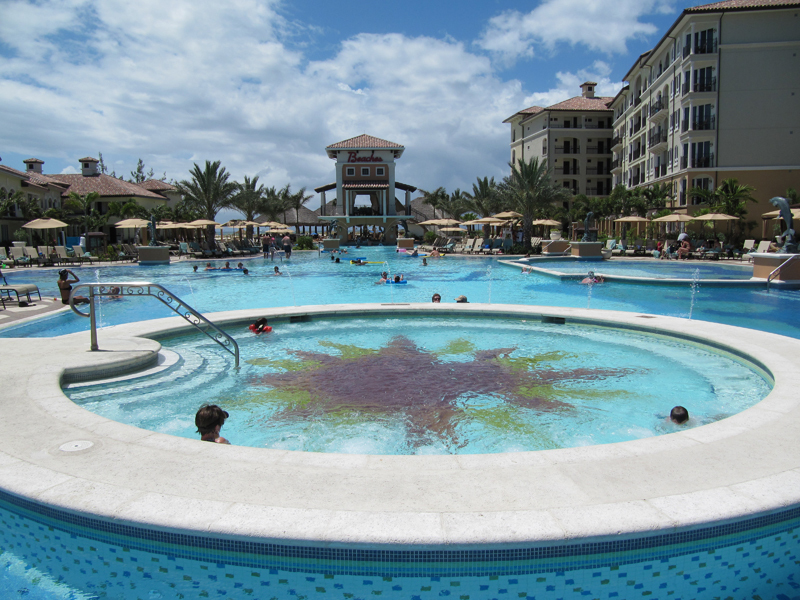 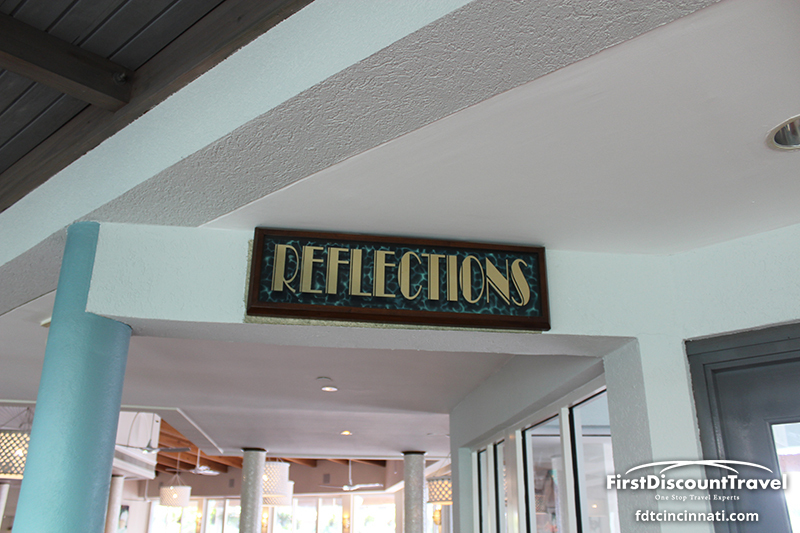 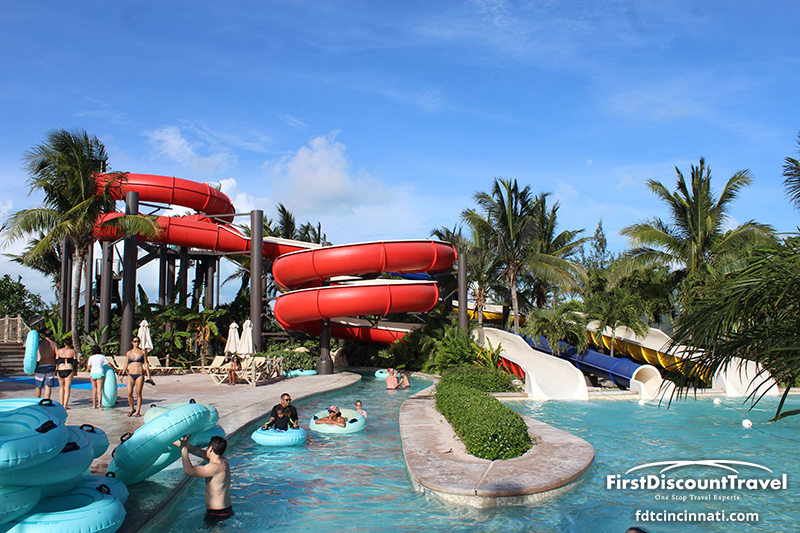 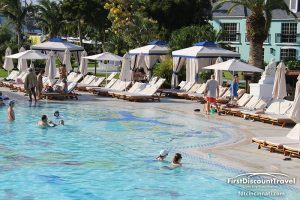 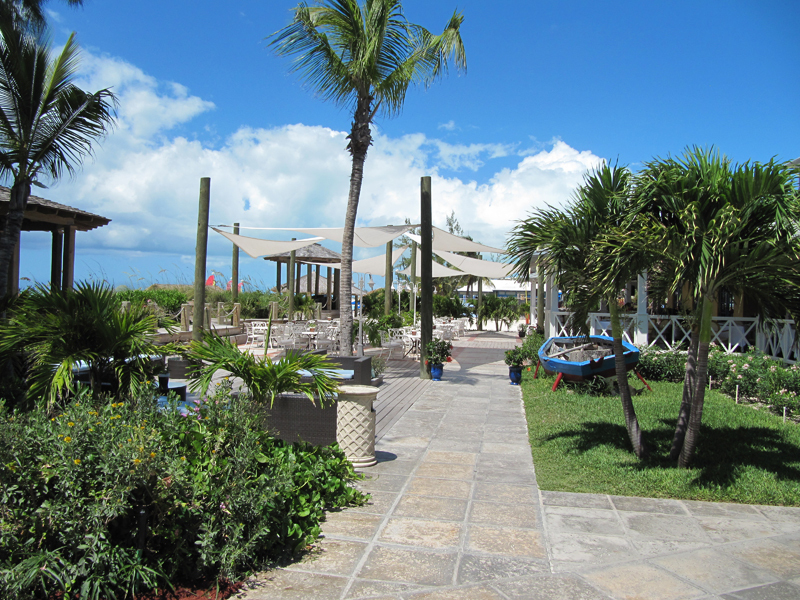 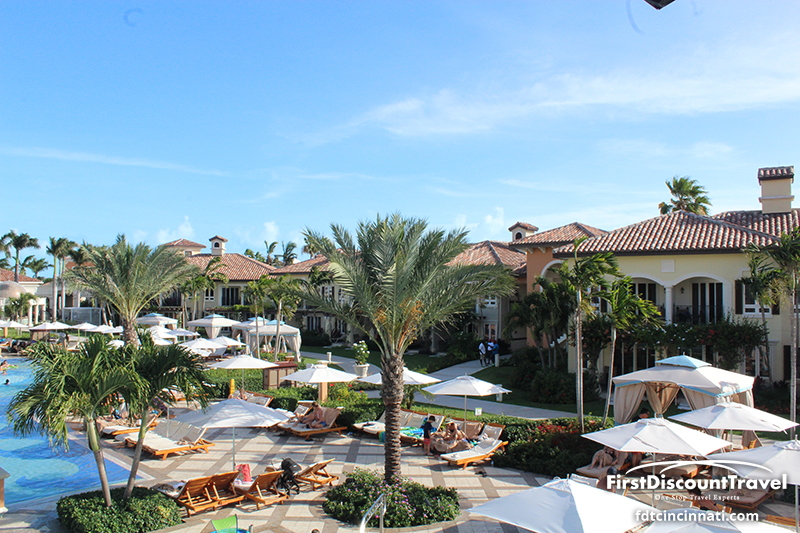 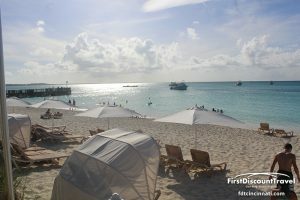 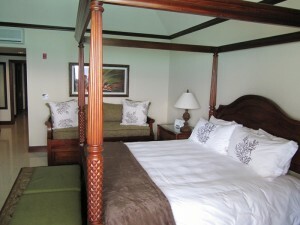 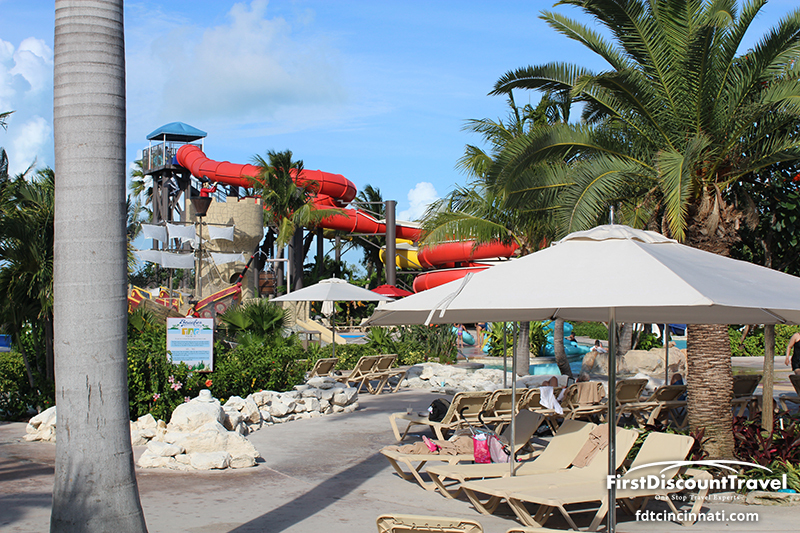 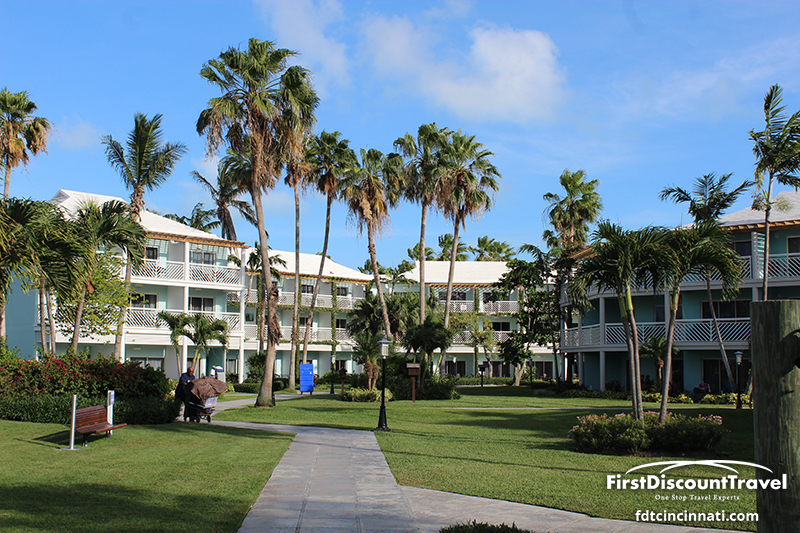 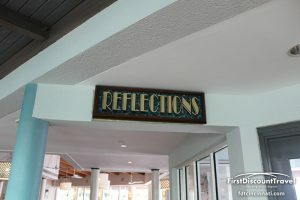 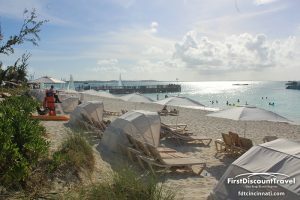 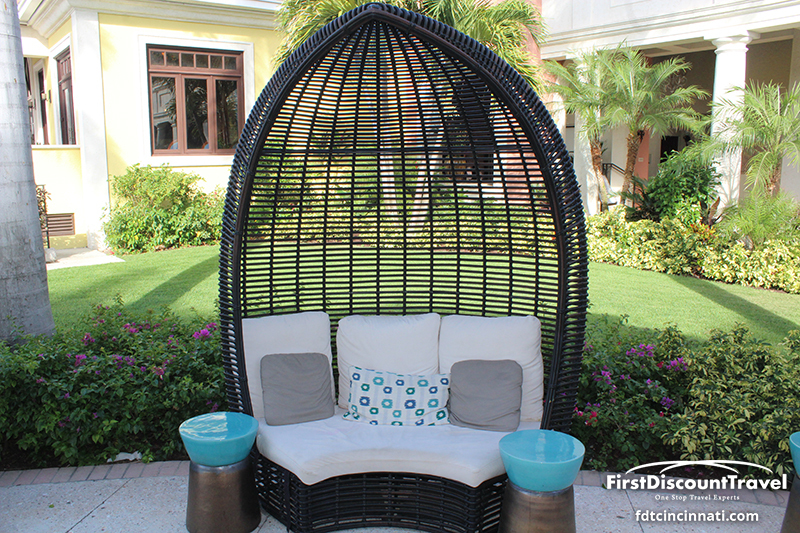 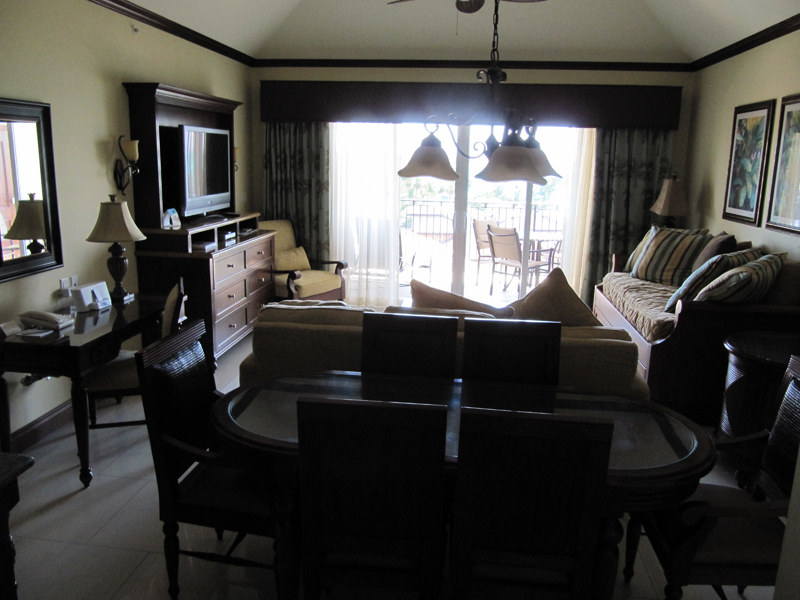 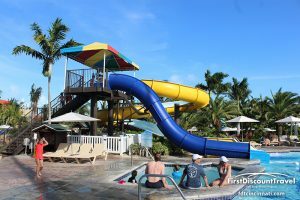 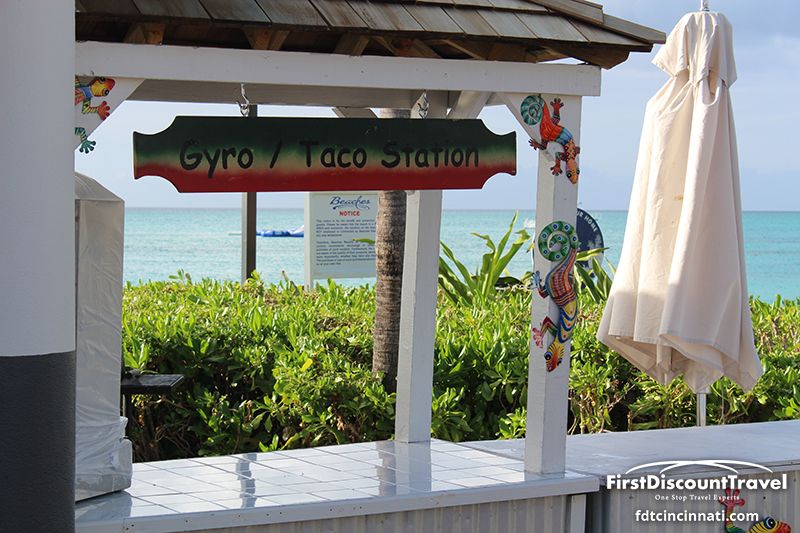 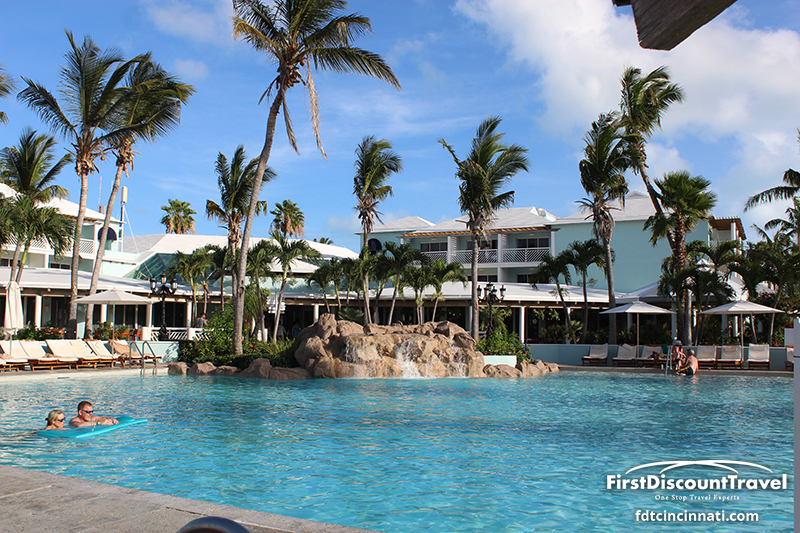 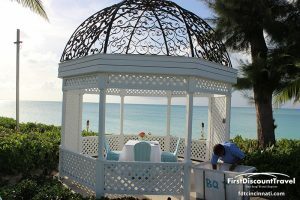 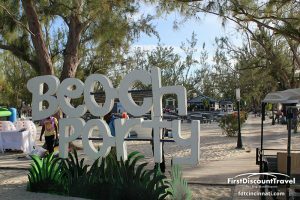 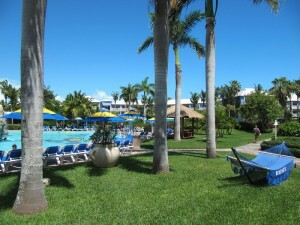 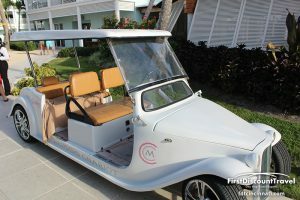 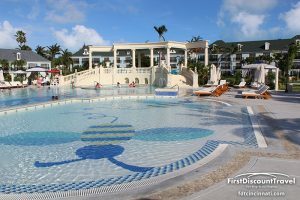 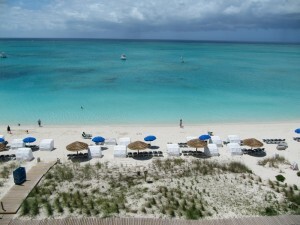 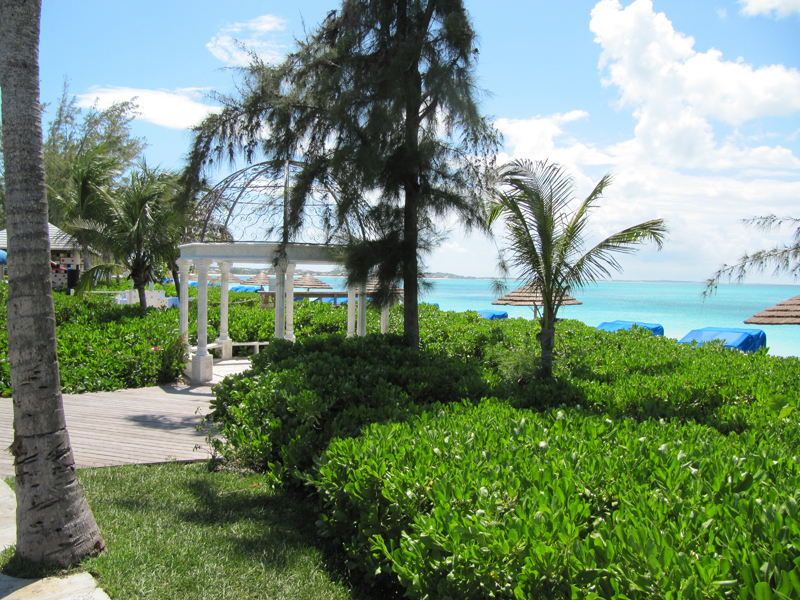 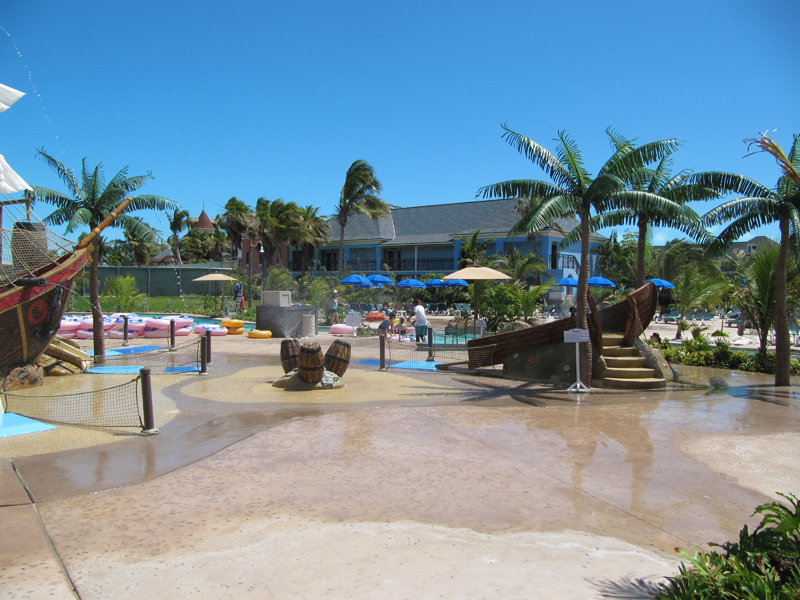 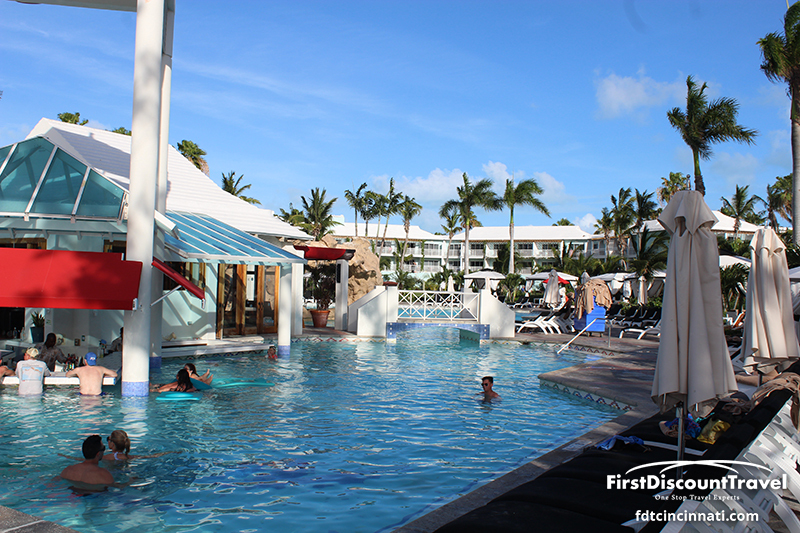 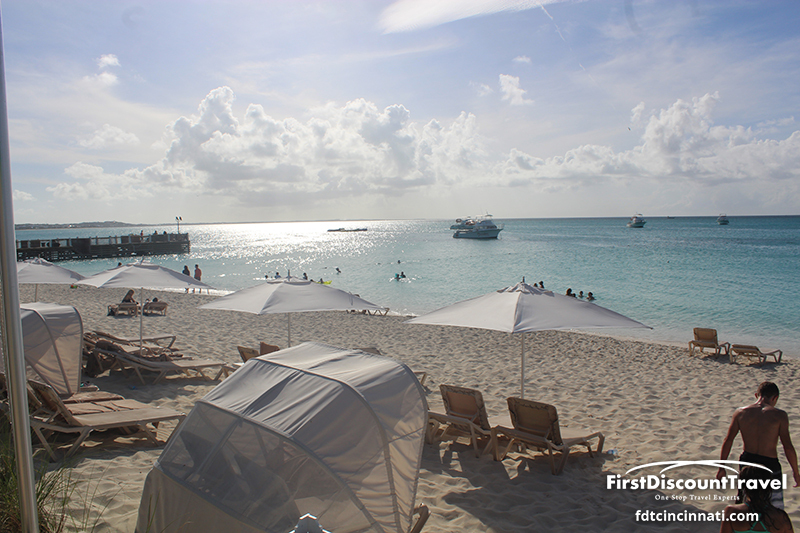 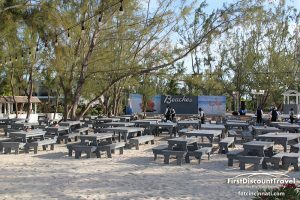 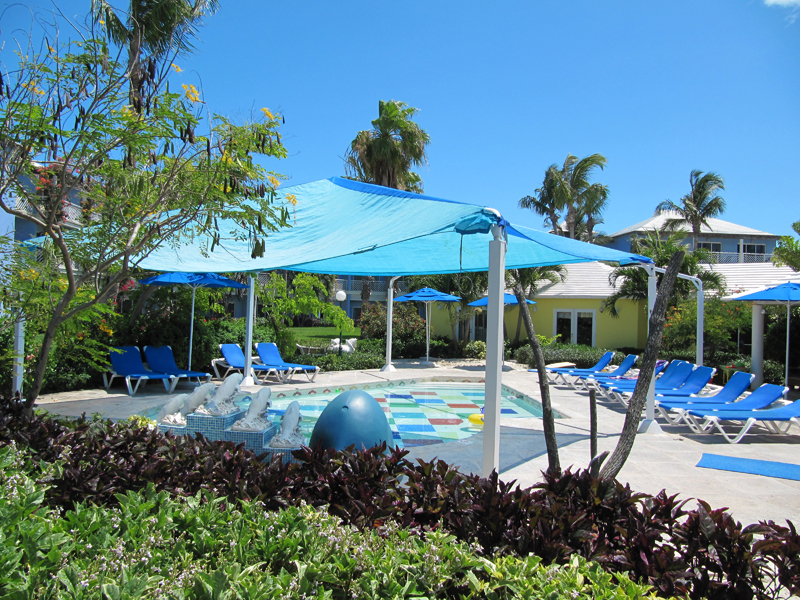 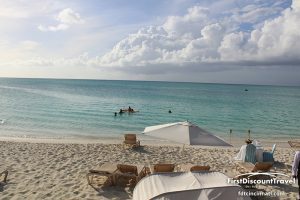 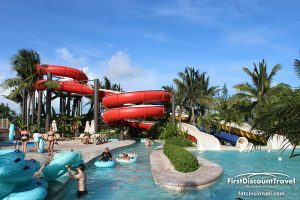 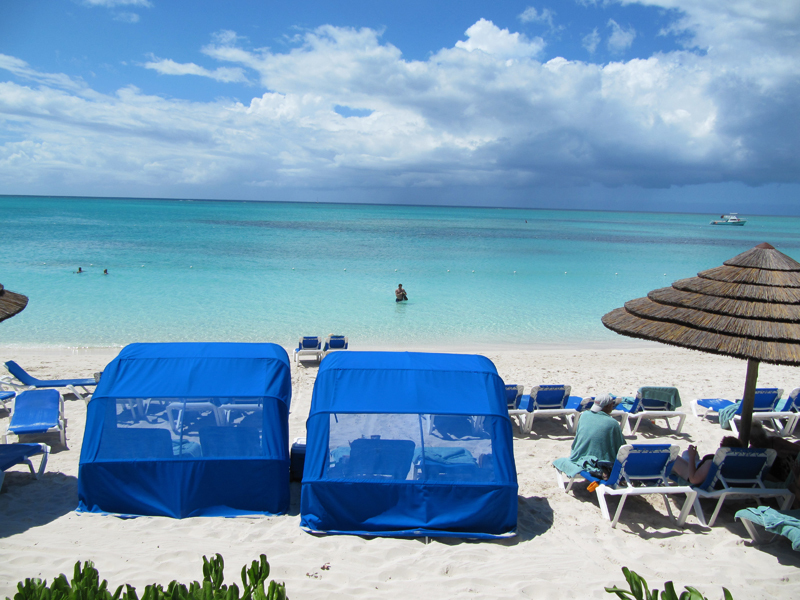 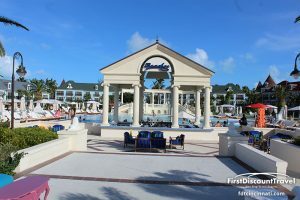 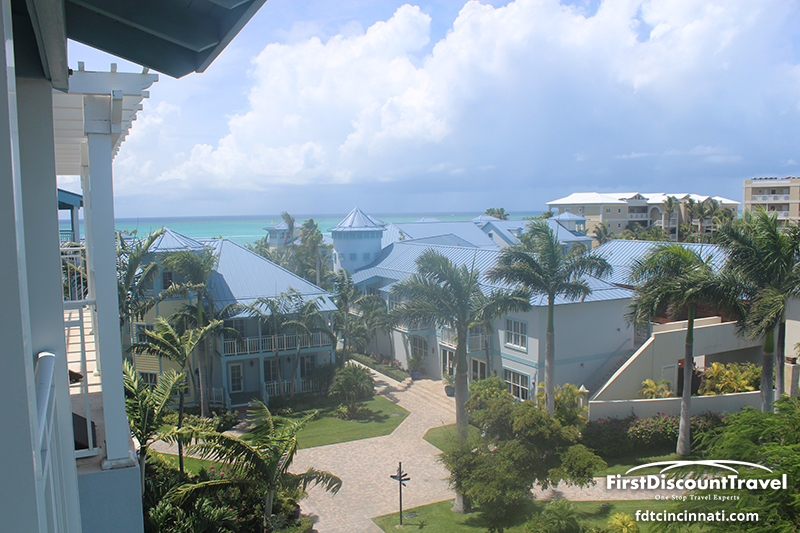 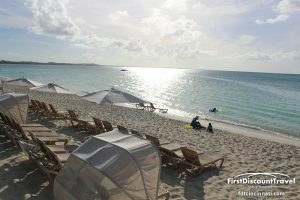 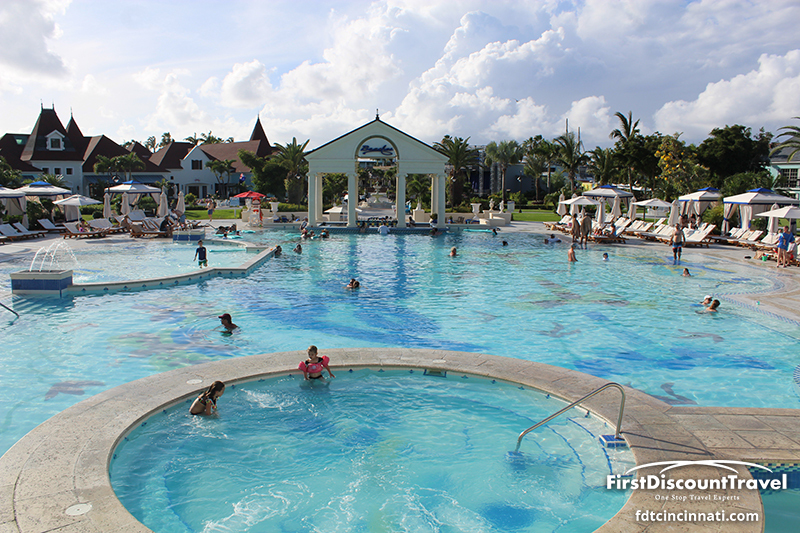 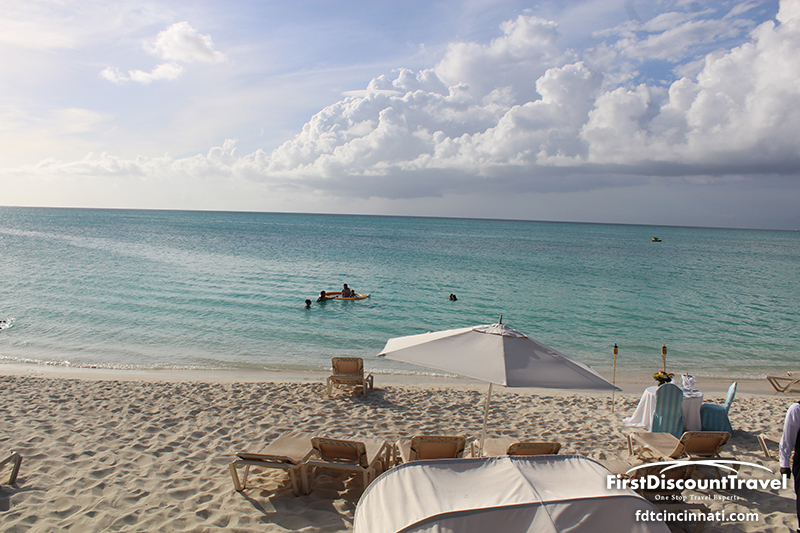 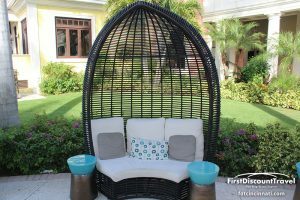 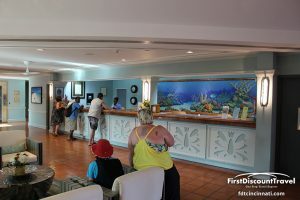 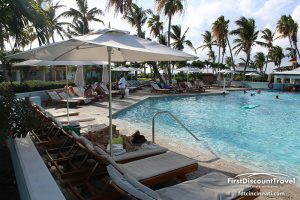 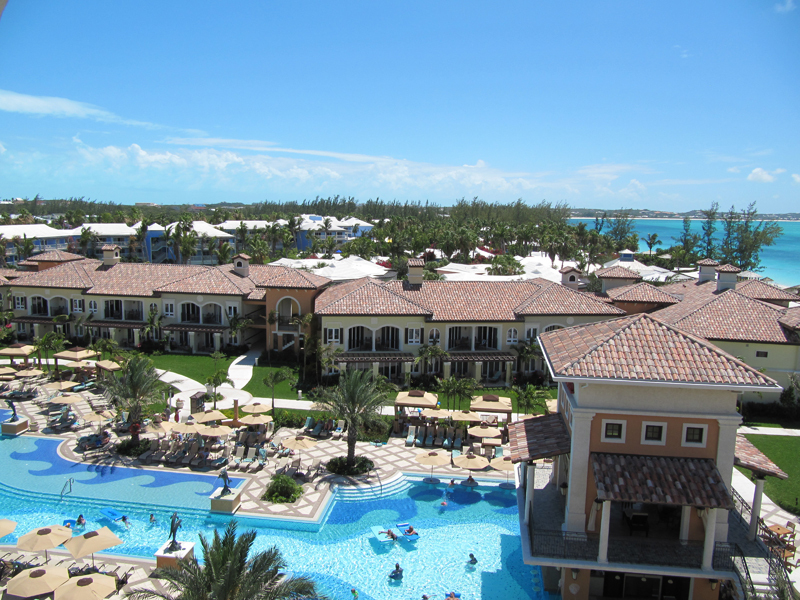 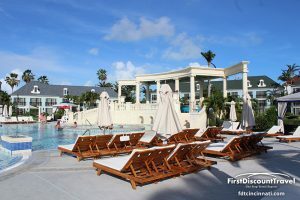 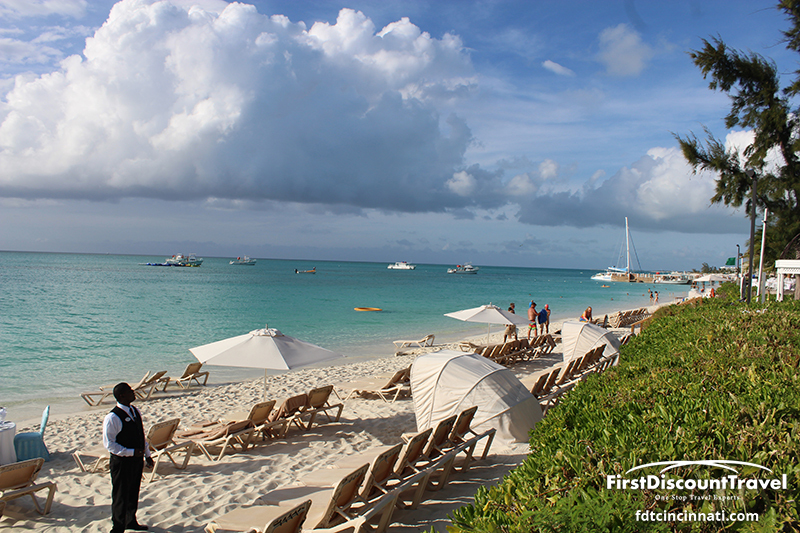 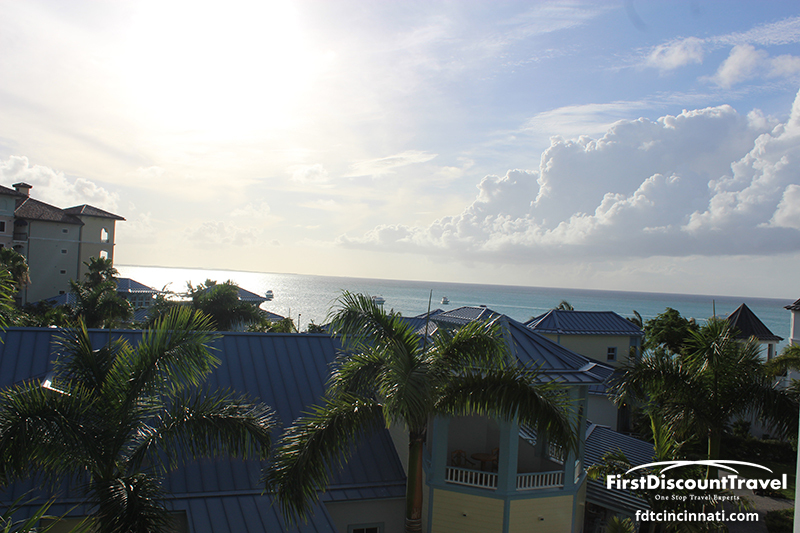 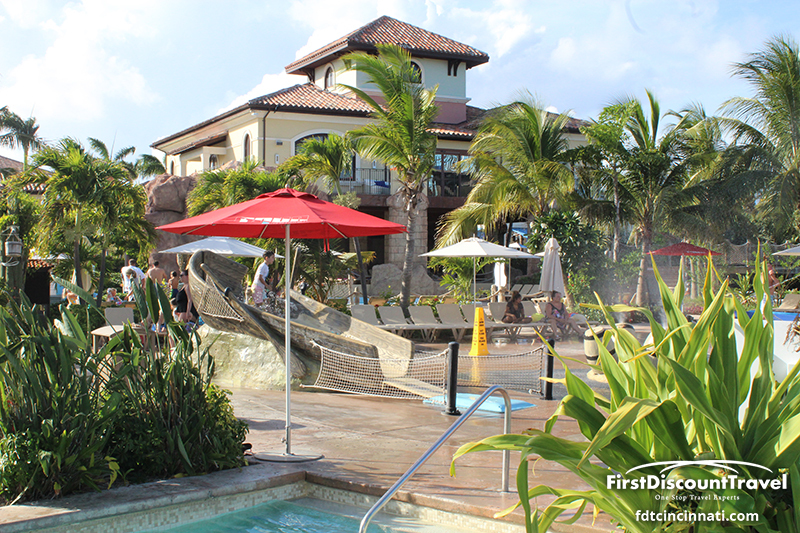 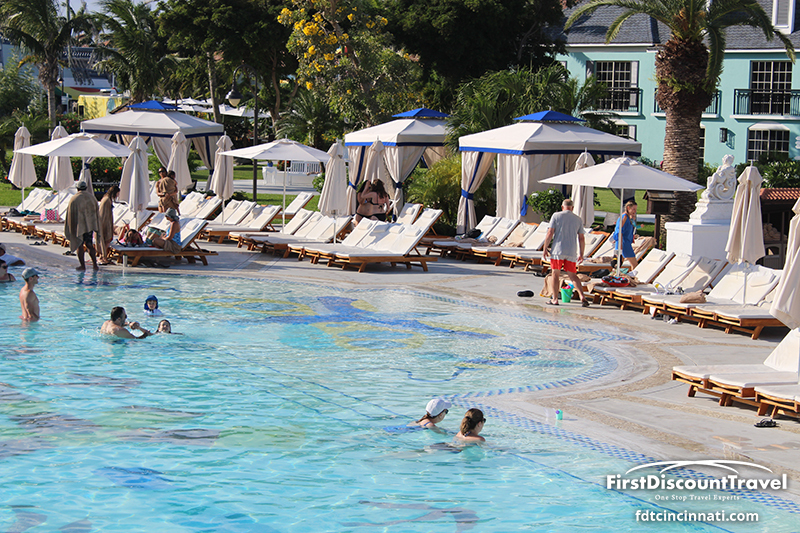 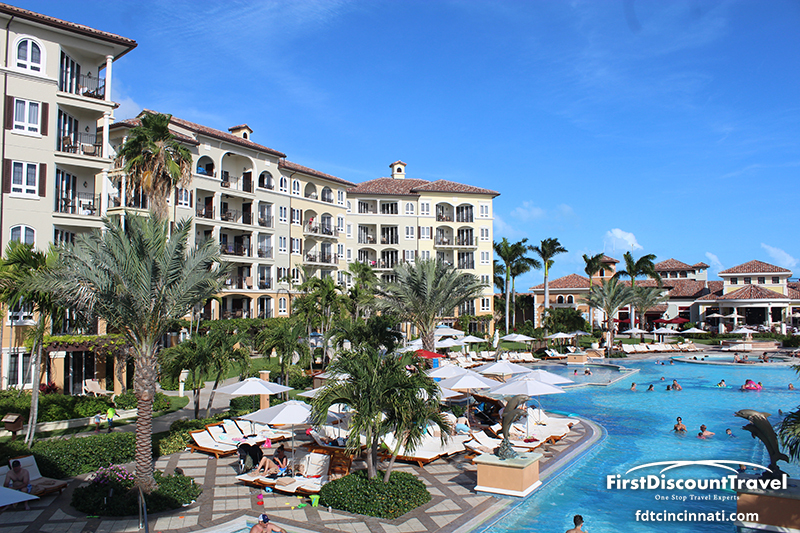 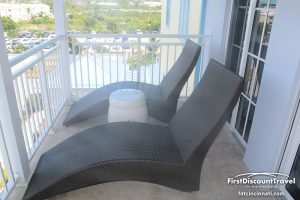 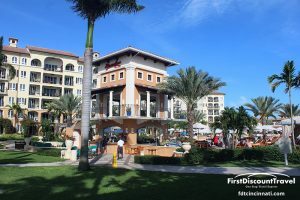 Beaches Turks and Caicos is my favorite family friendly resort in the world! 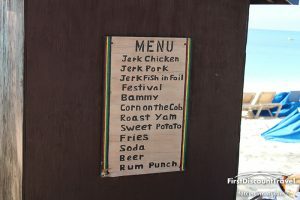 I’m not alone as Travel and Leisure and Caribbean Travel Life Magazines agree with this ranking. 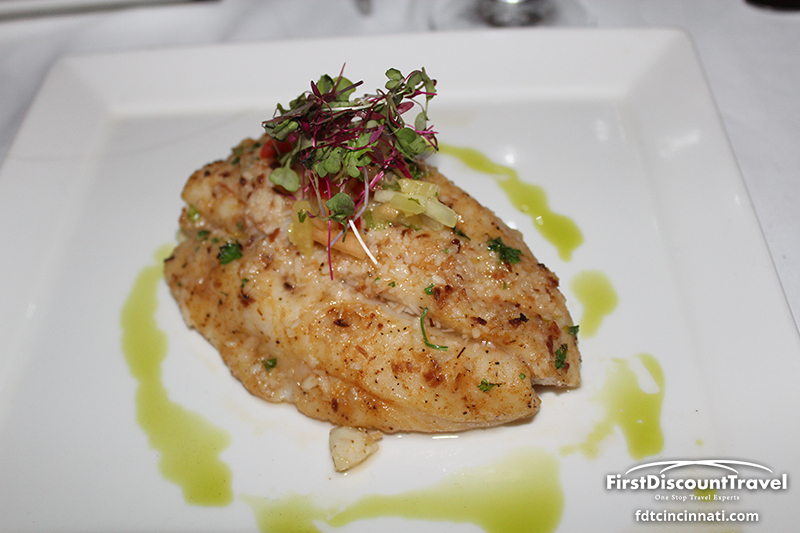 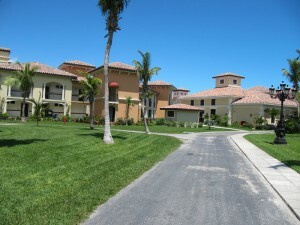 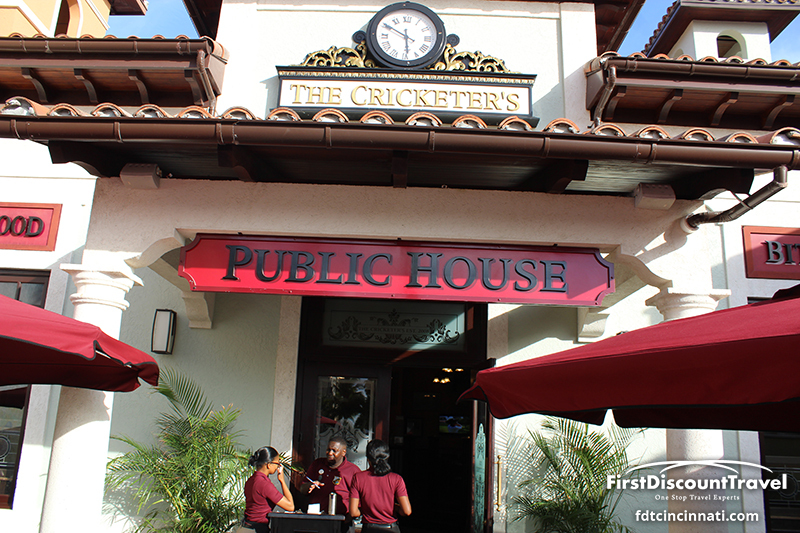 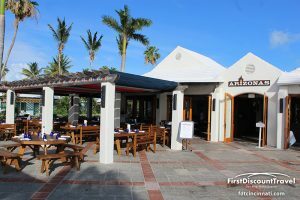 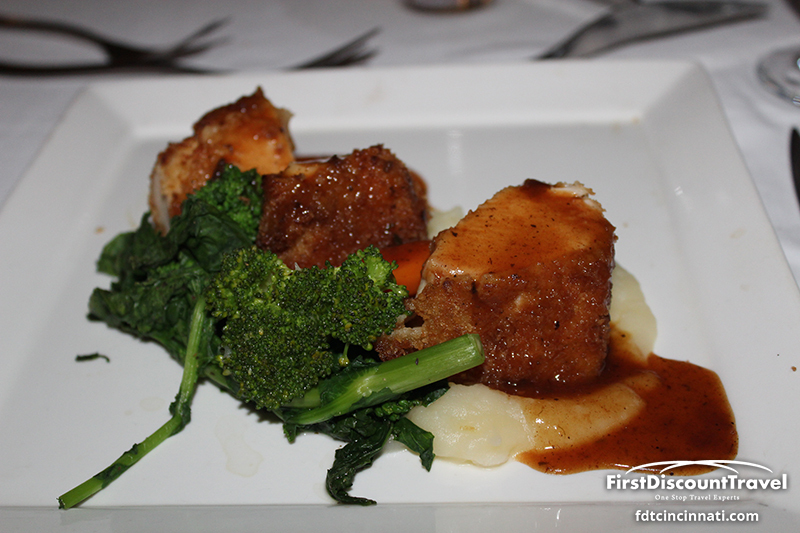 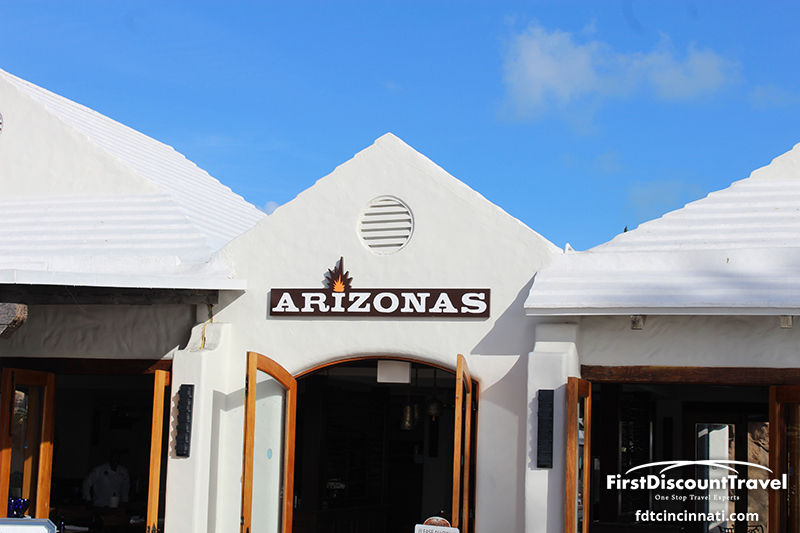 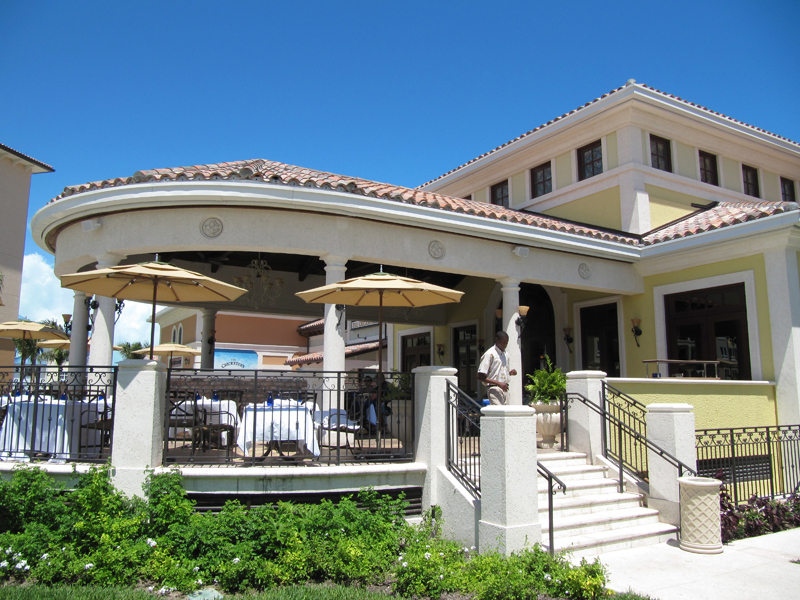 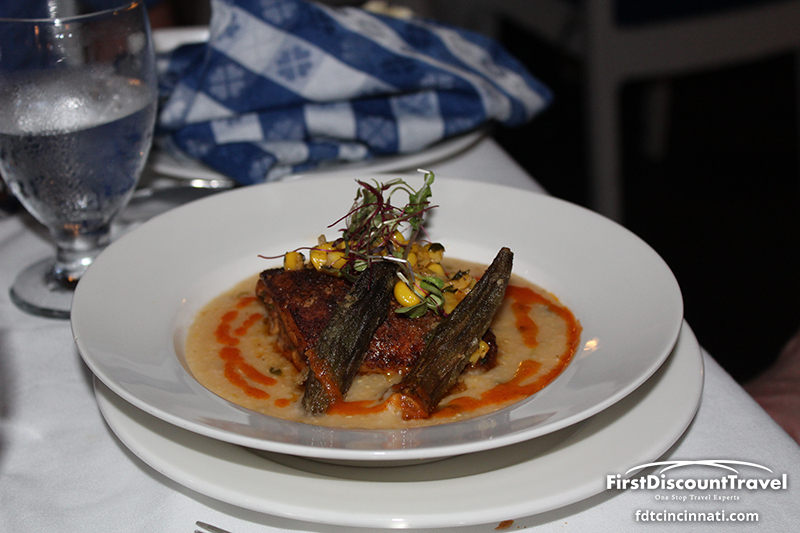 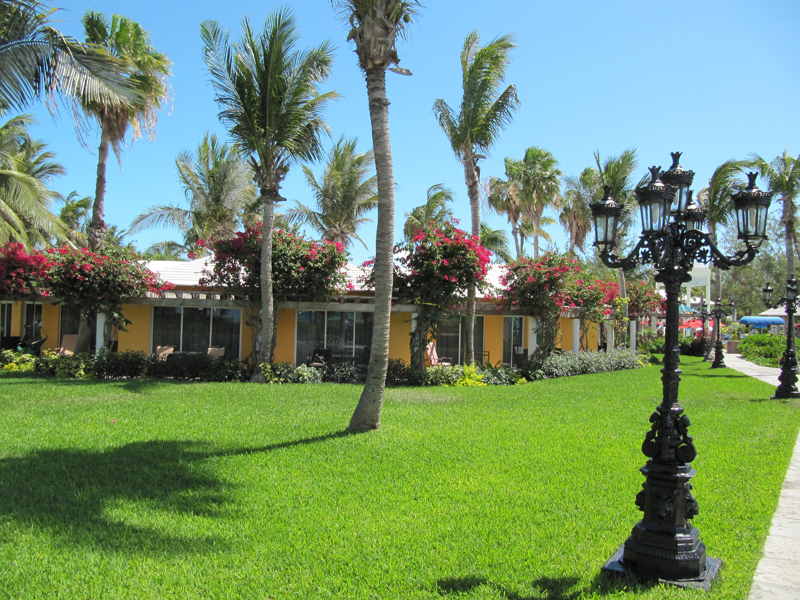 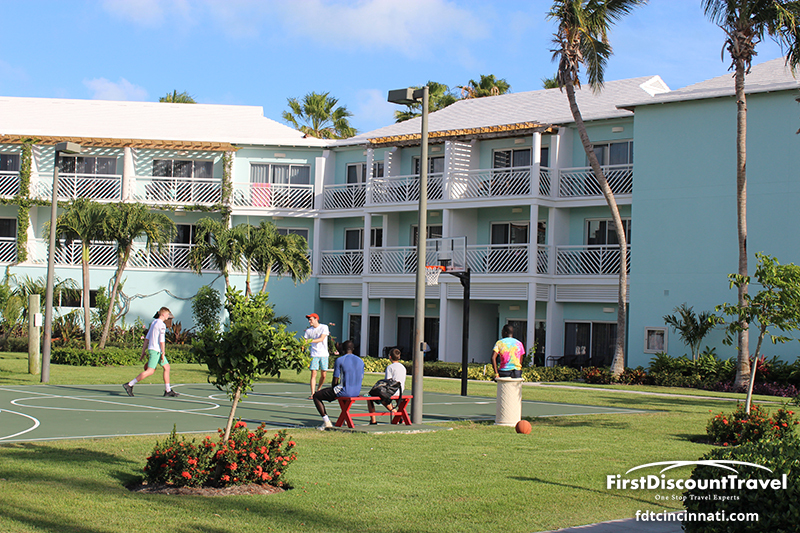 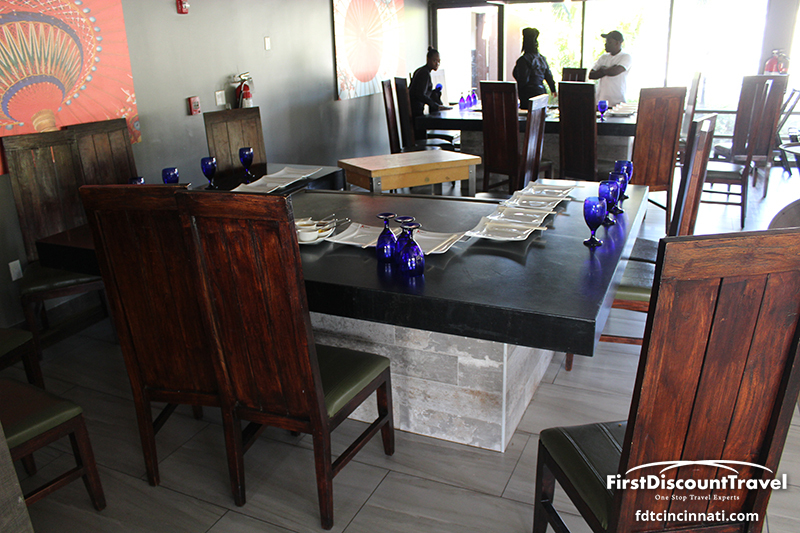 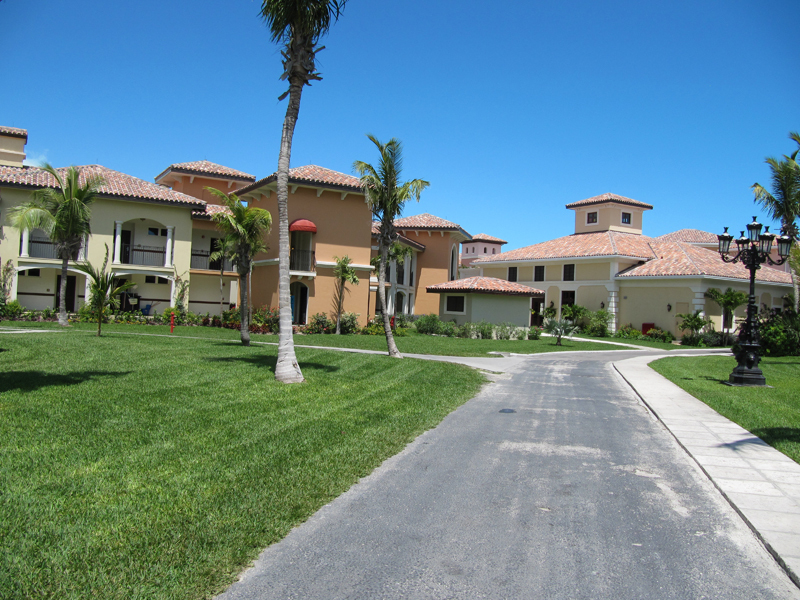 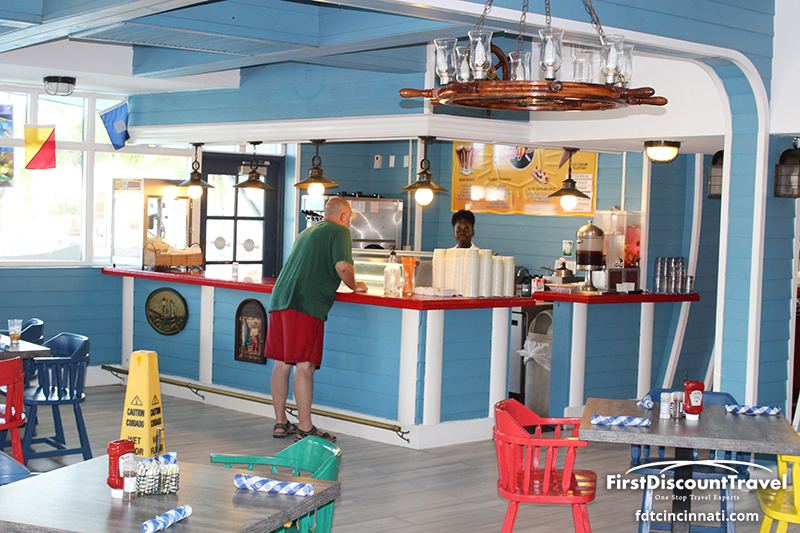 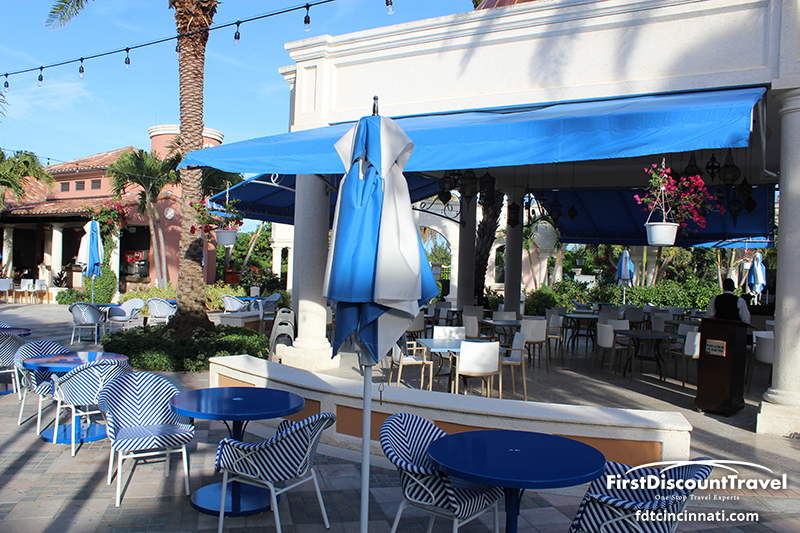 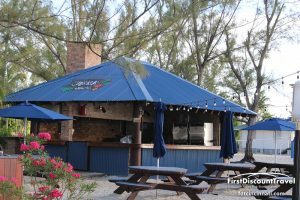 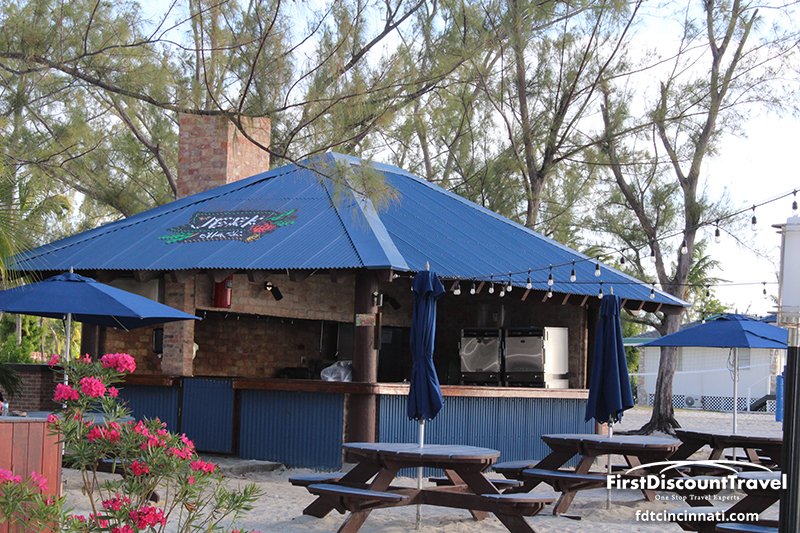 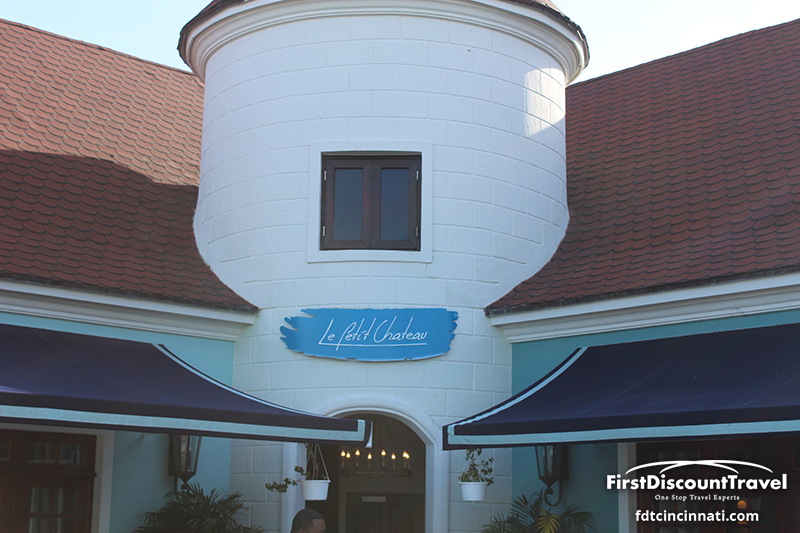 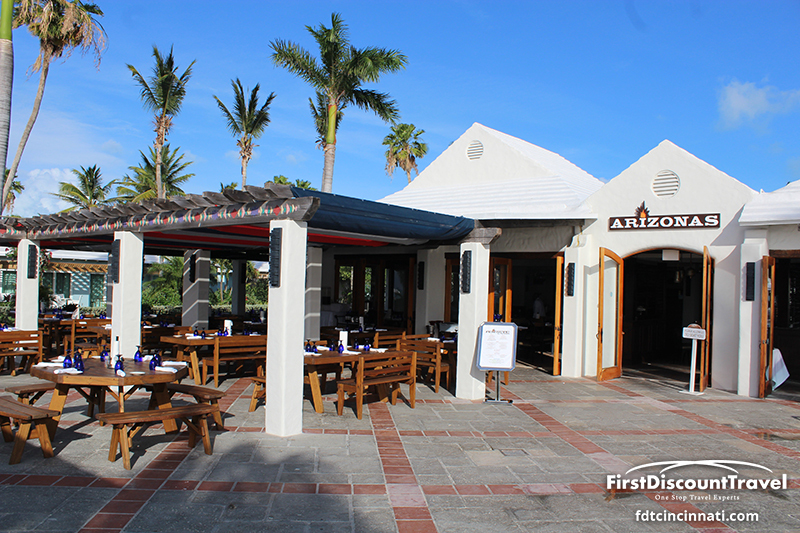 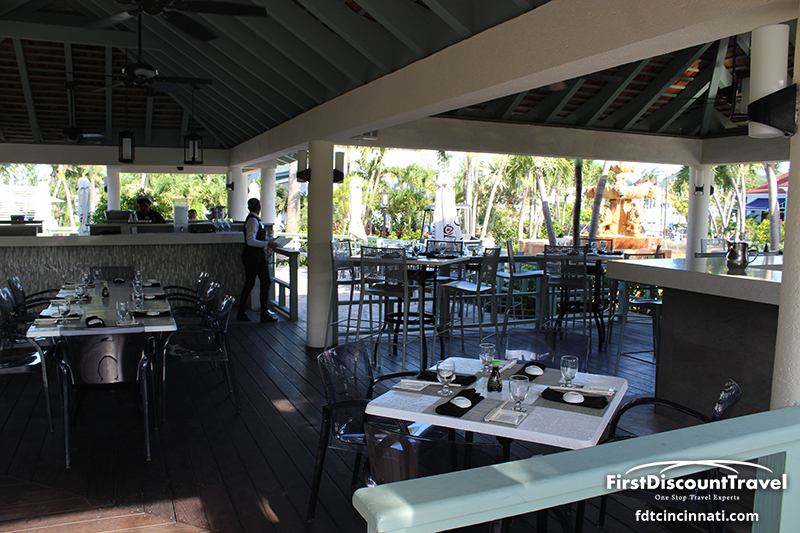 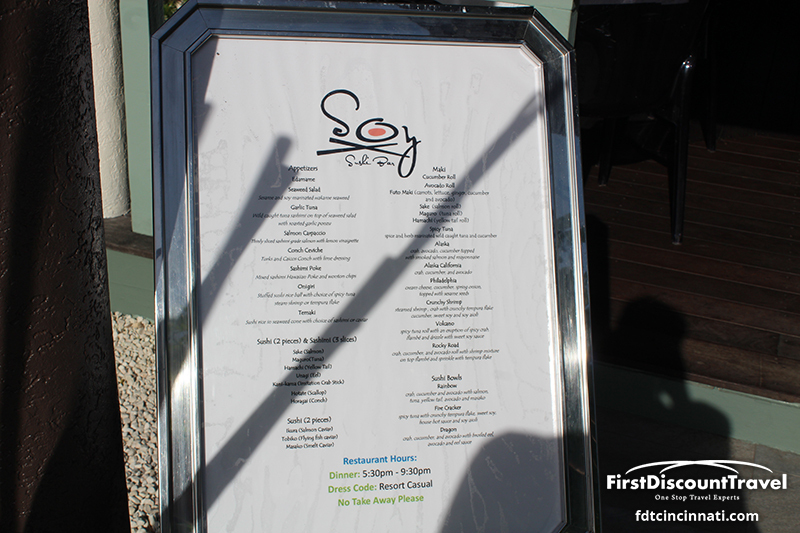 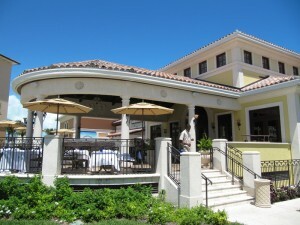 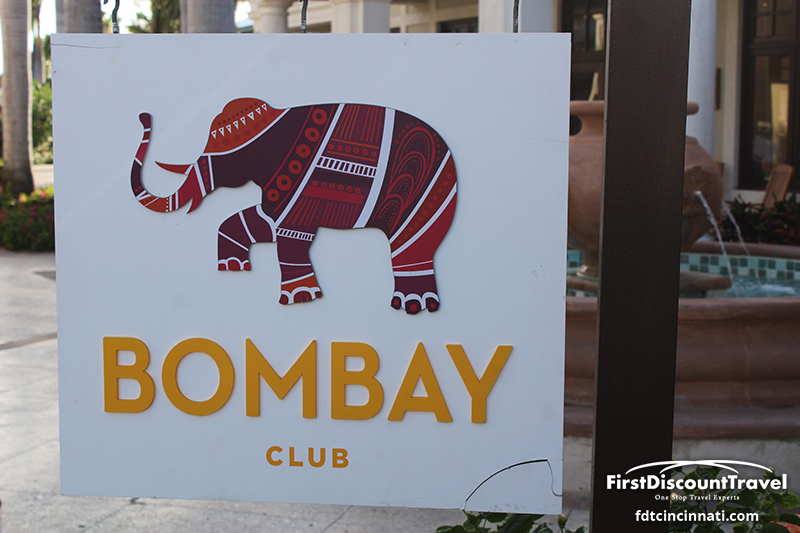 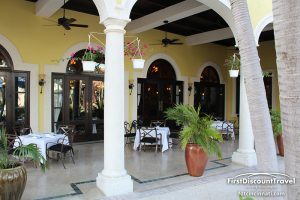 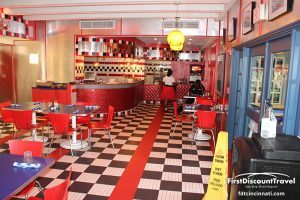 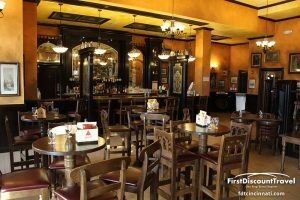 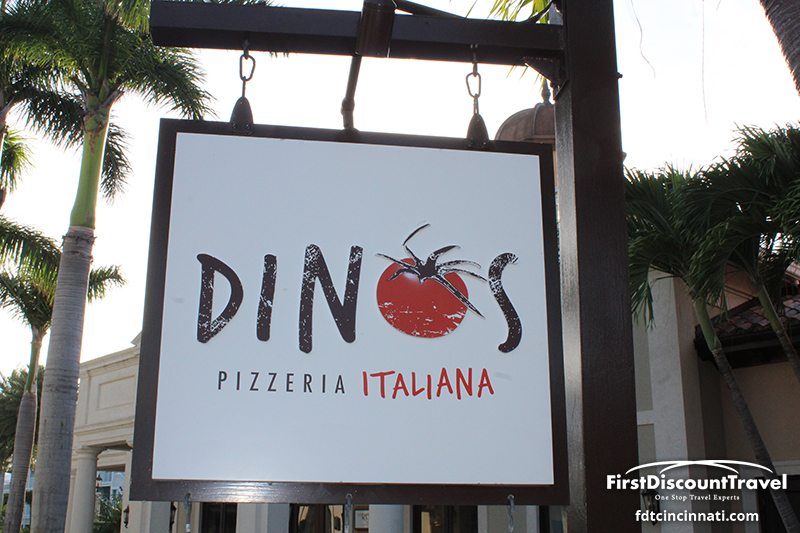 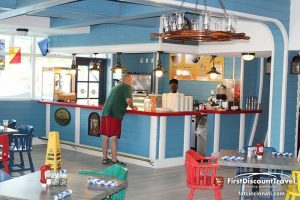 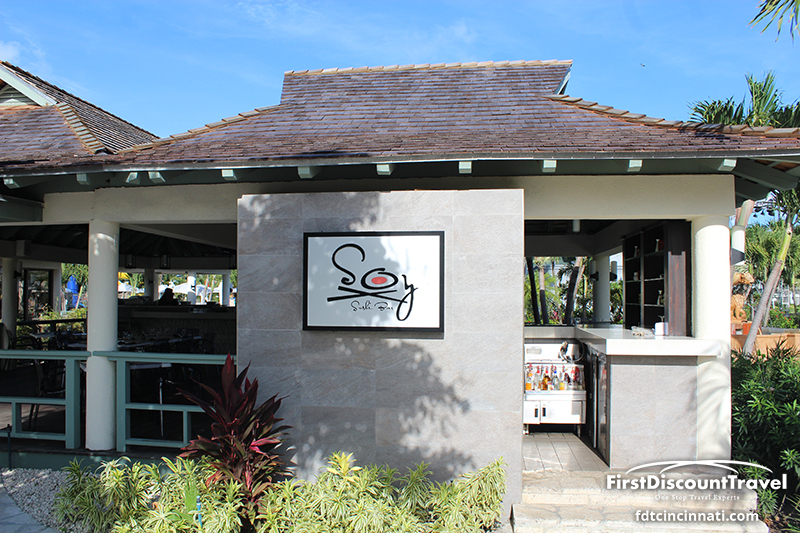 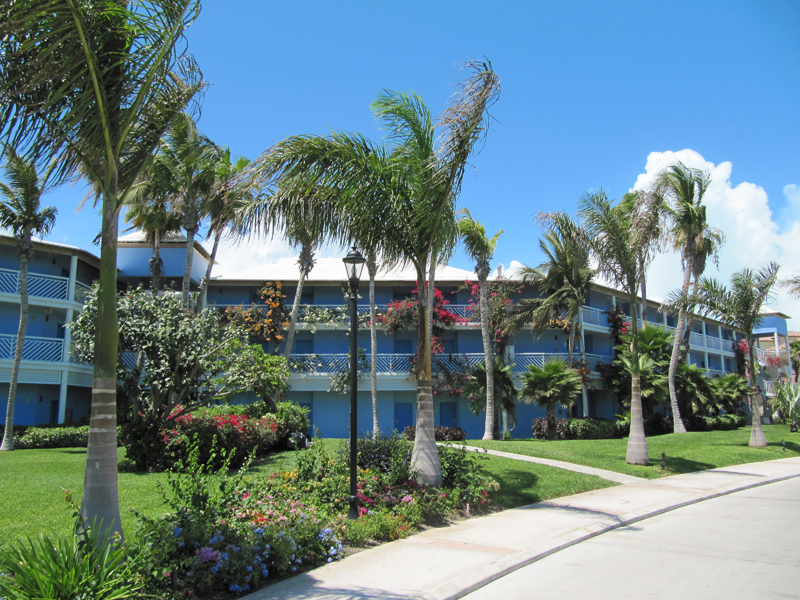 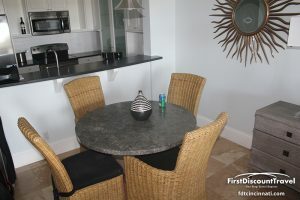 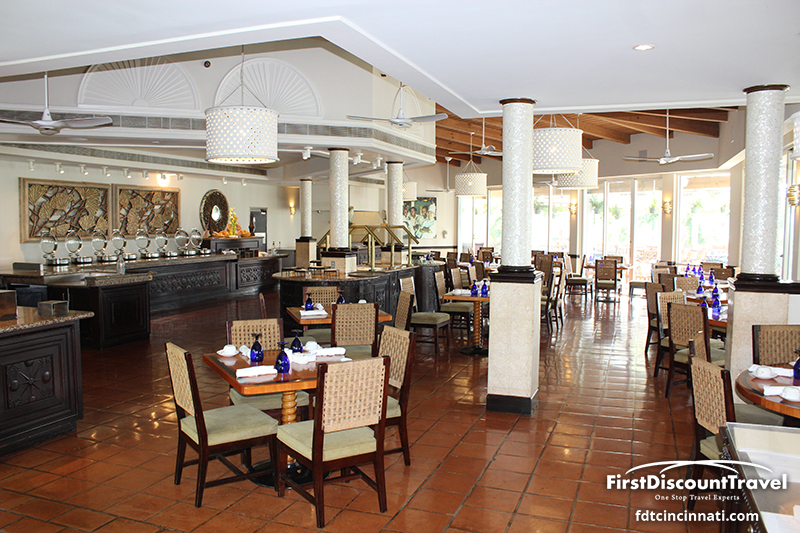 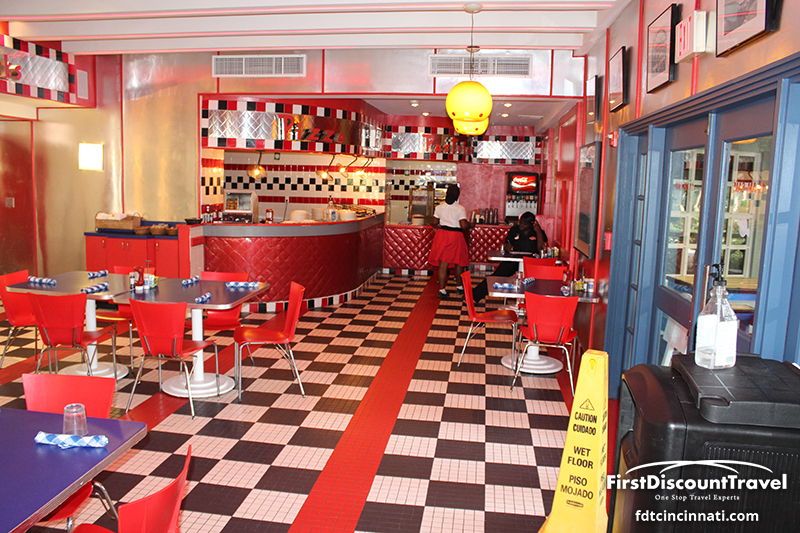 With the addition of the Key West Village, there are now over 600 rooms with 19 restaurants (two are adult only). 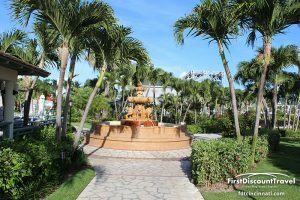 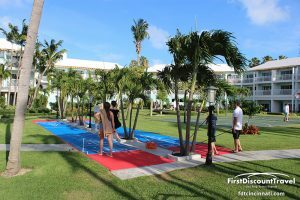 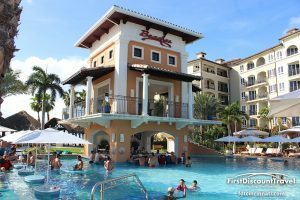 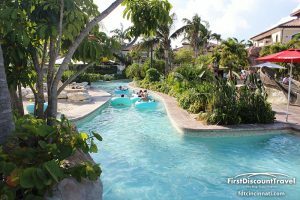 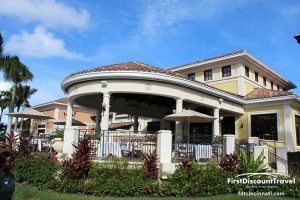 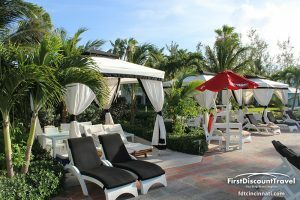 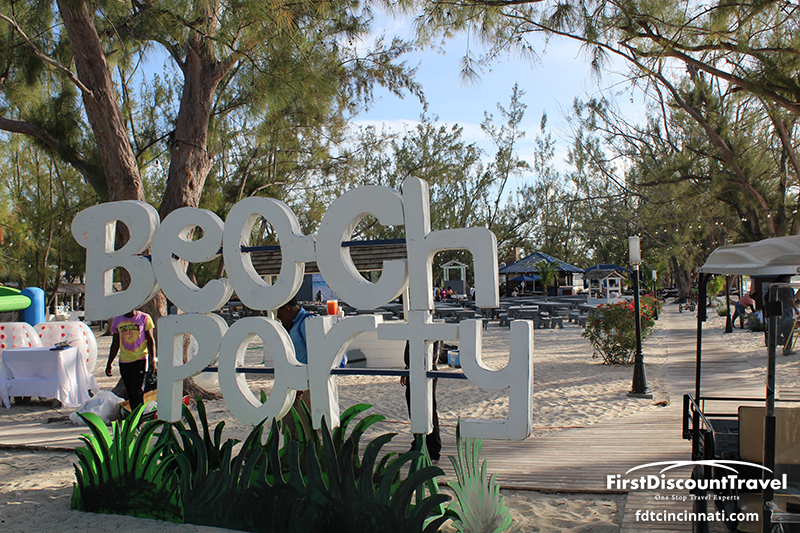 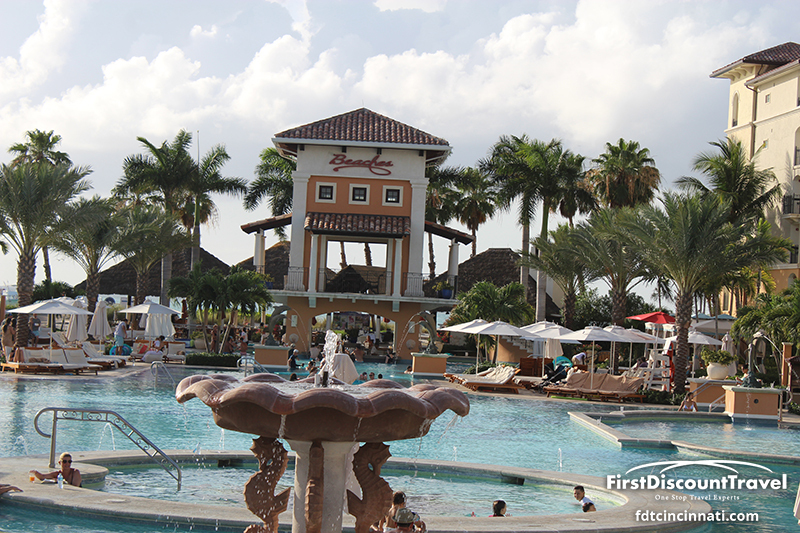 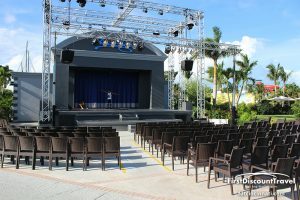 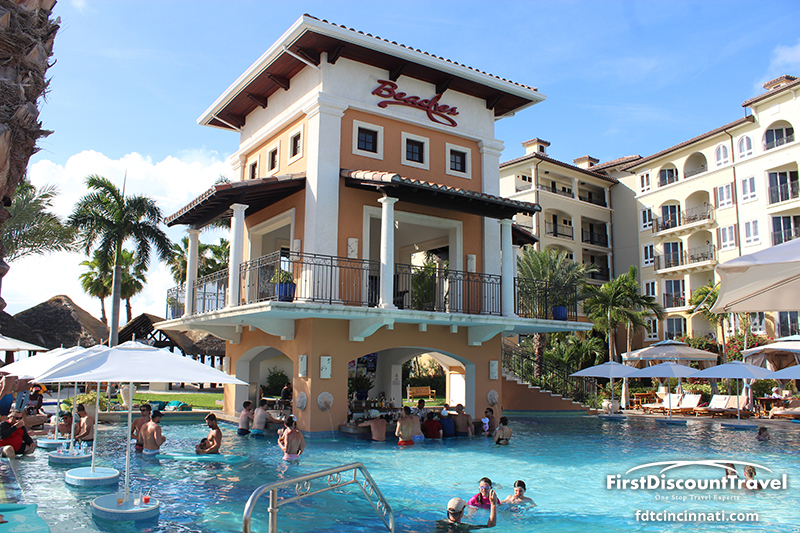 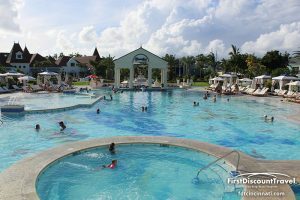 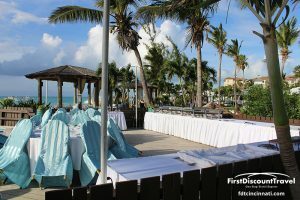 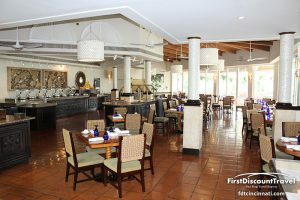 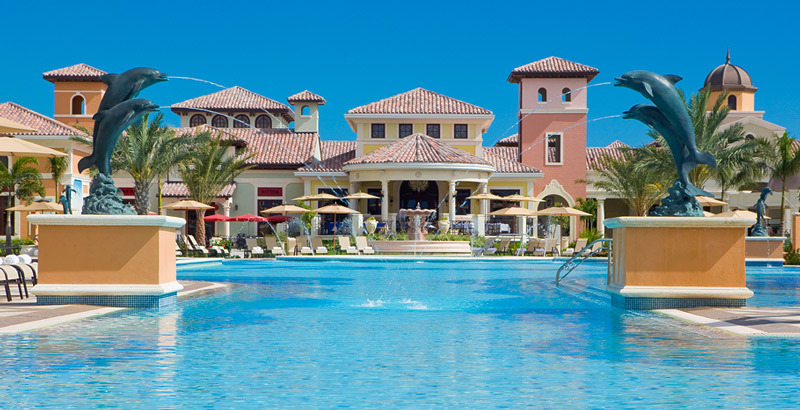 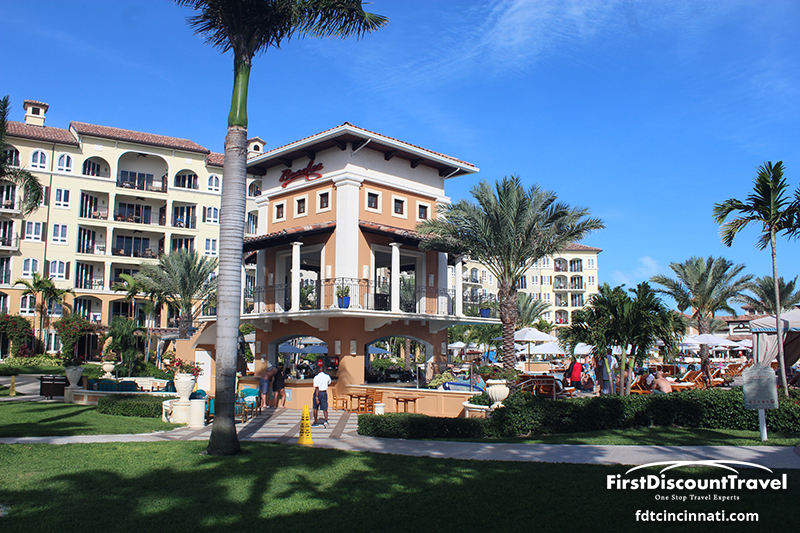 Beaches Turks is located on an amazing stretch of Grace Bay (Trip Advisor’s number 1 rated beach in the world) with 6 pools, a 45,000 square feet water park, surf simulator, multiple water slides, and several swim up pool bars. 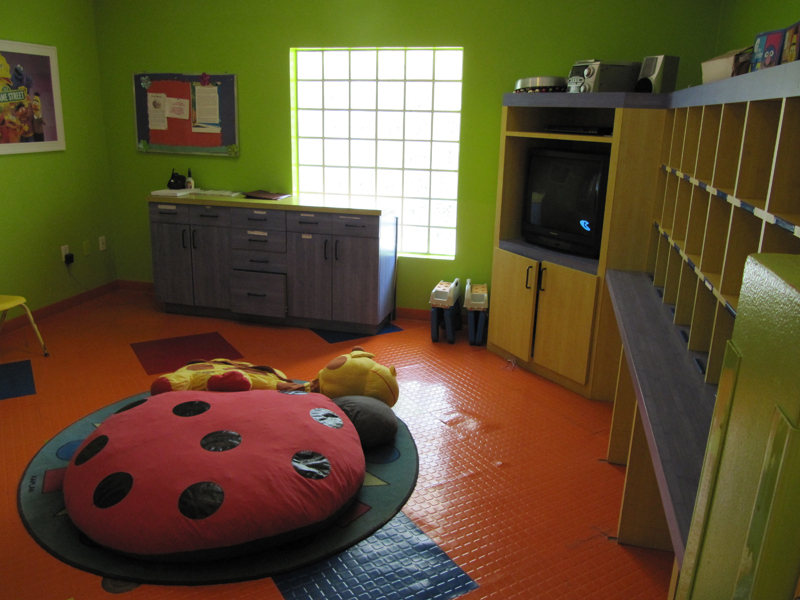 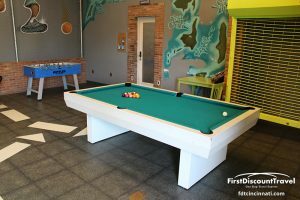 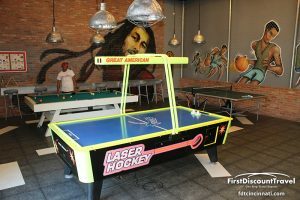 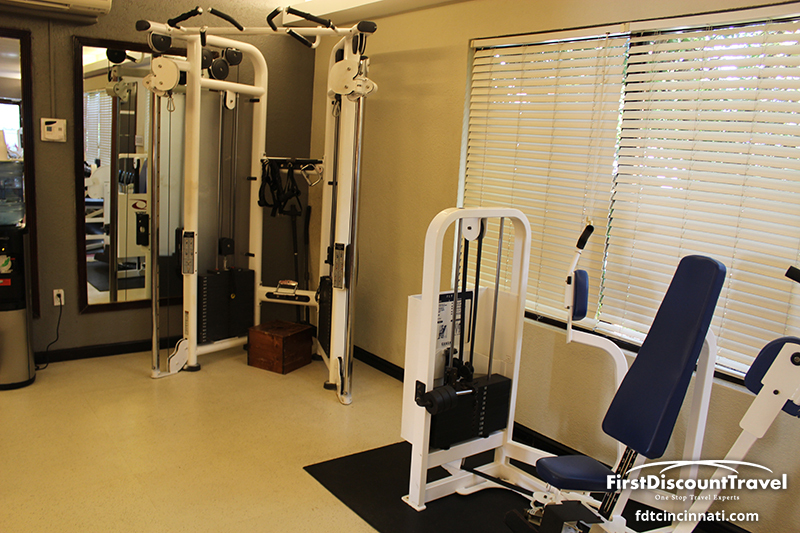 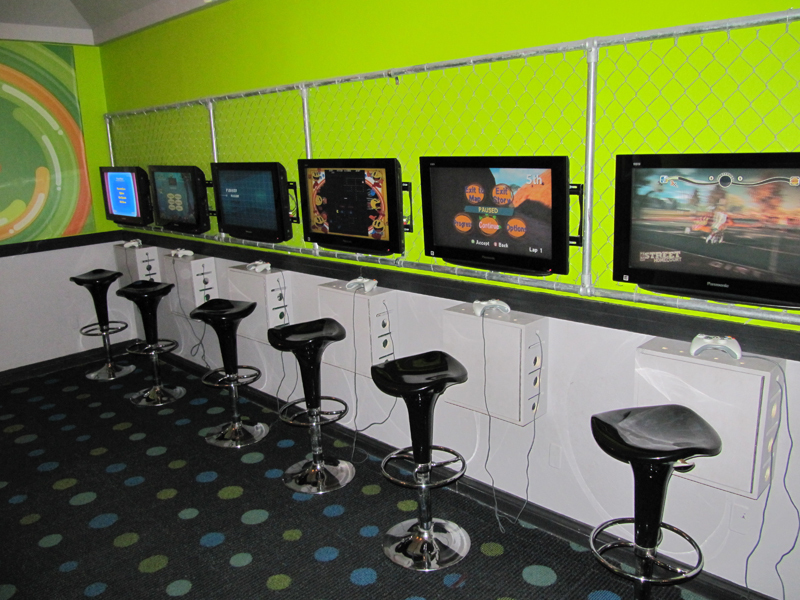 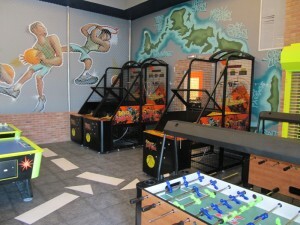 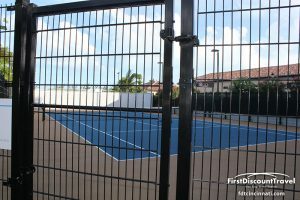 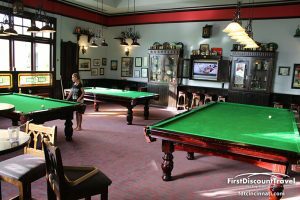 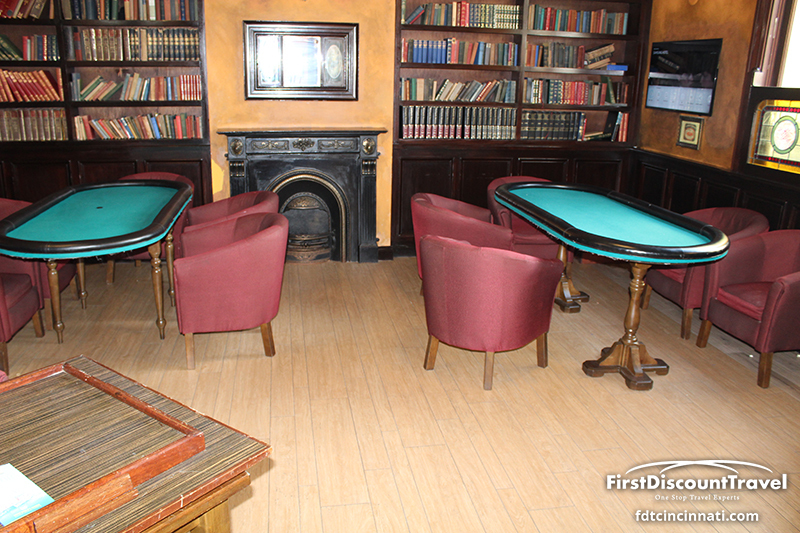 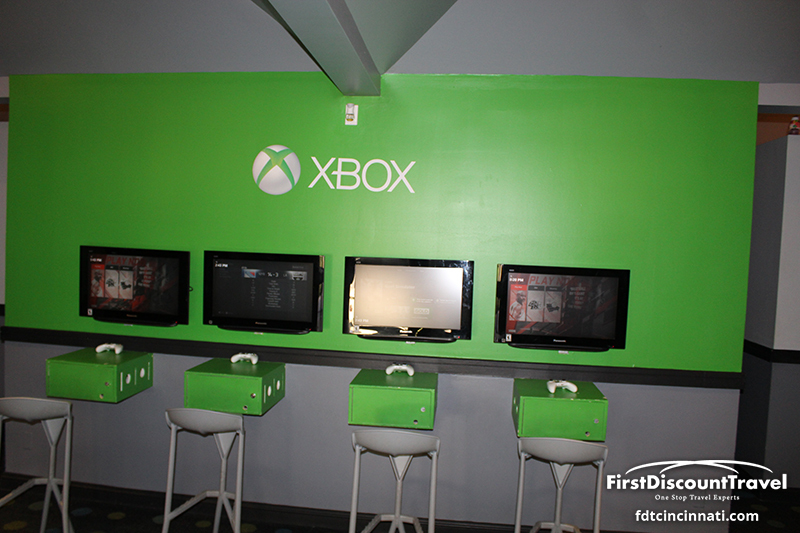 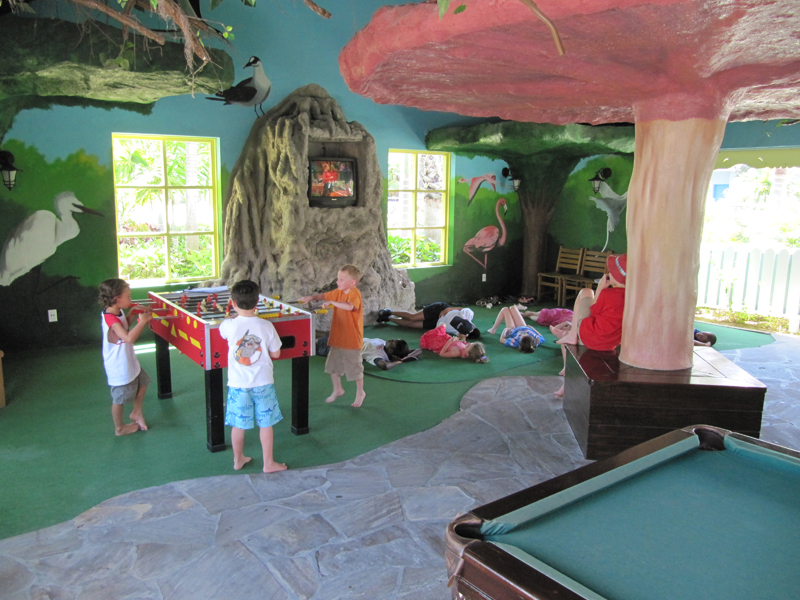 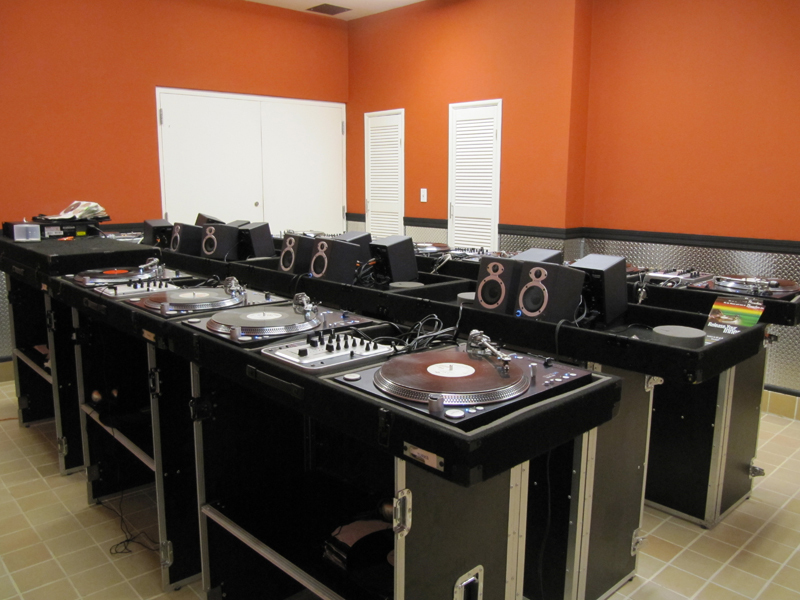 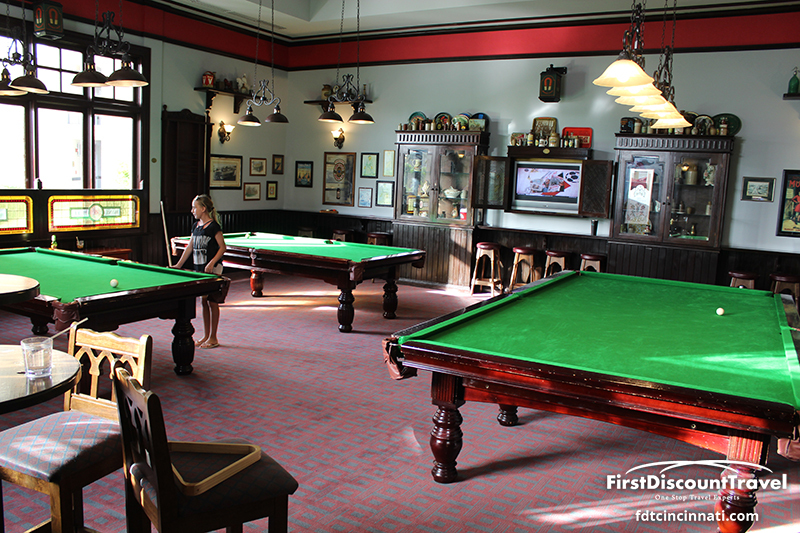 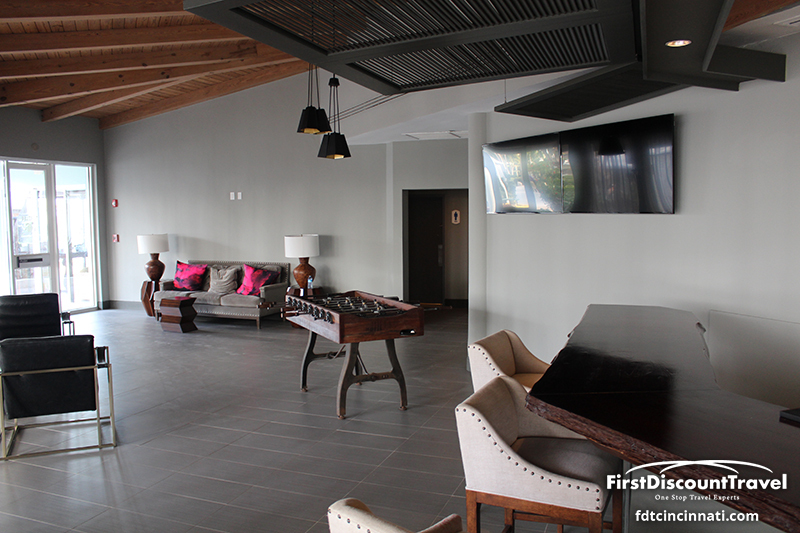 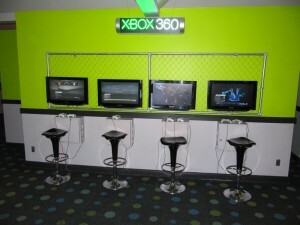 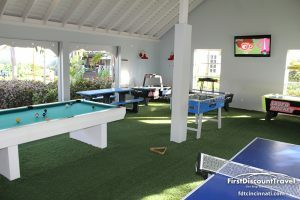 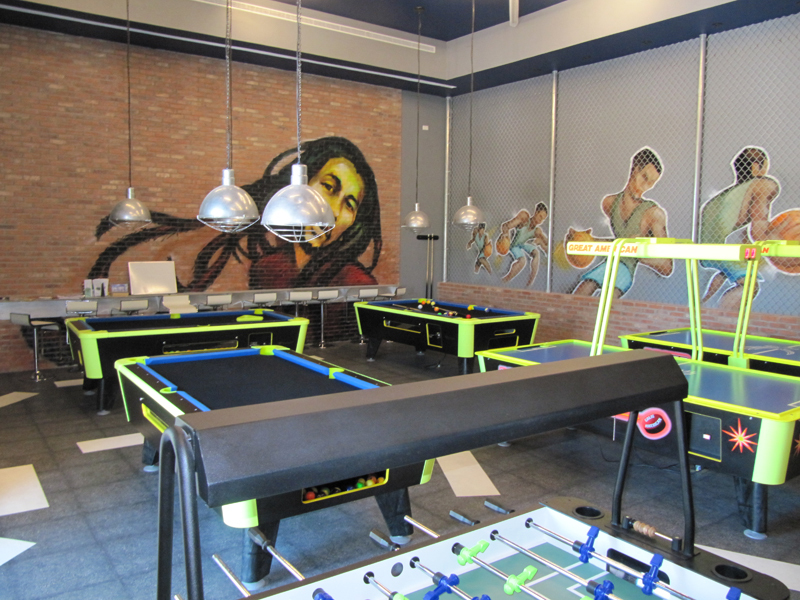 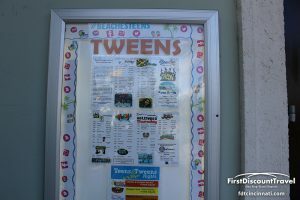 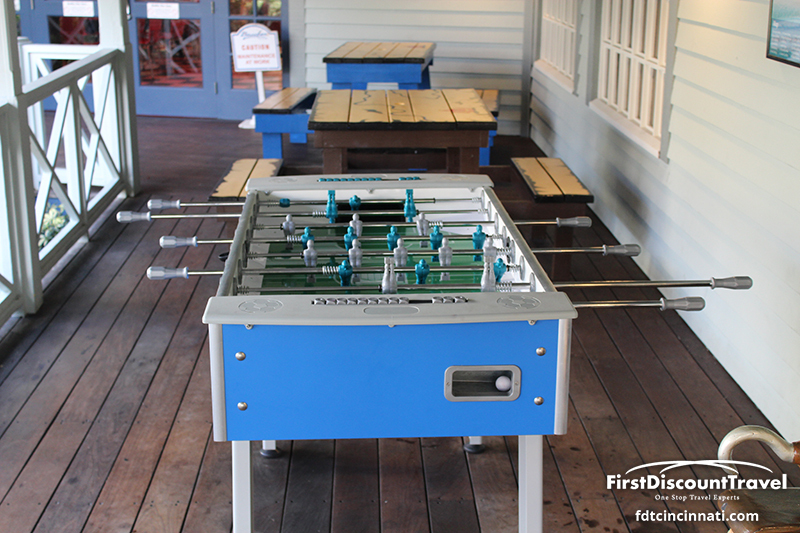 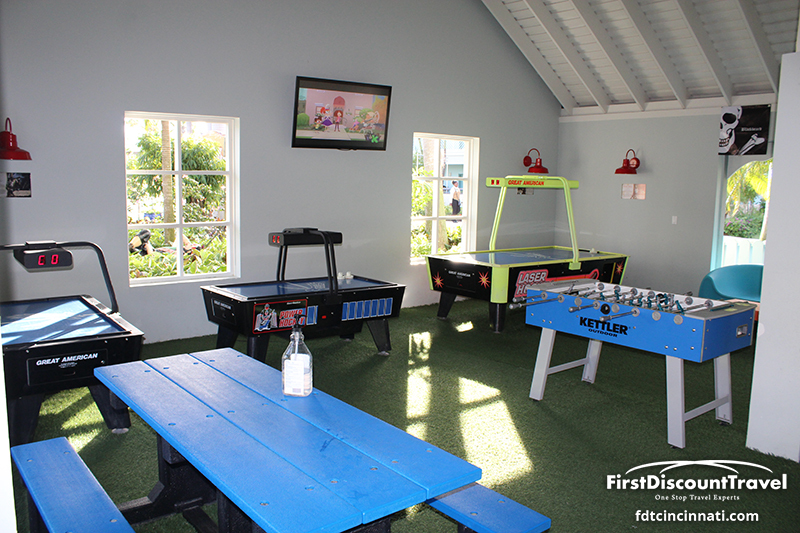 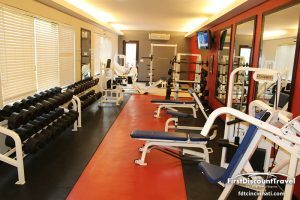 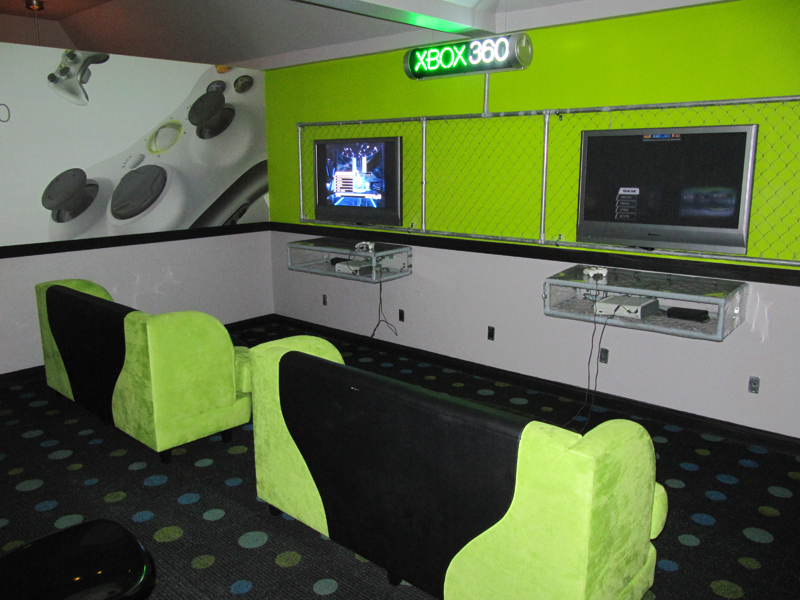 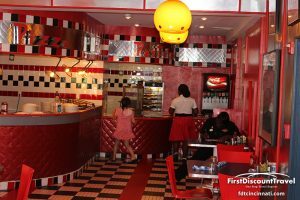 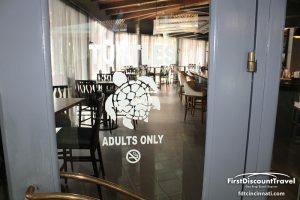 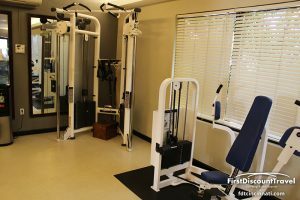 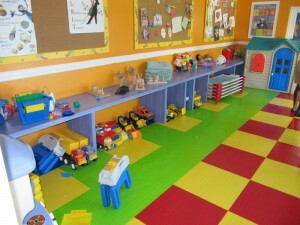 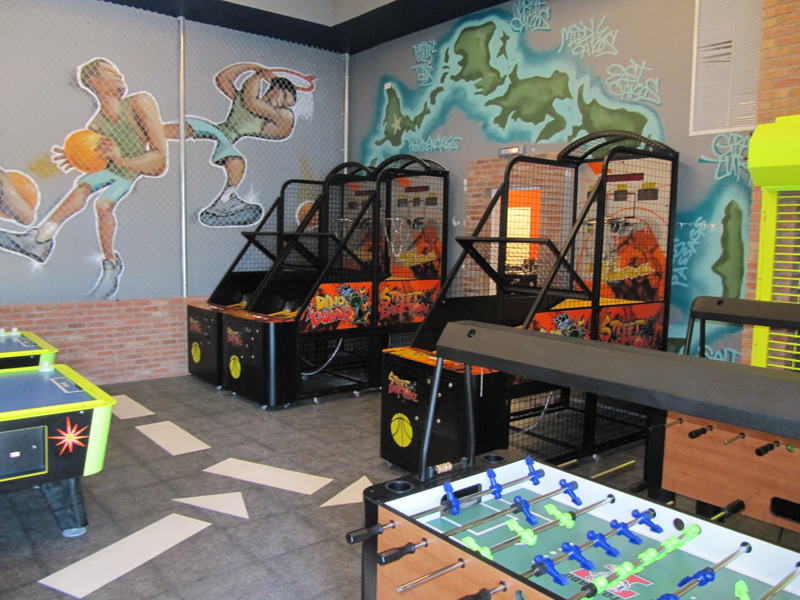 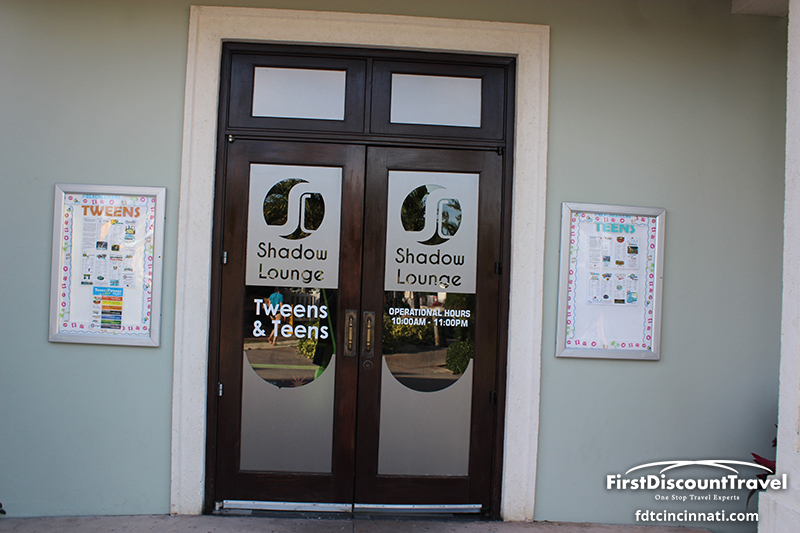 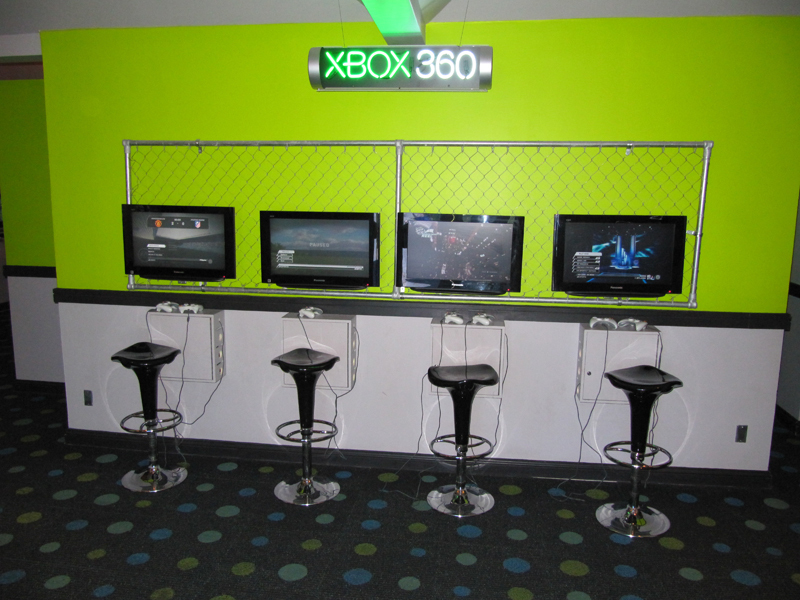 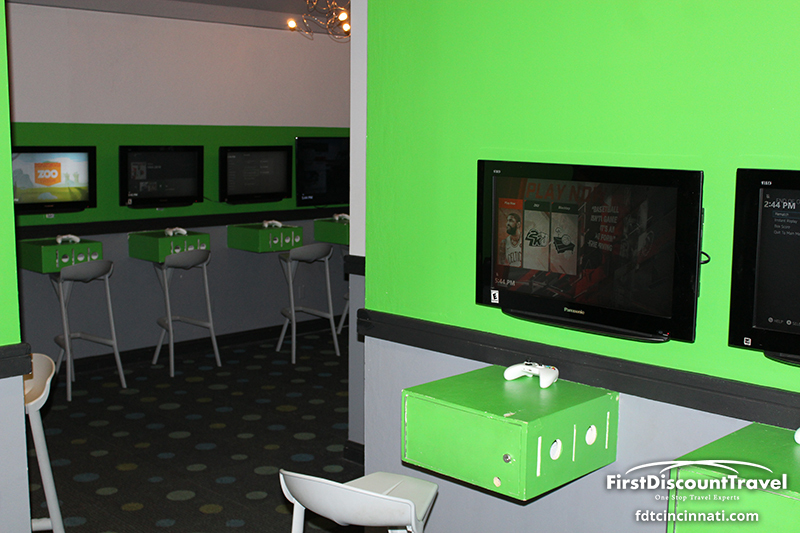 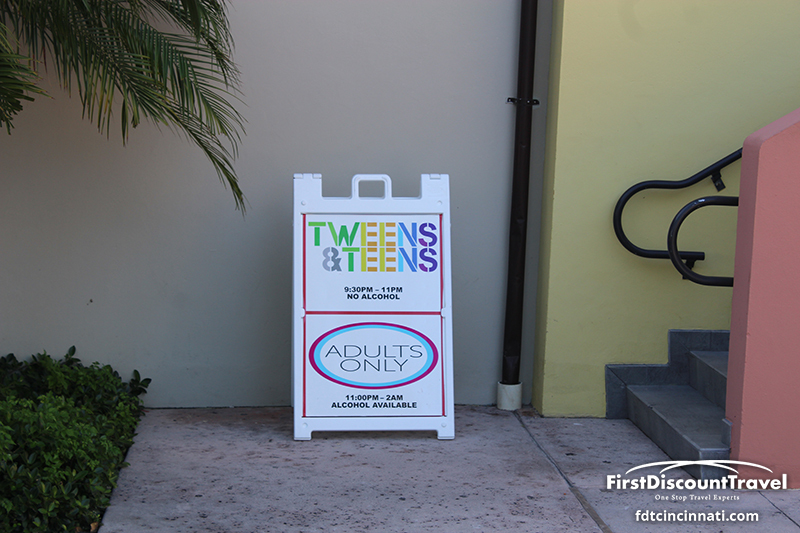 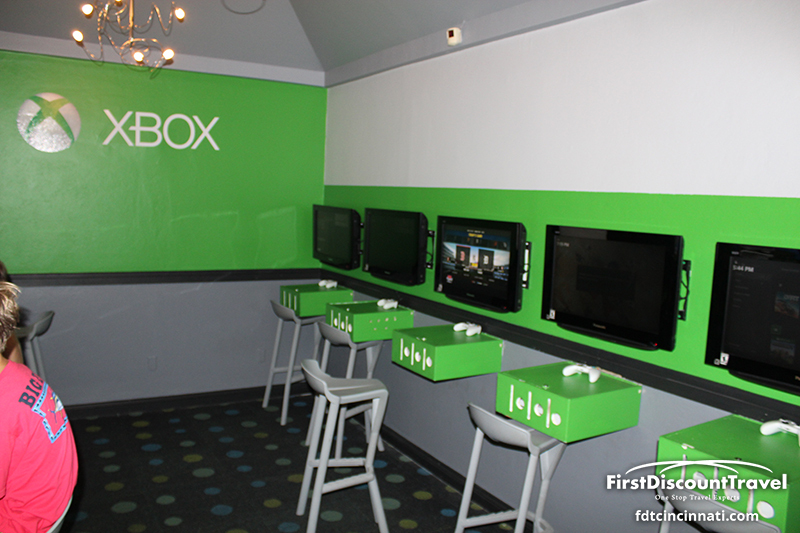 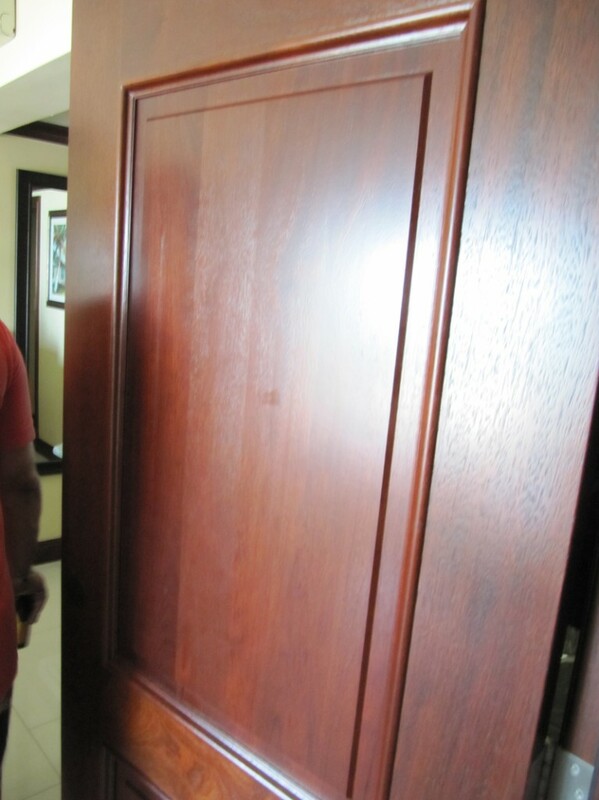 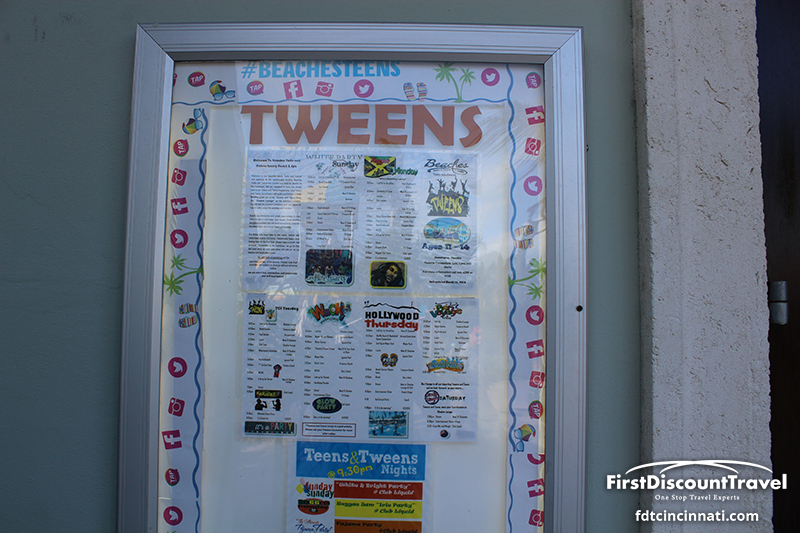 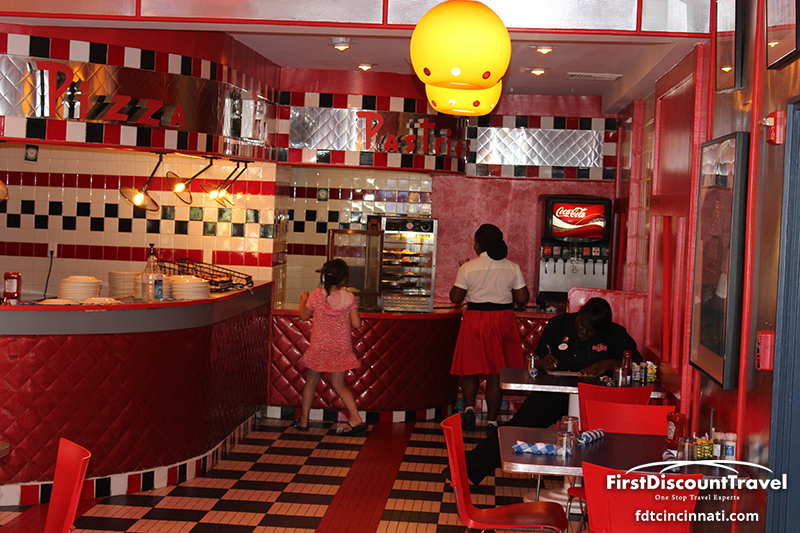 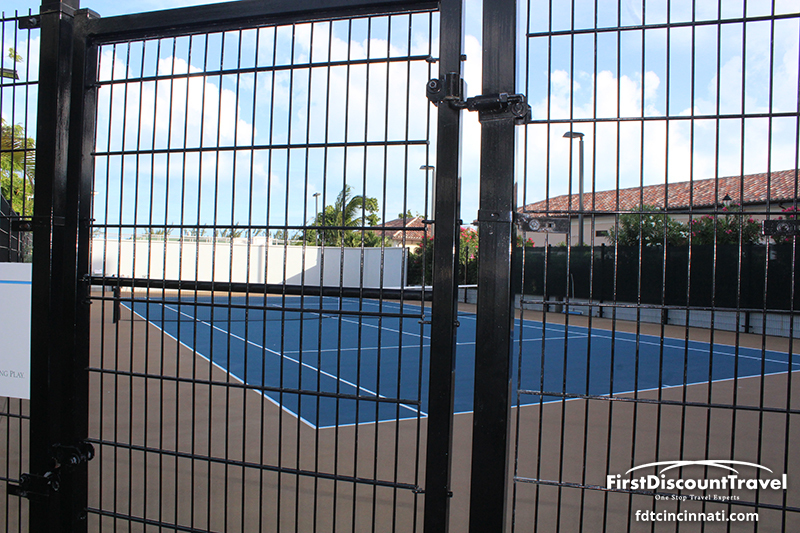 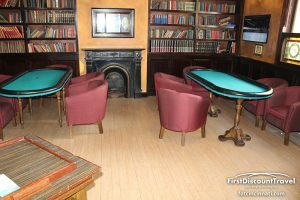 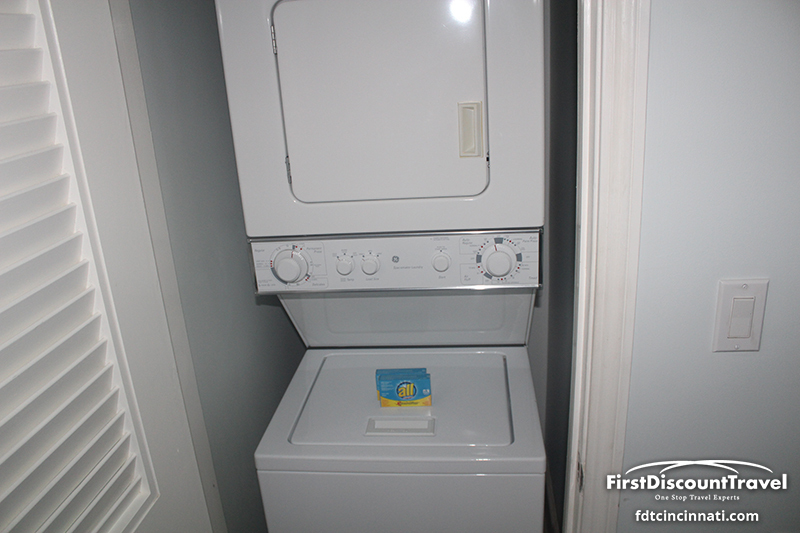 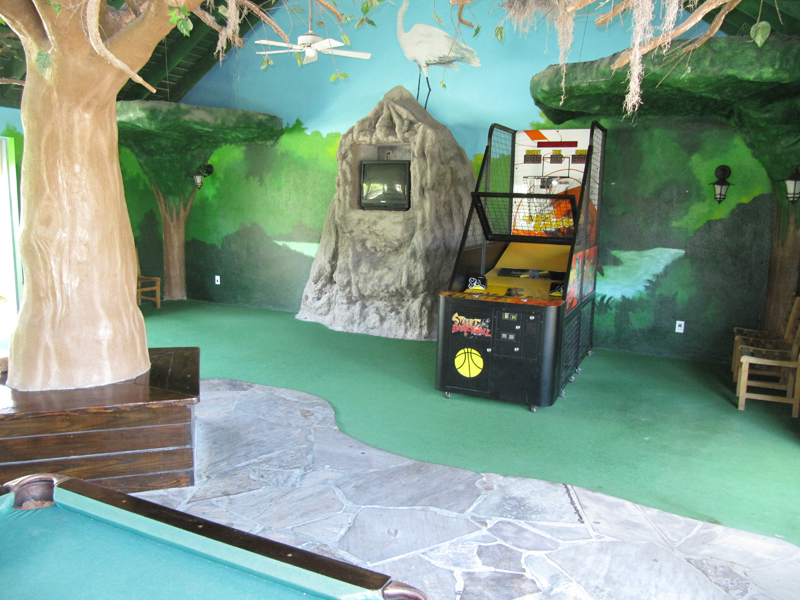 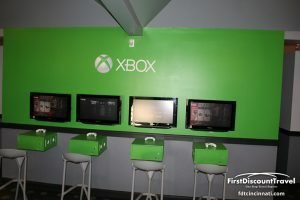 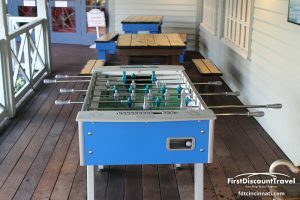 Other children amenities include the Xbox game garage, Club Liquid, teen’s club, children’s club, pool tables, basketball court, ping pong, and more. Sesame Street characters have production shows nightly and the majority of the entertainment is geared towards families. 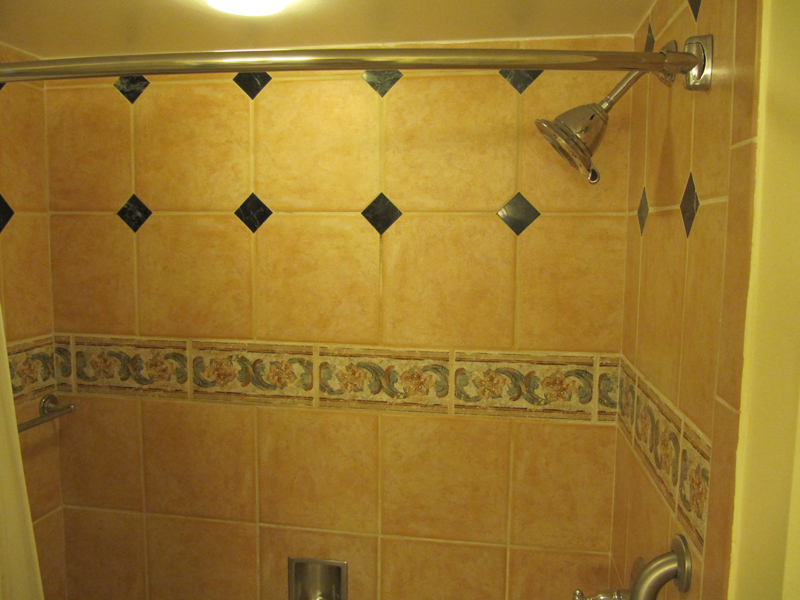 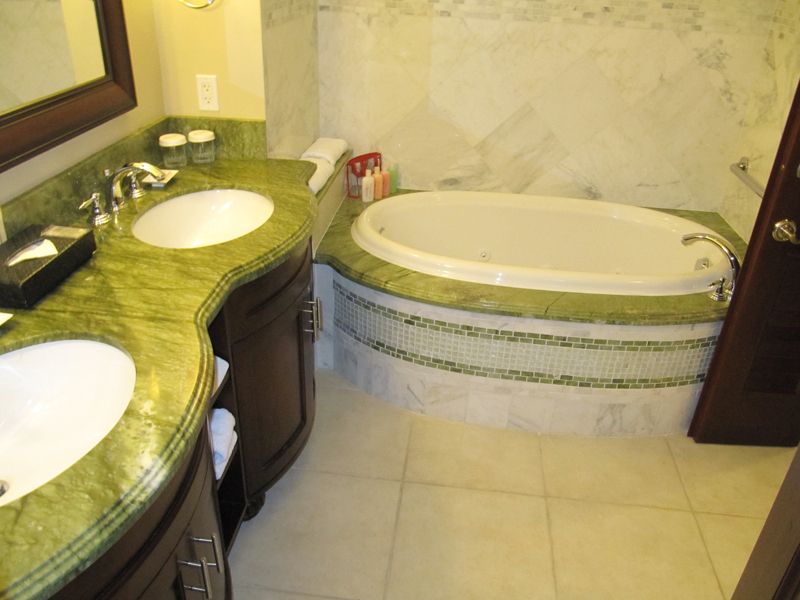 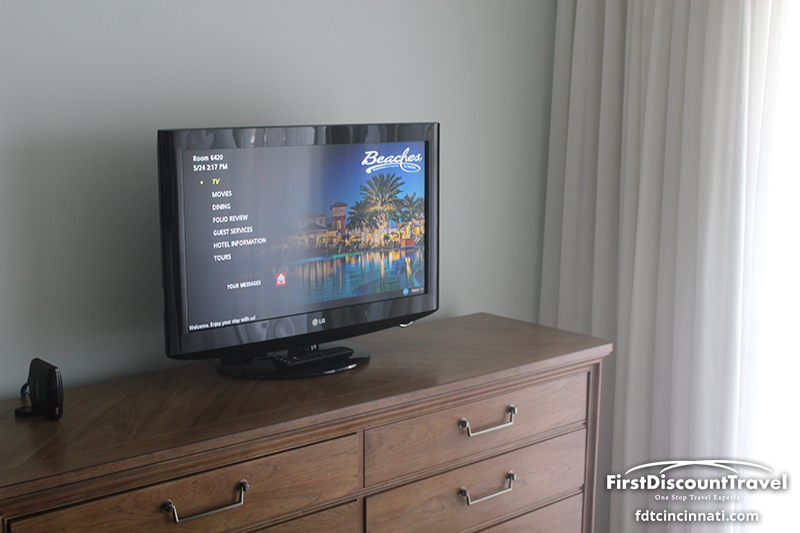 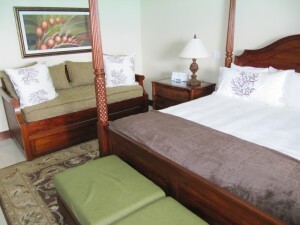 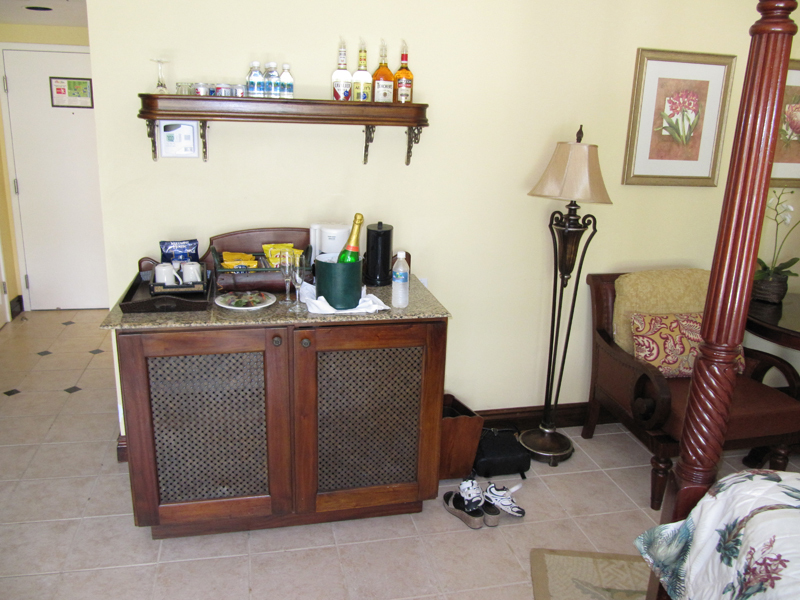 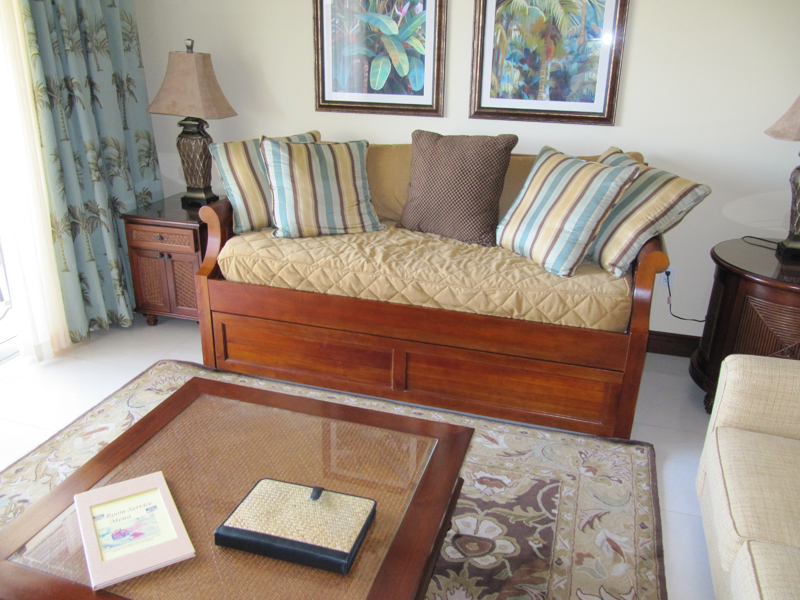 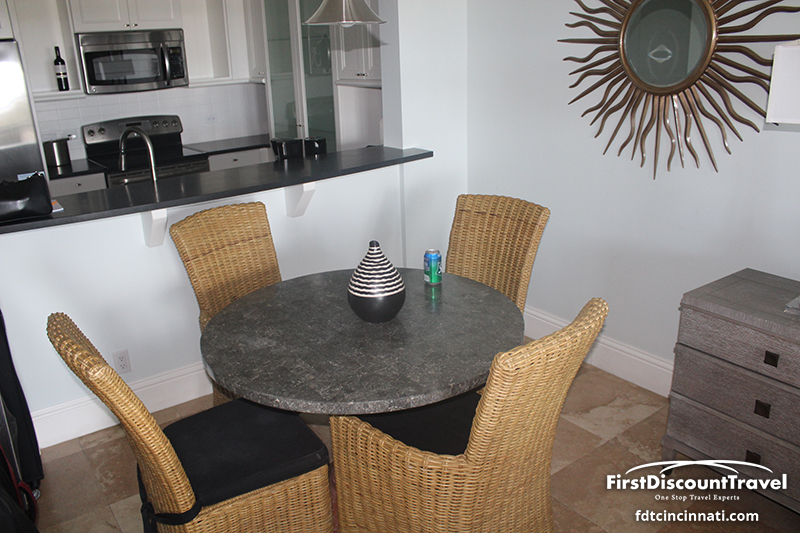 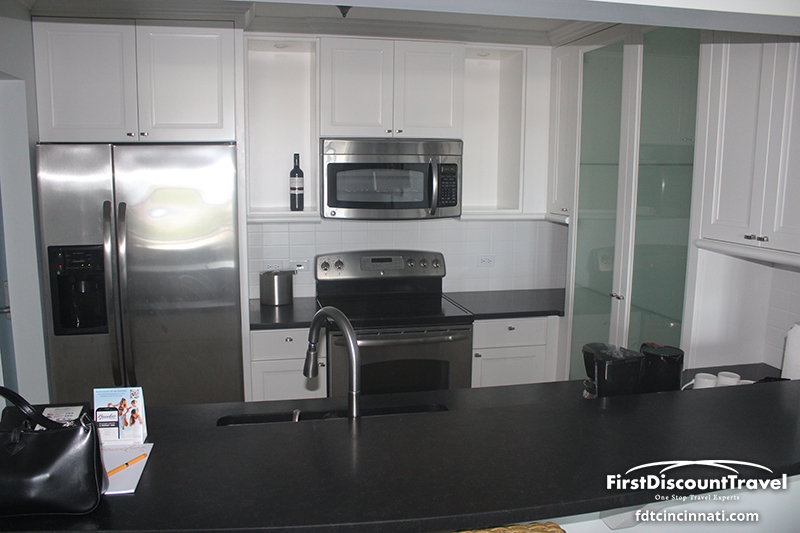 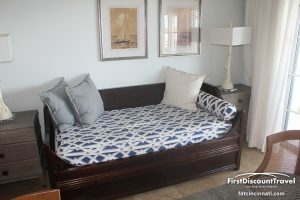 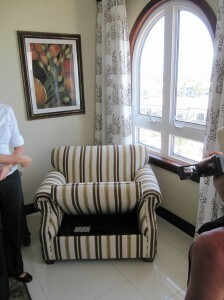 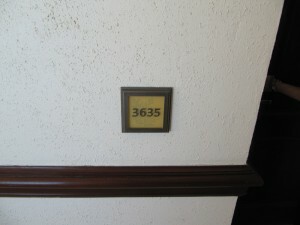 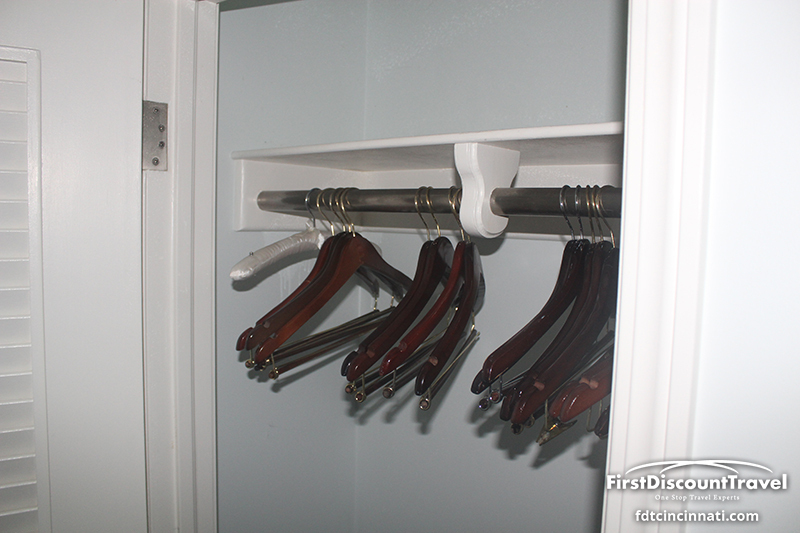 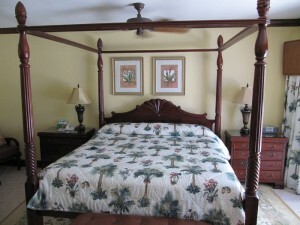 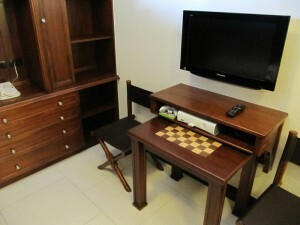 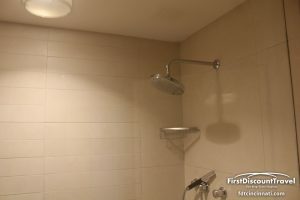 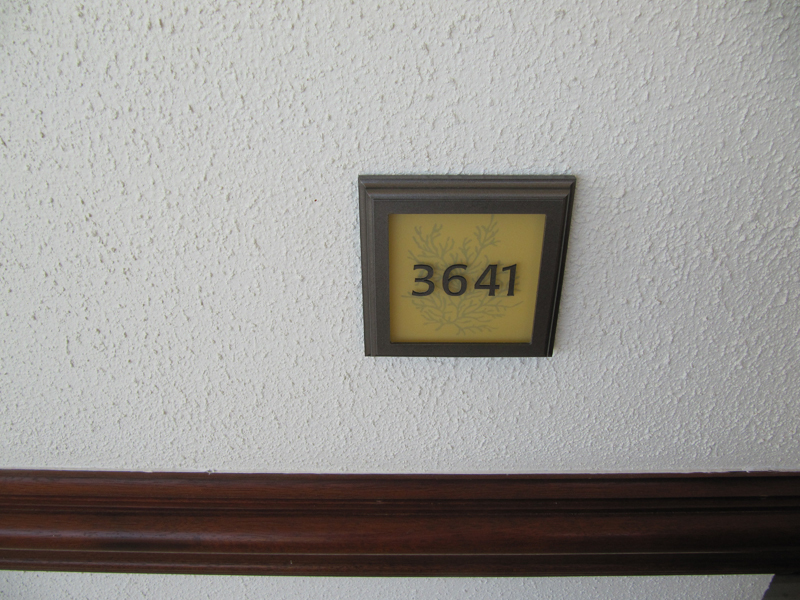 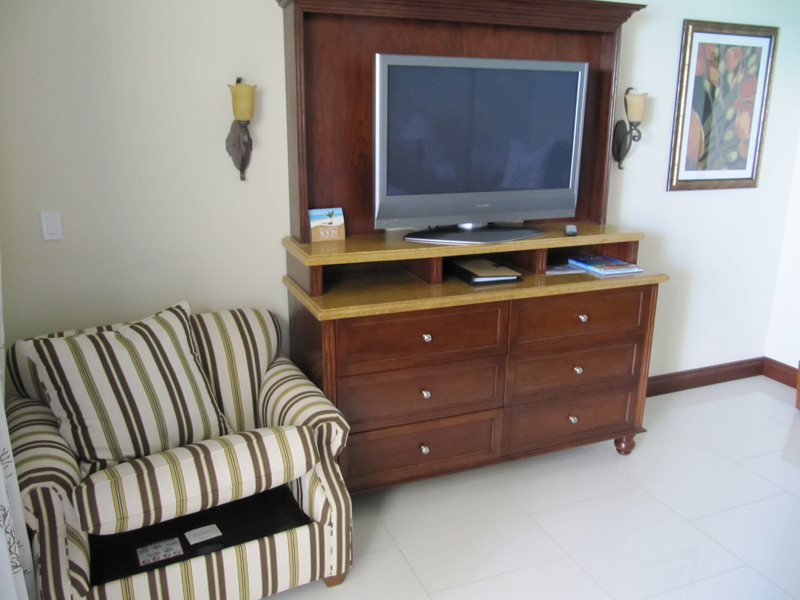 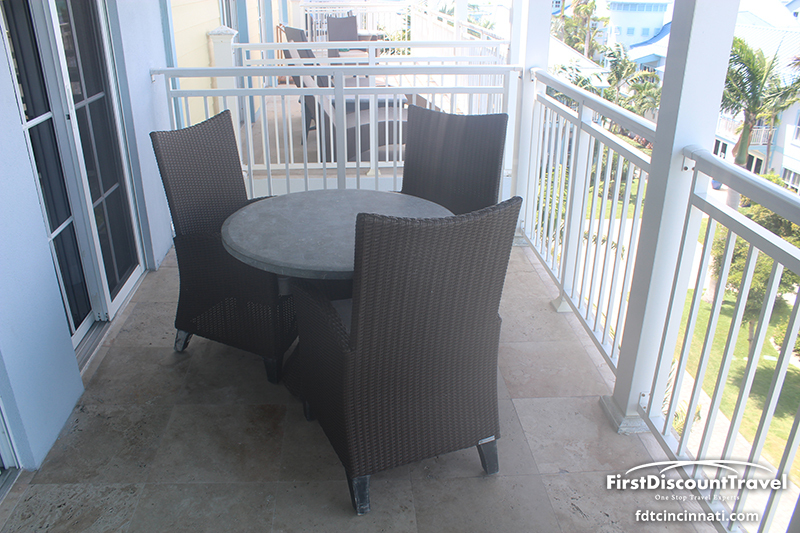 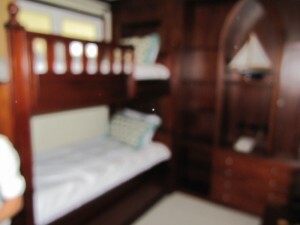 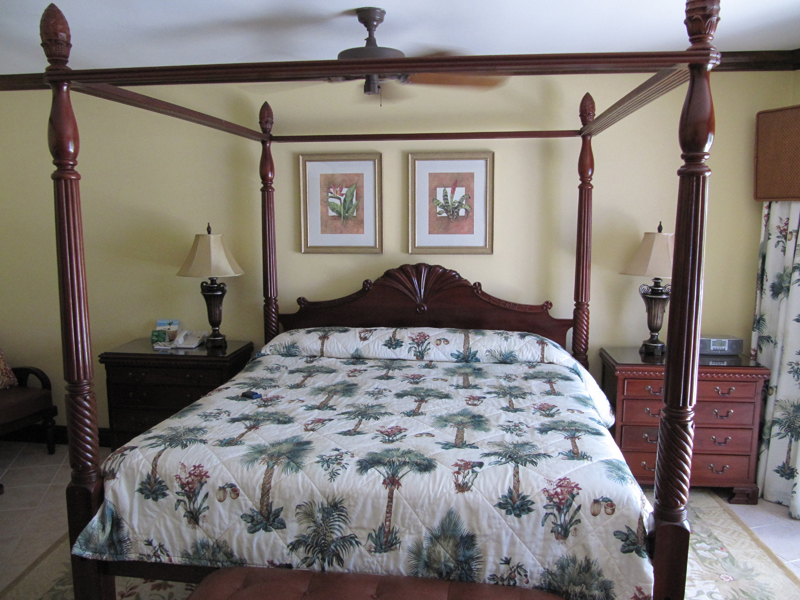 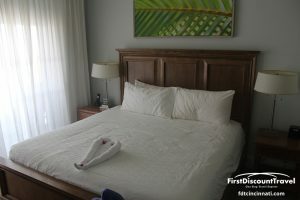 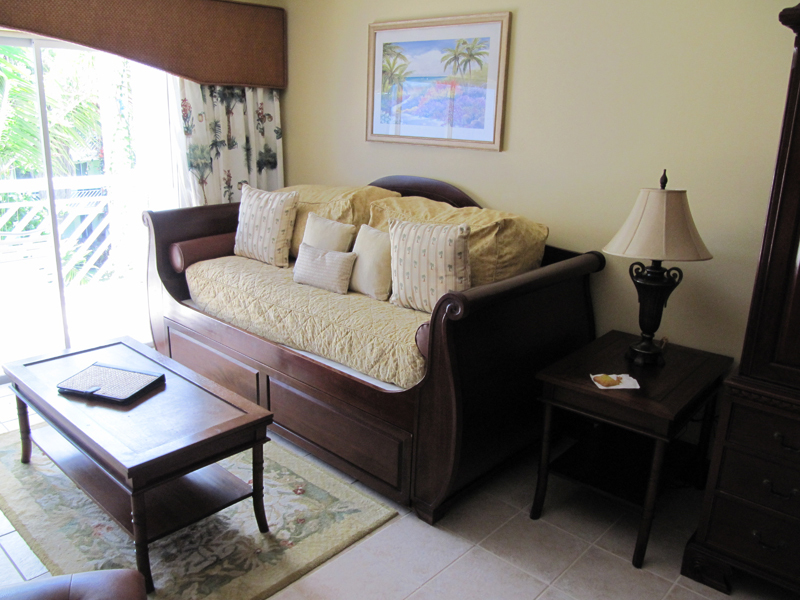 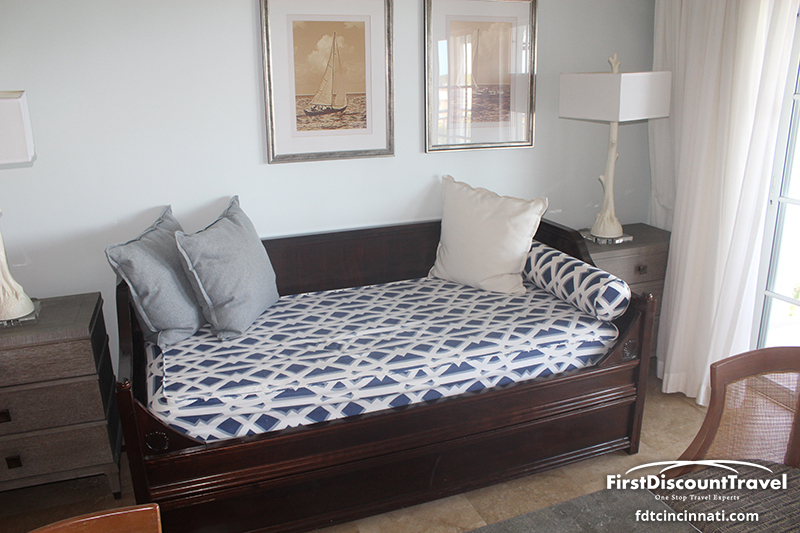 Accommodations range from regular rooms all the way up to multiple bedroom butler serviced suites! 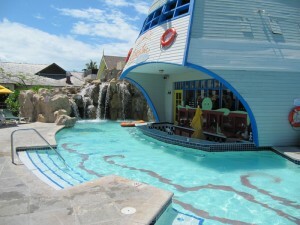 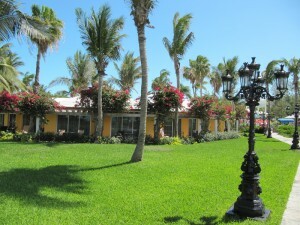 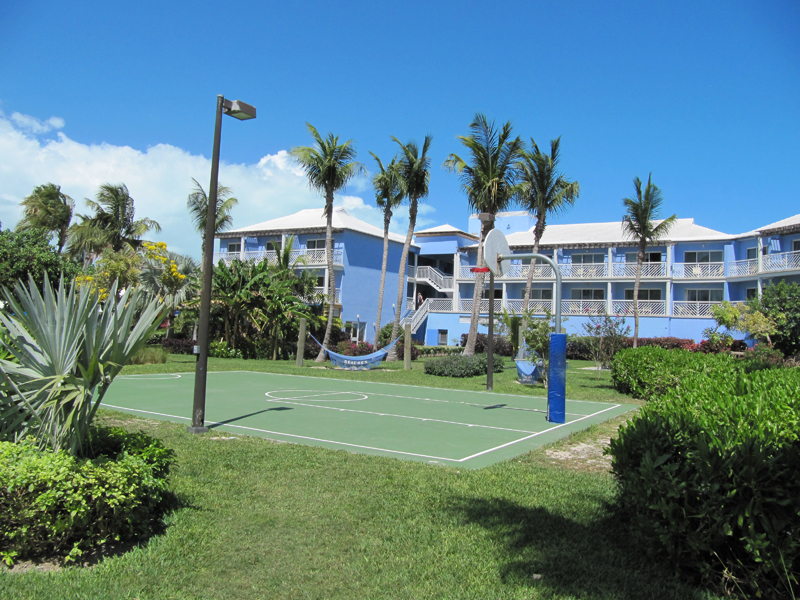 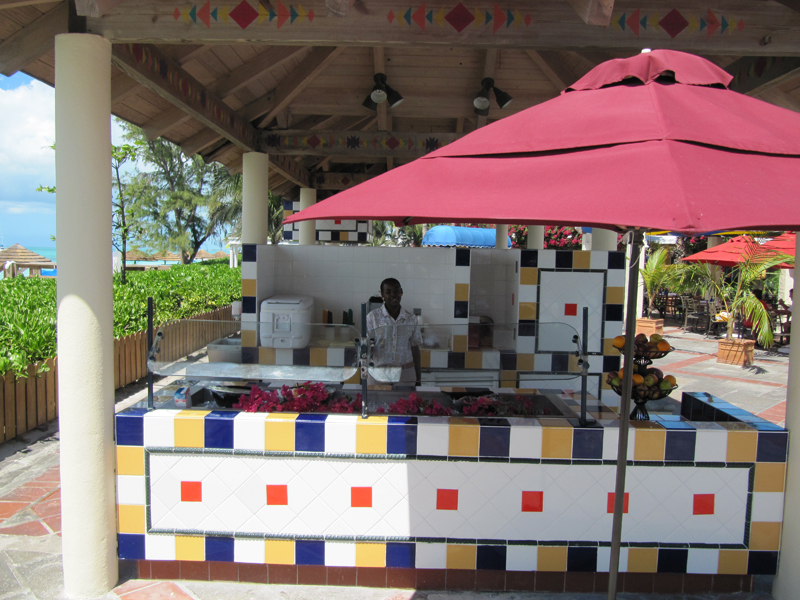 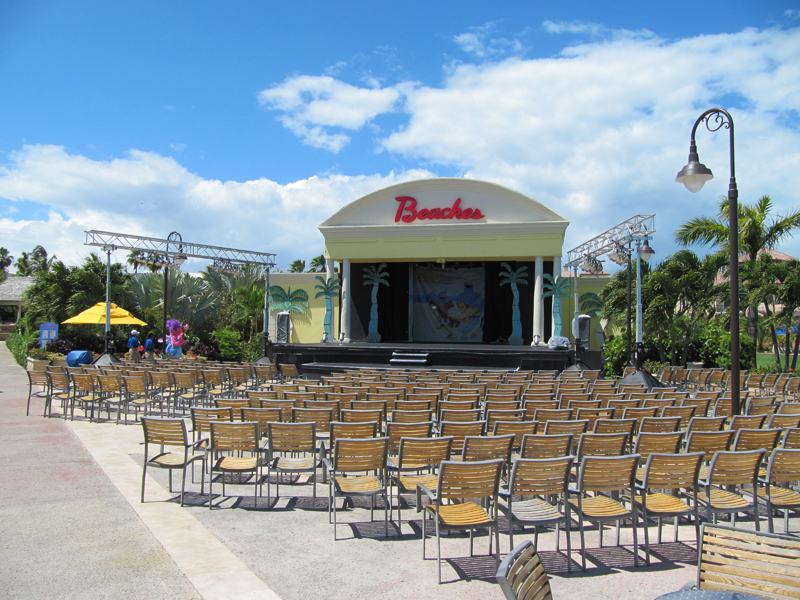 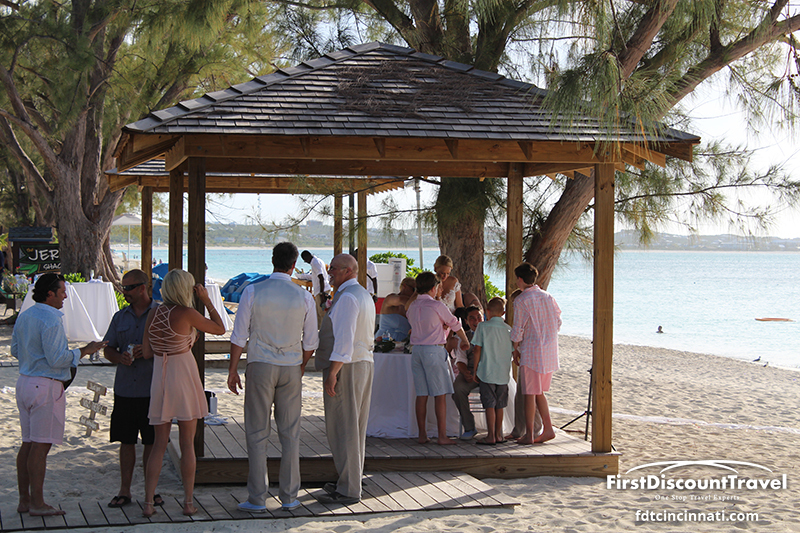 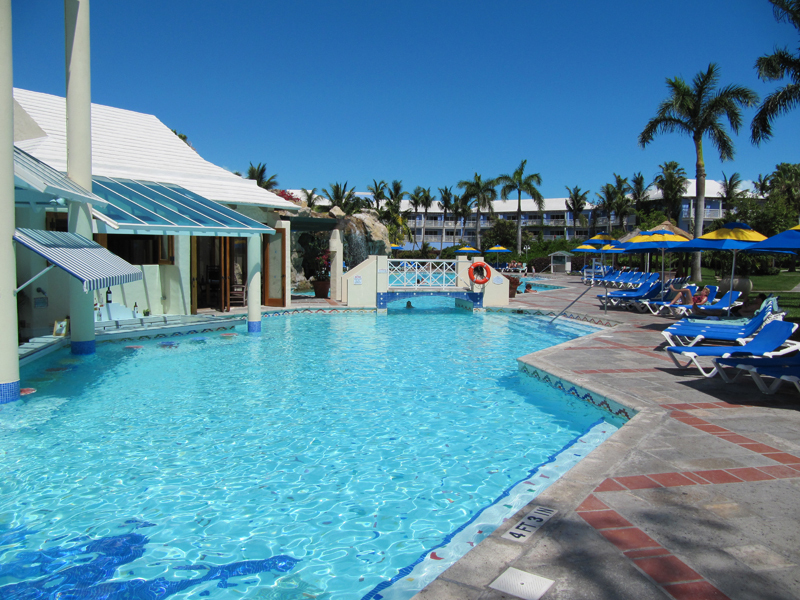 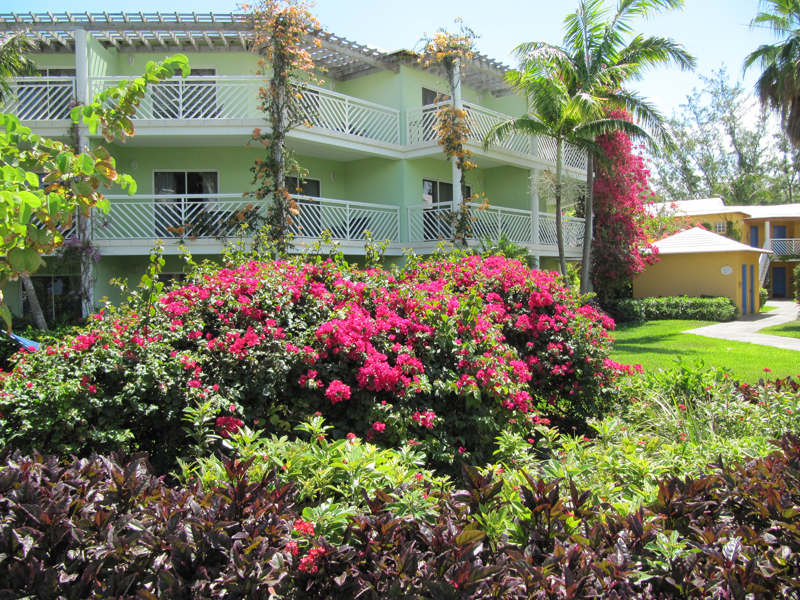 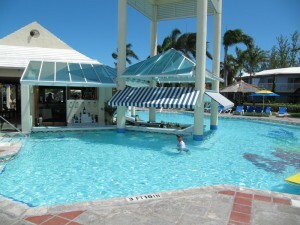 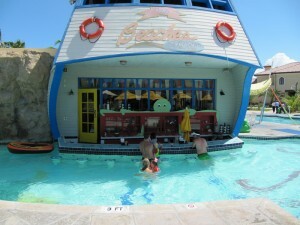 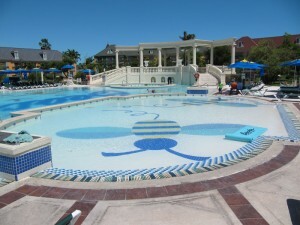 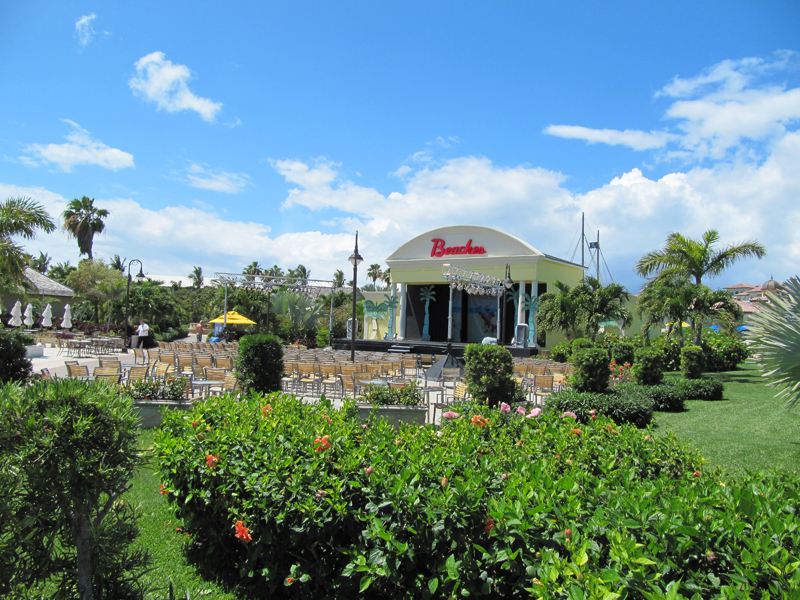 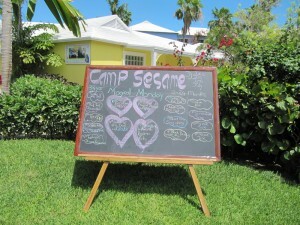 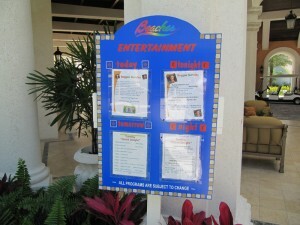 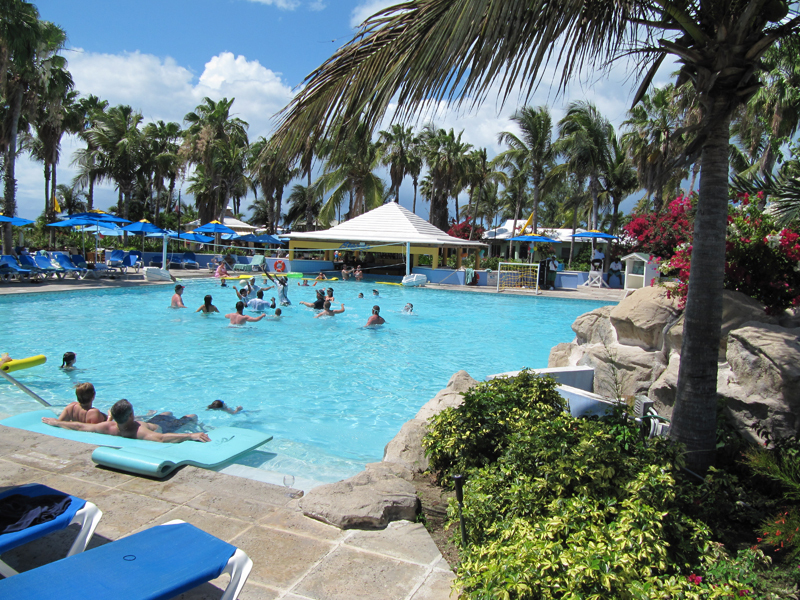 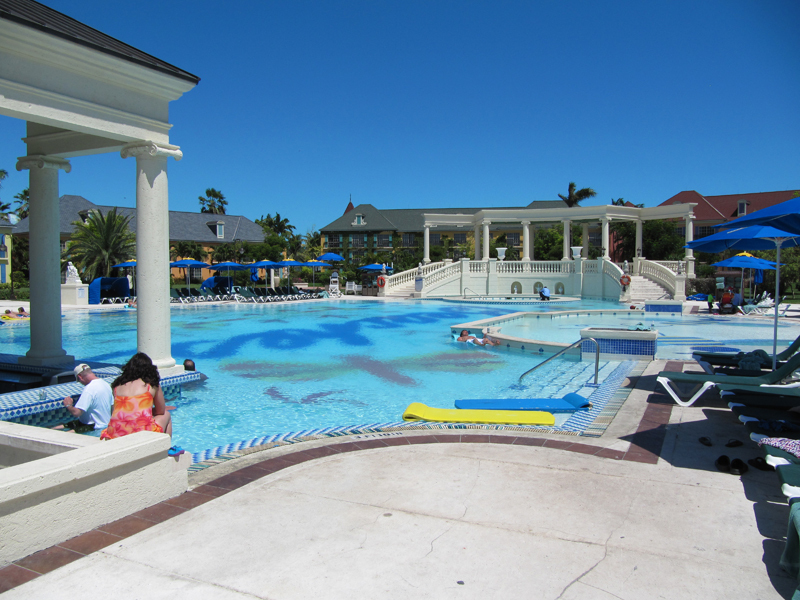 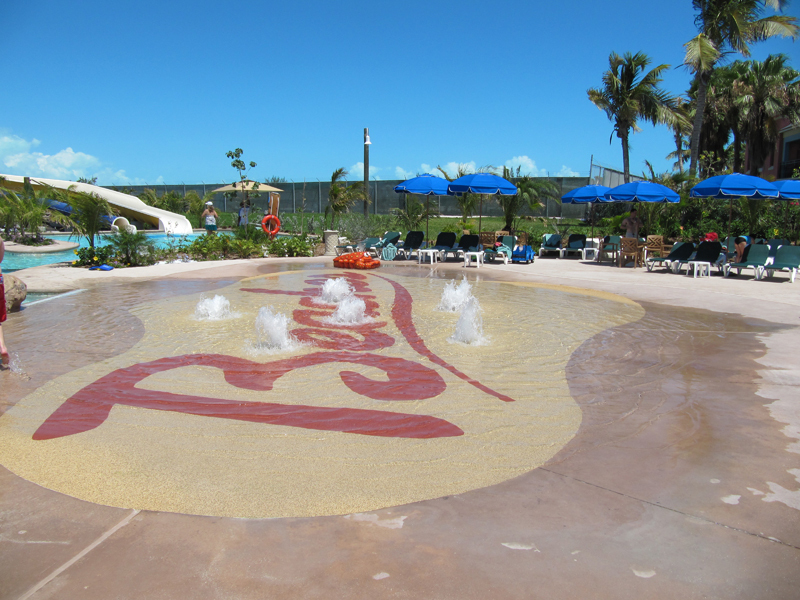 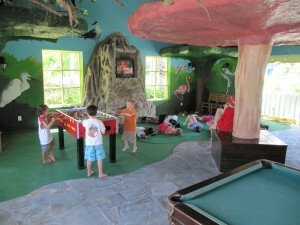 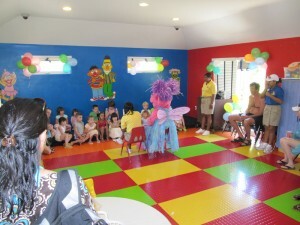 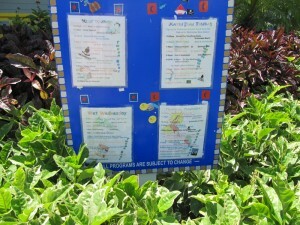 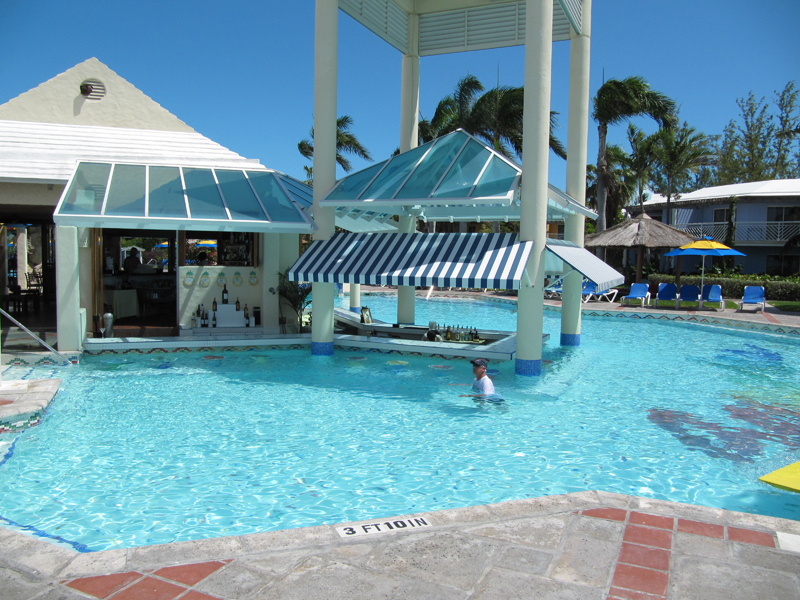 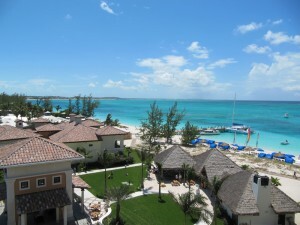 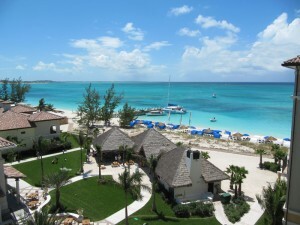 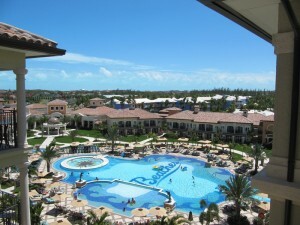 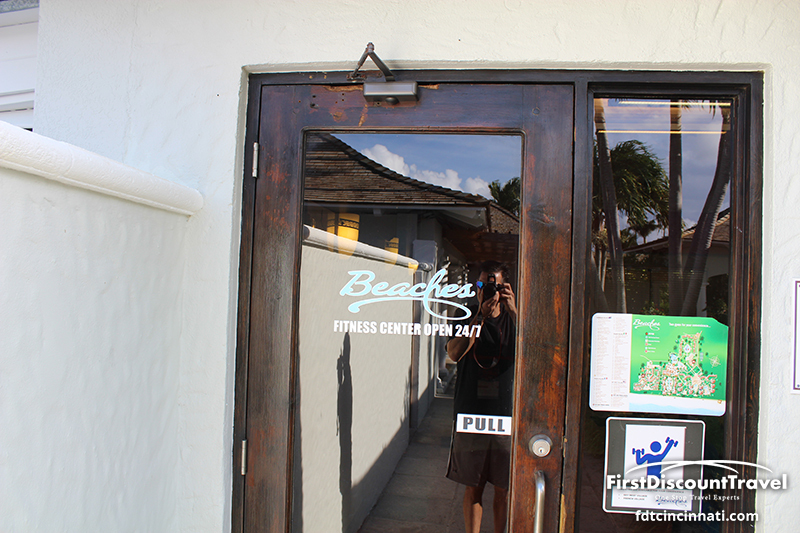 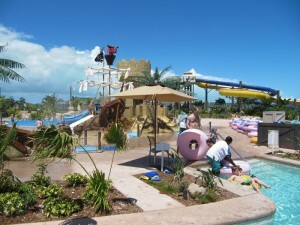 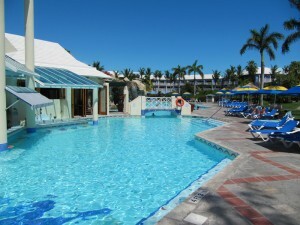 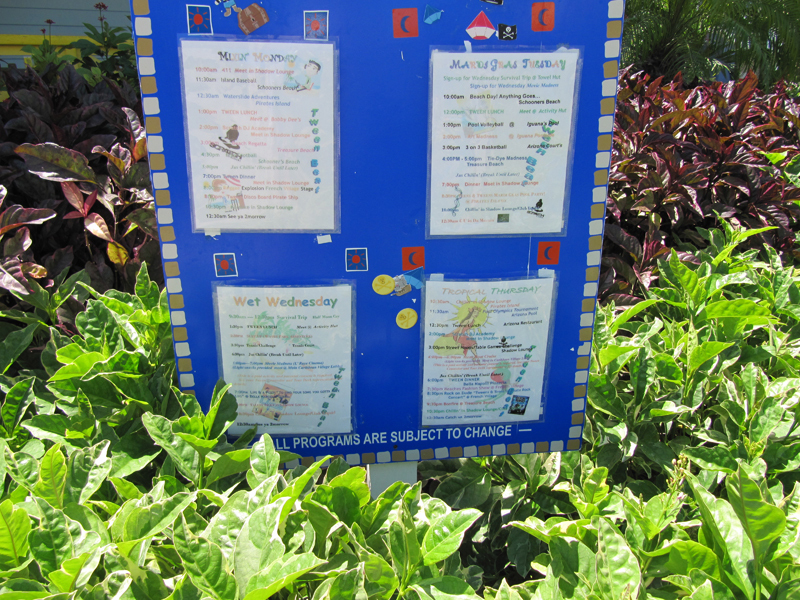 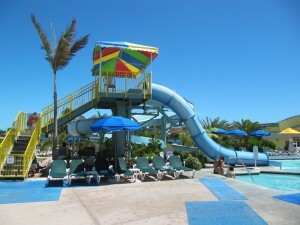 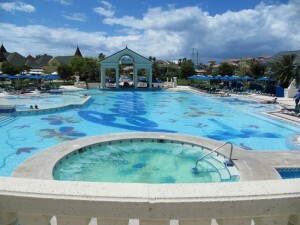 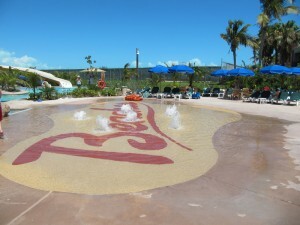 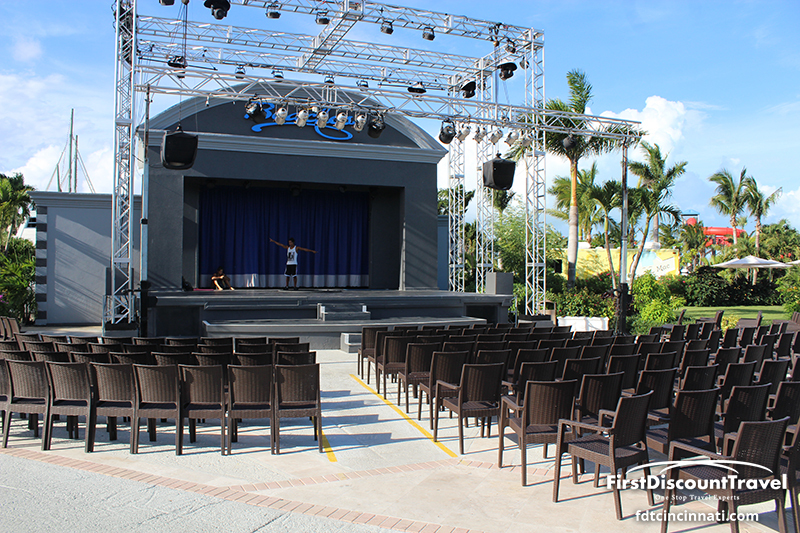 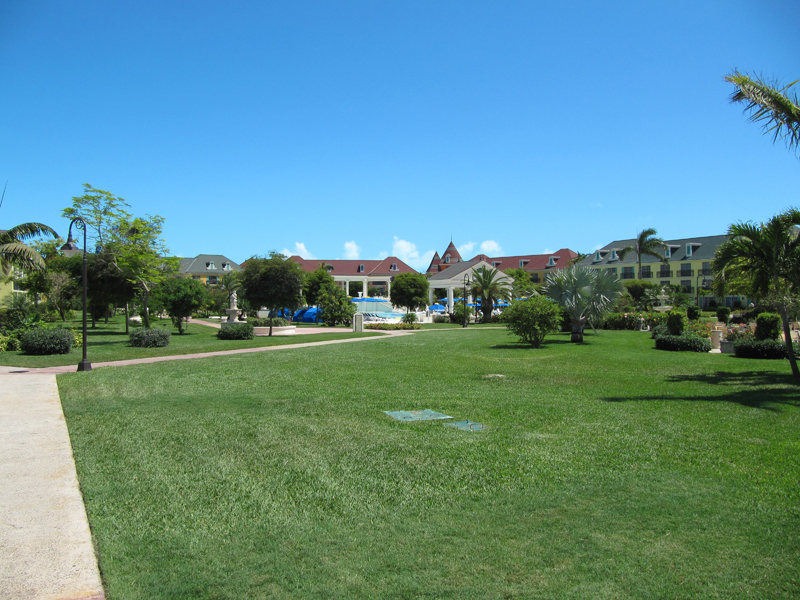 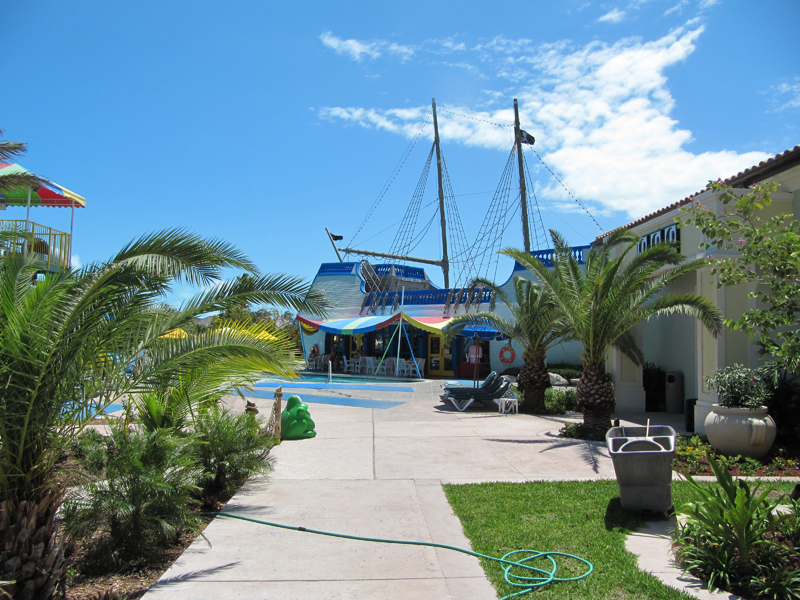 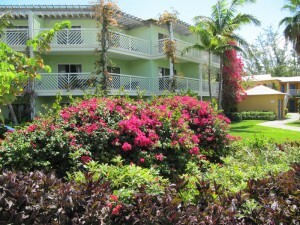 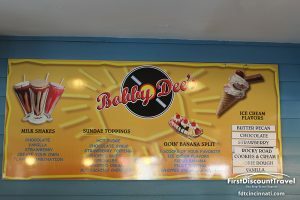 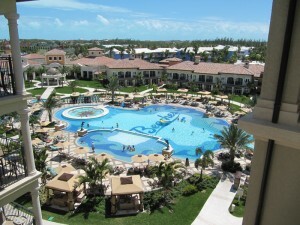 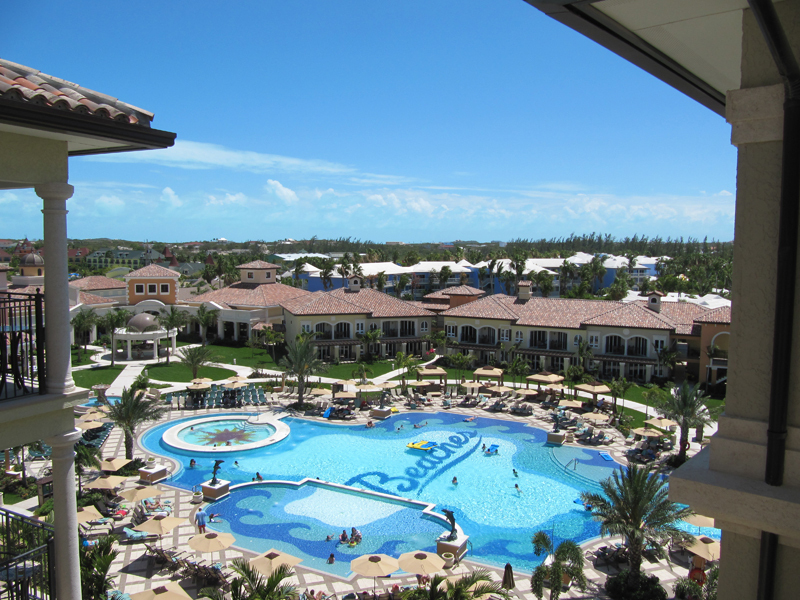 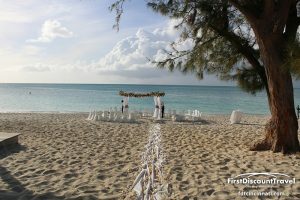 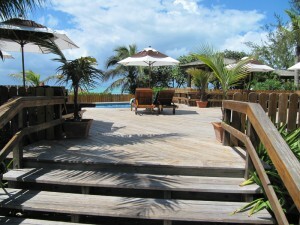 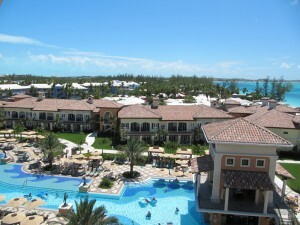 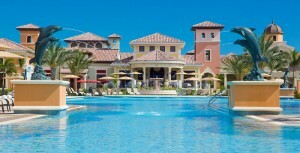 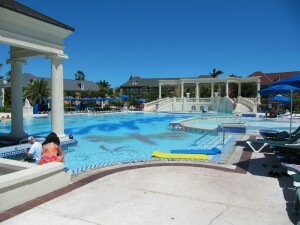 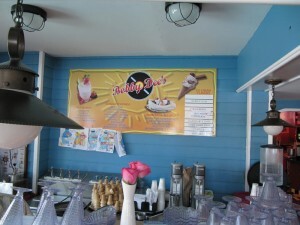 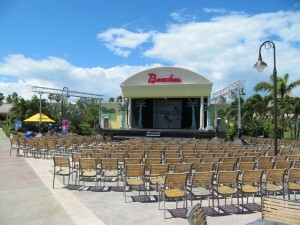 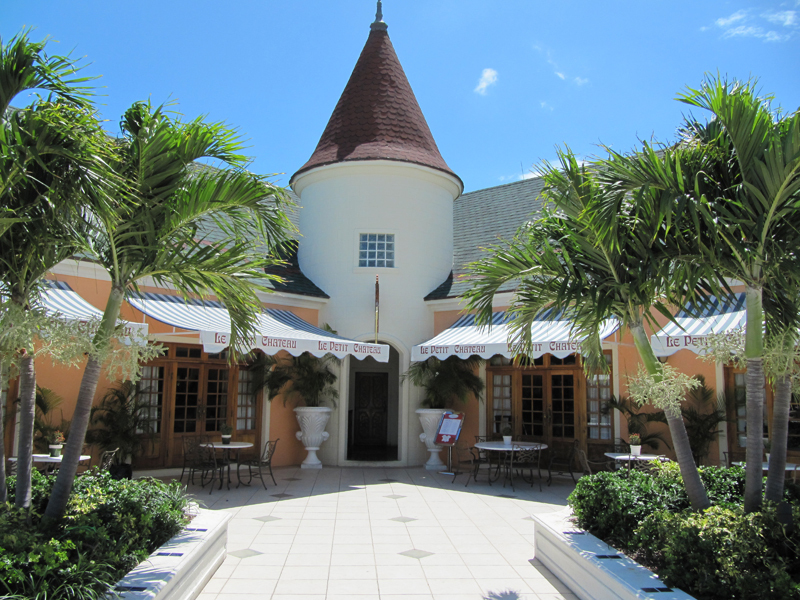 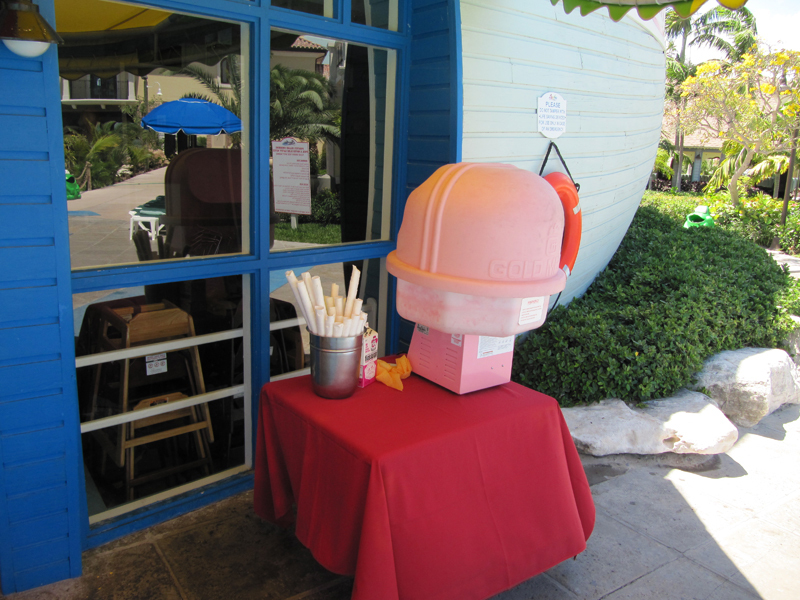 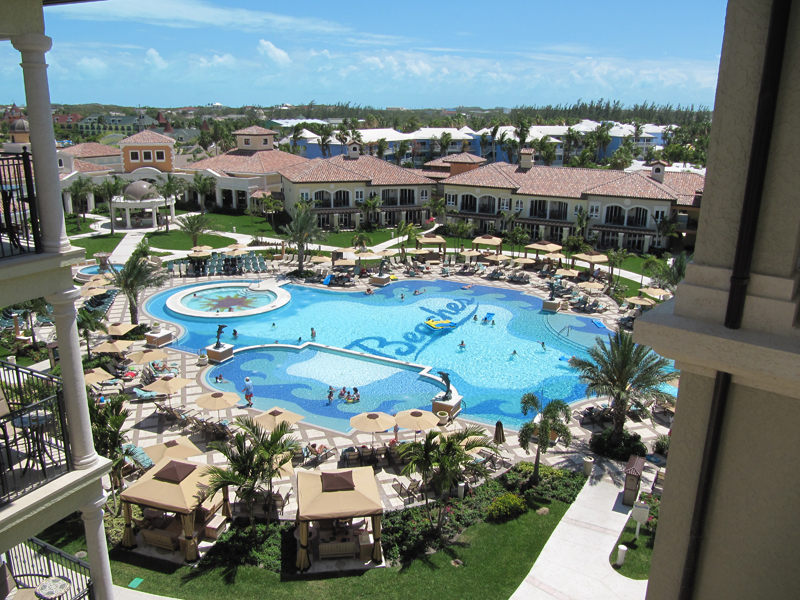 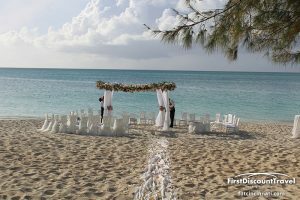 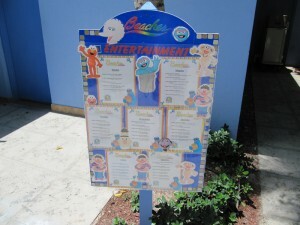 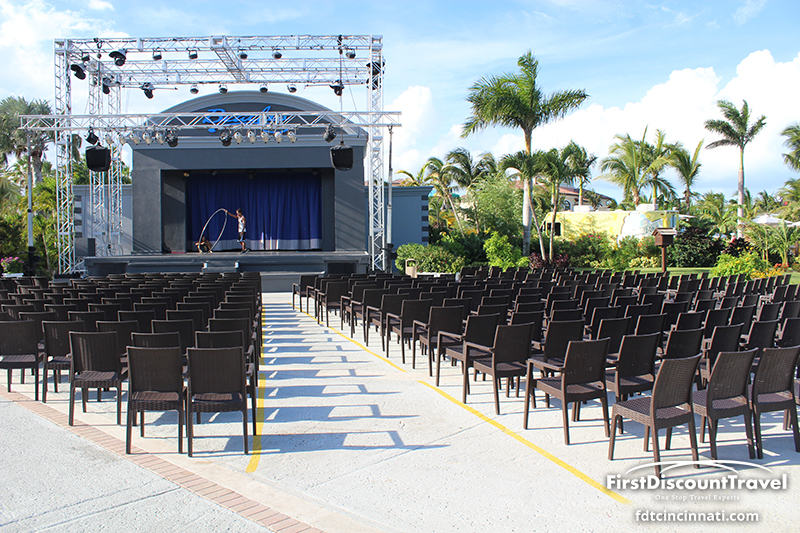 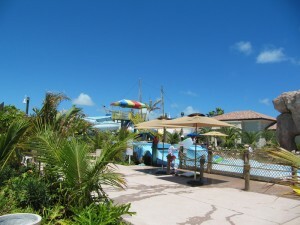 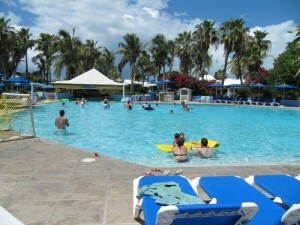 Beaches Turks and Caicos is heads and tails my favorite family friendly resort in the world! 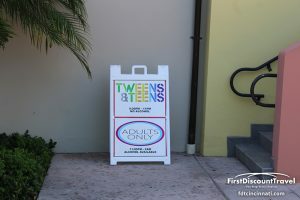 If you have older children (teens), the Atlantis might be a better fit.